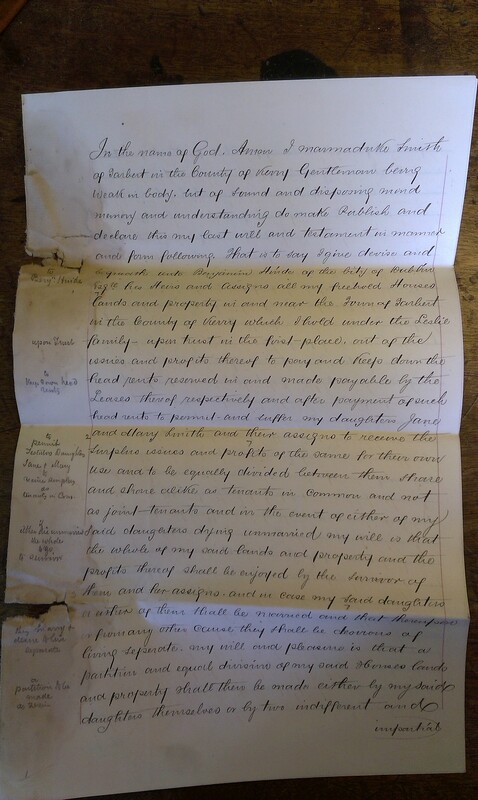 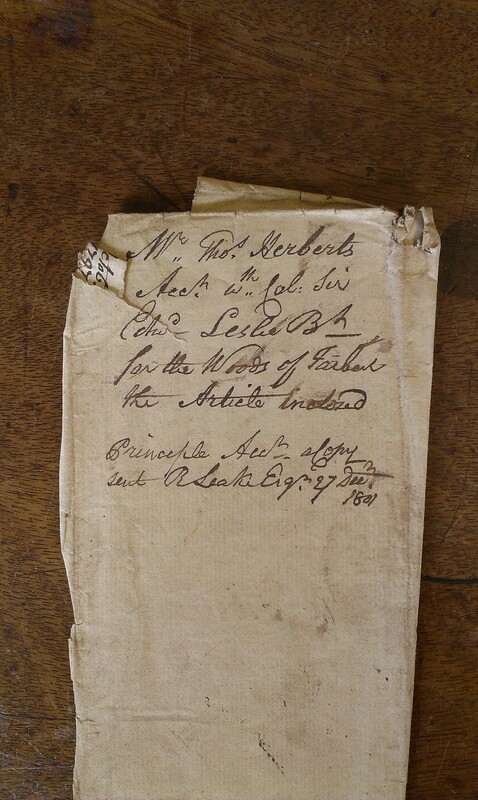 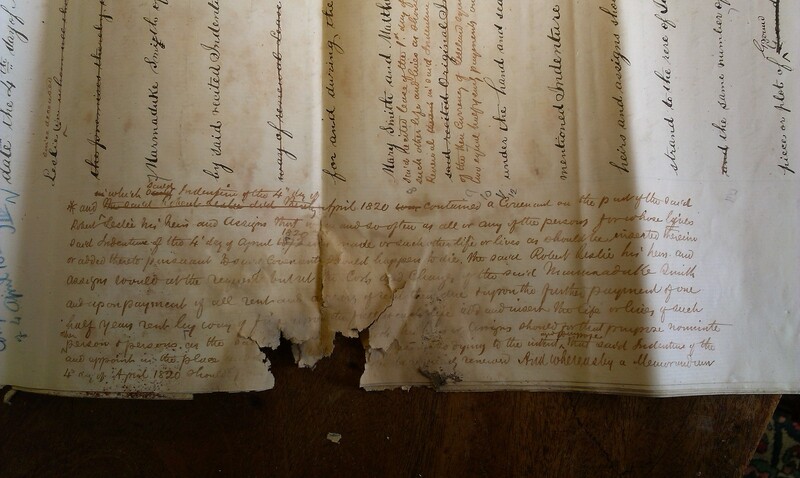 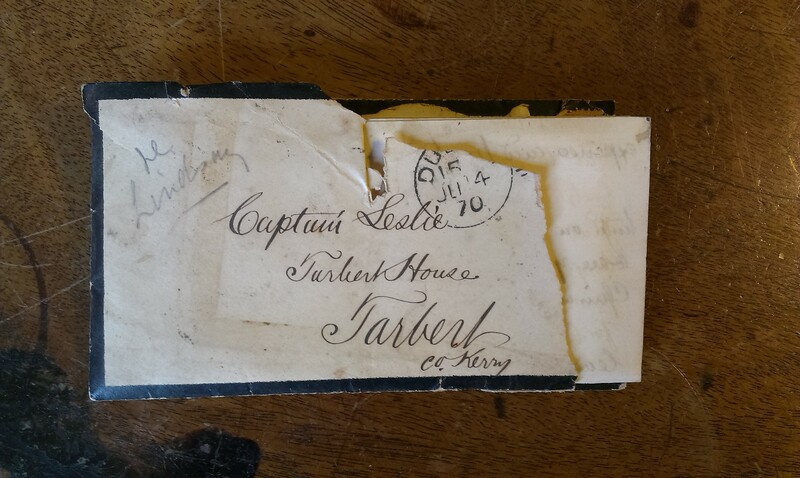 A selection of letters, deeds and papers of the family of Leslie of Tarbert. 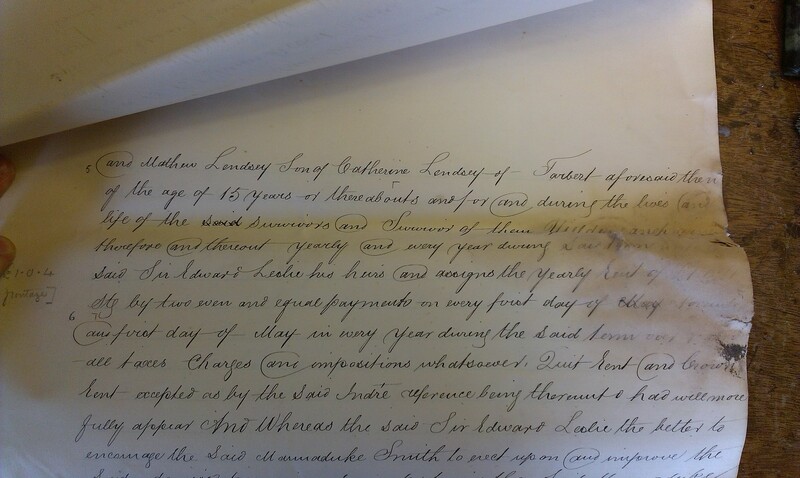 Focusing on the Lindsay family. 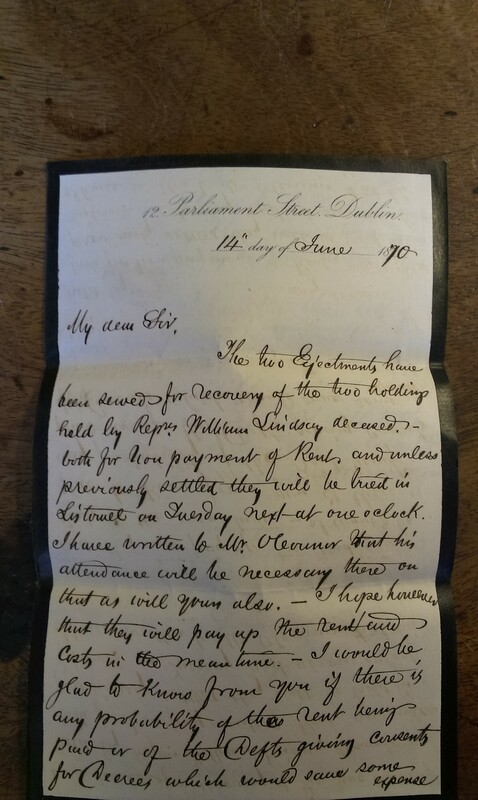 [Note of Jan 1786] shows Joseph Lindsay of Tarbert trying to collect a debt on 5 Dec 1785 in Co.Limerick on behalf of "Edward Leslie, Esq" (the Baronet before his title in 1787) as his agent. 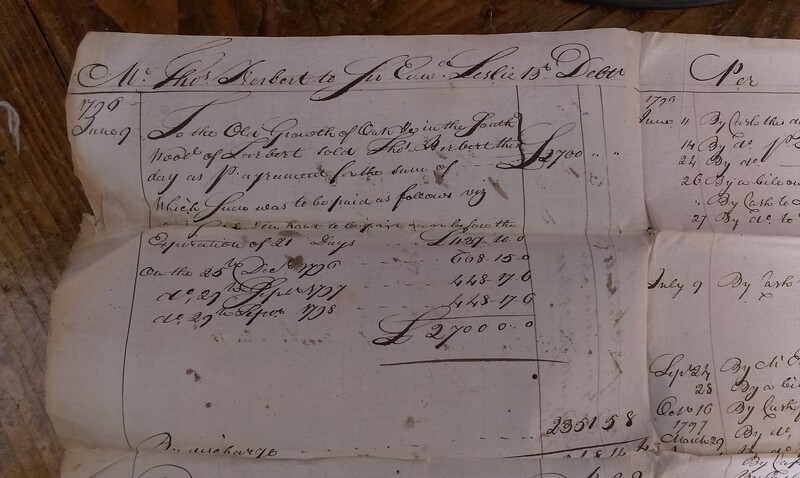 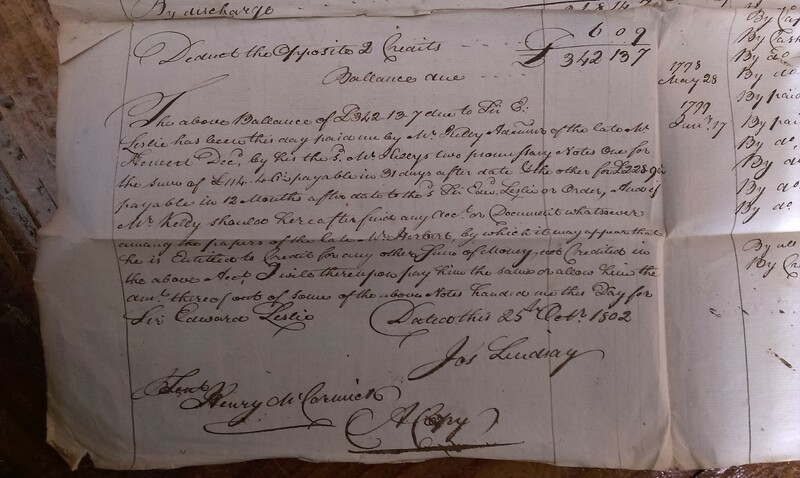 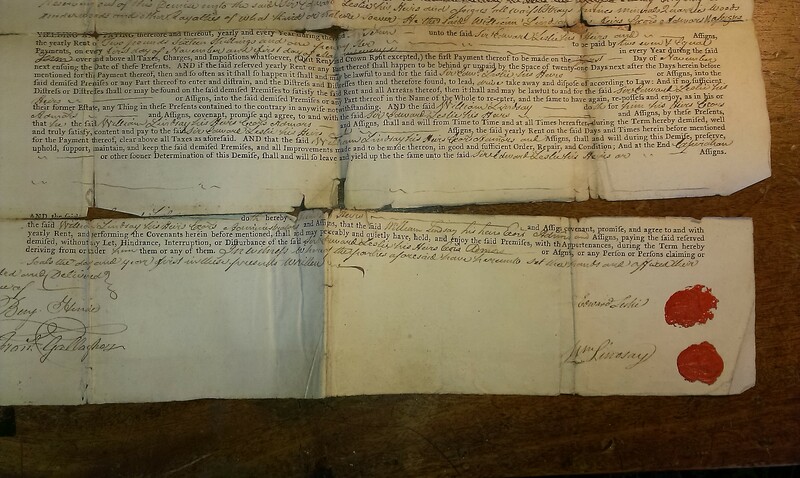 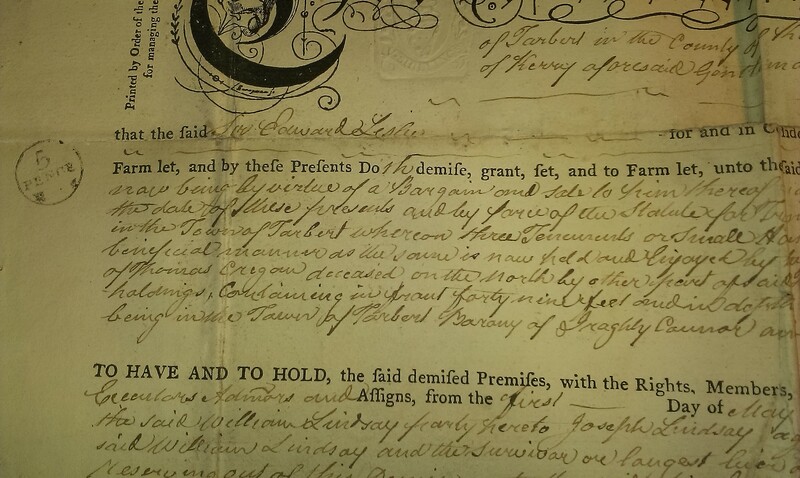 Note of 25 Jan 1786 showing Joseph Lindsay collecting a debt in Co.Limerick for Edward Leslie (the Baronet before his title in 1787). 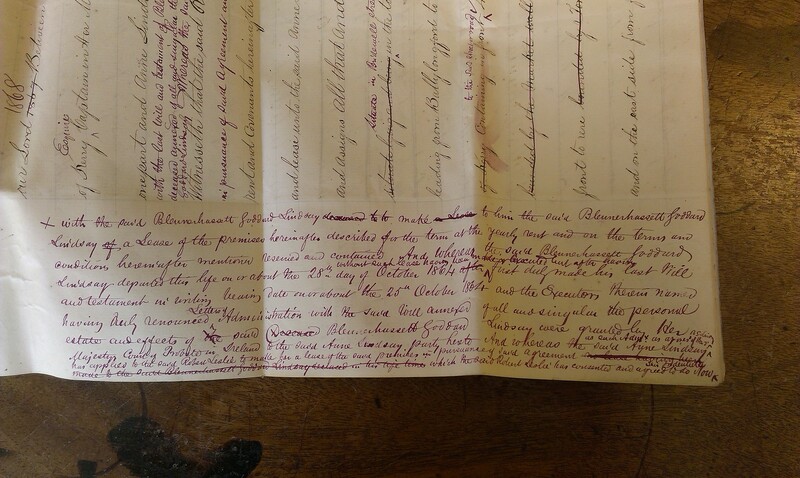 See front and back and side note. 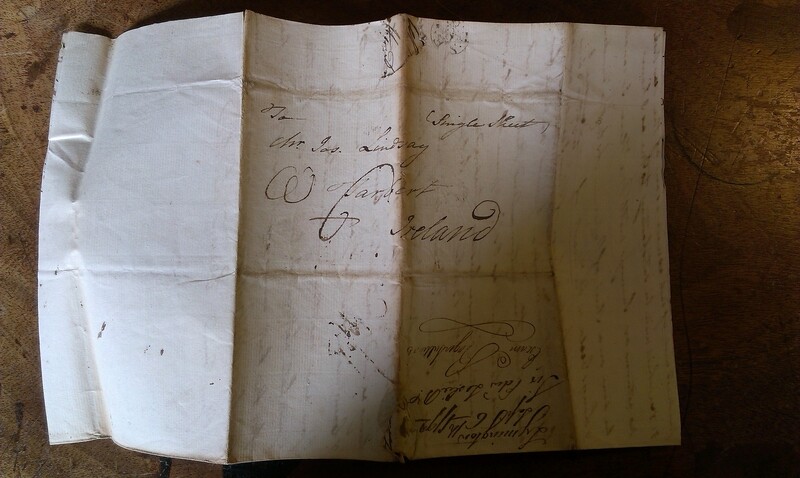 Letter from Sir Edward Leslie to Joseph Lindsay in Tarbert, 6 Sept 1792. 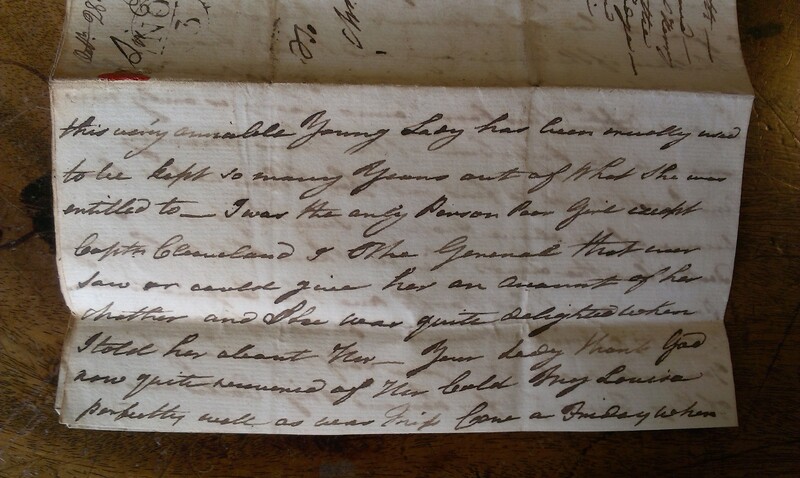 When writing to Joseph Lindsay, "Your Lady" is how he refers to his own wife, Lady Leslie. 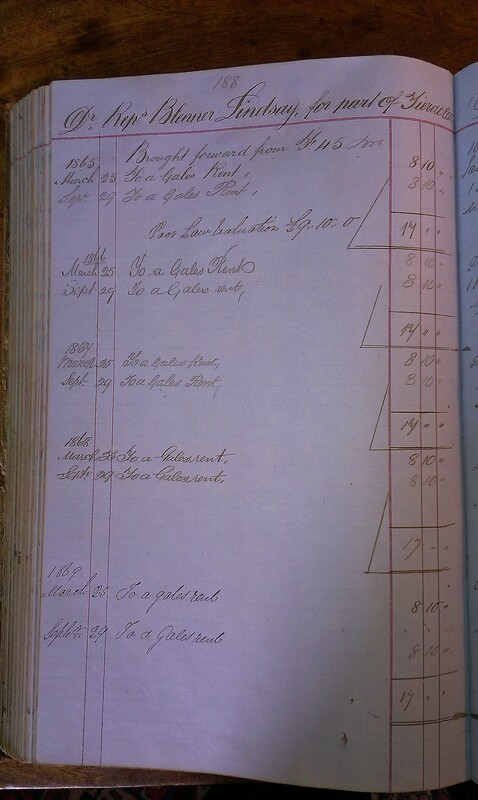 See cover and p.1 top and p.1 middle and p.1 bottom. 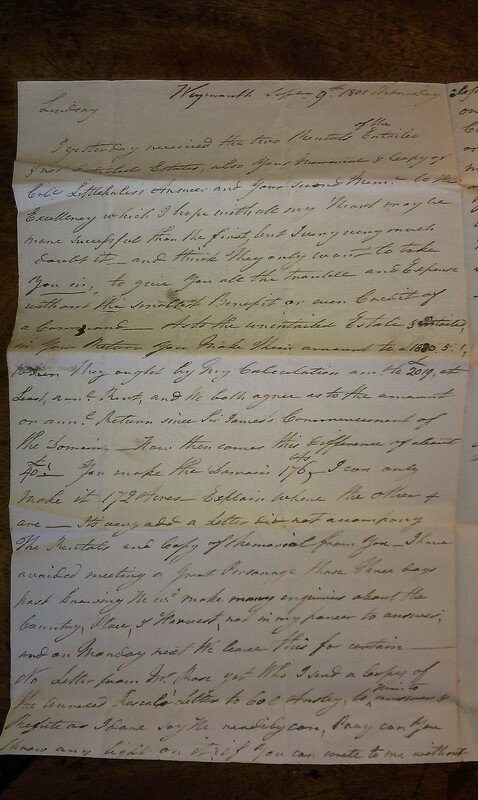 See p.2 top and p.2 middle and p.2 bottom. 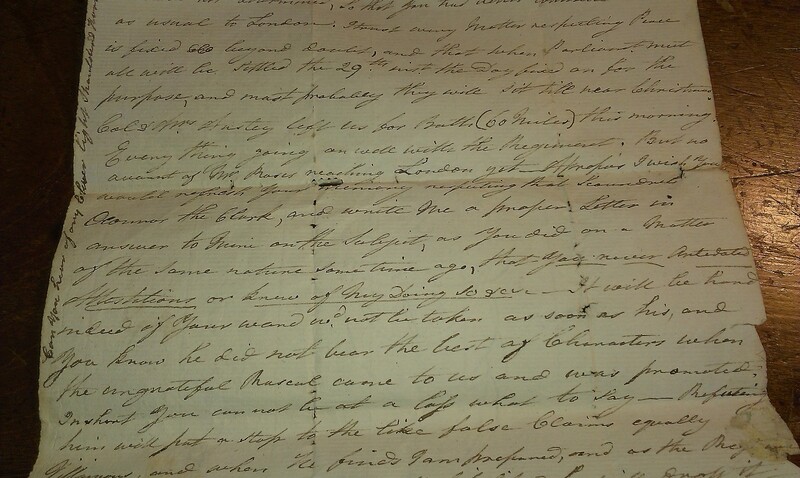 See p.3 top and p.3 bottom. 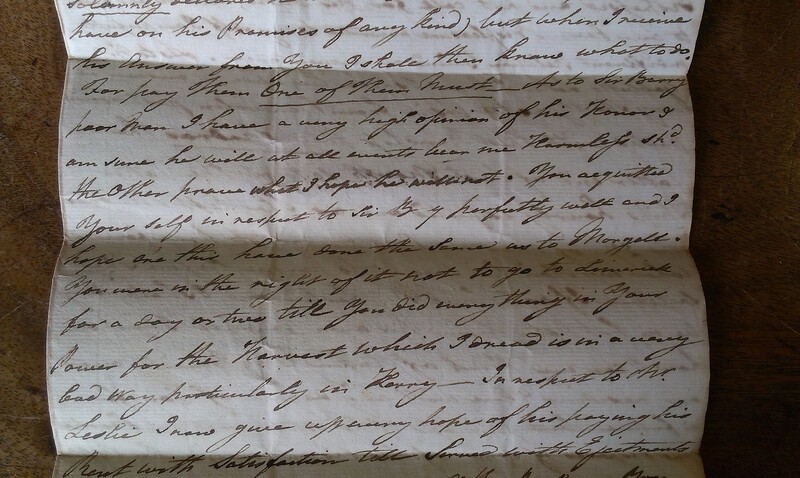 Letter from Sir Edward Leslie to Joseph Lindsay in Tarbert, 28 Oct 1793. 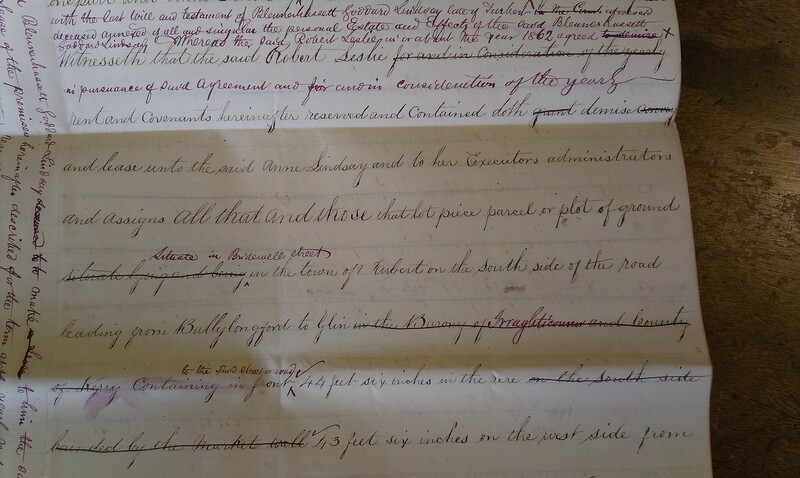 See p.3 top and p.3 middle and p.3 bottom. 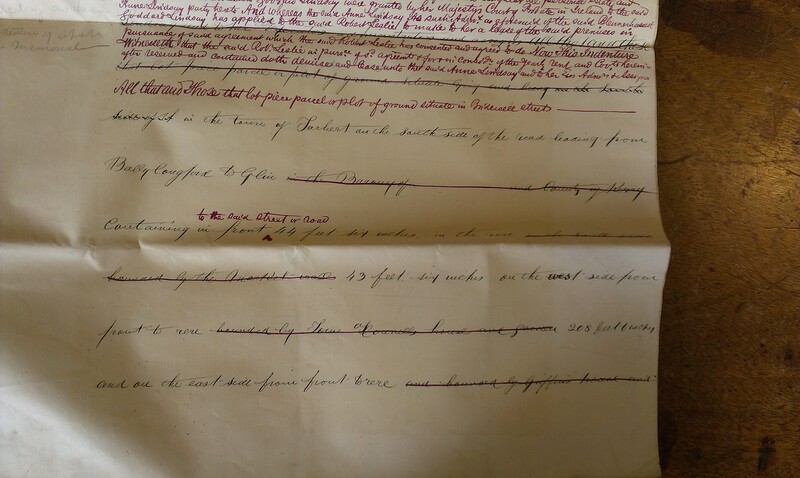 See p.4 top and p.4 bottom and p.4 side. 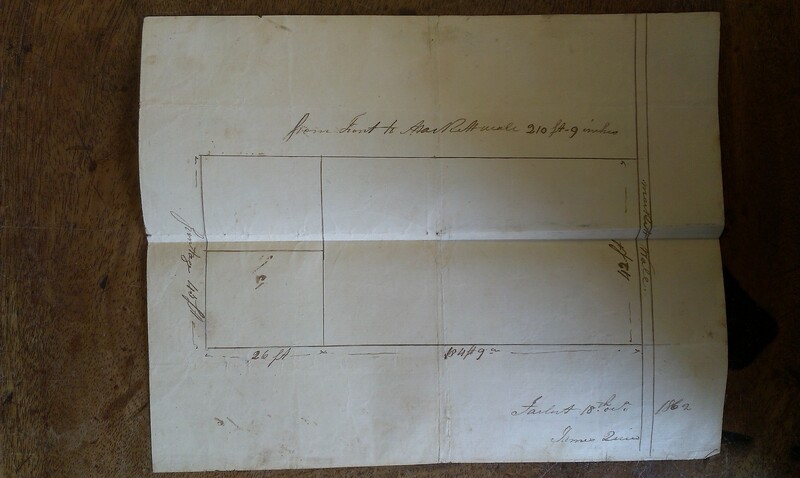 See cover and p.1 and p.2 and p.3. 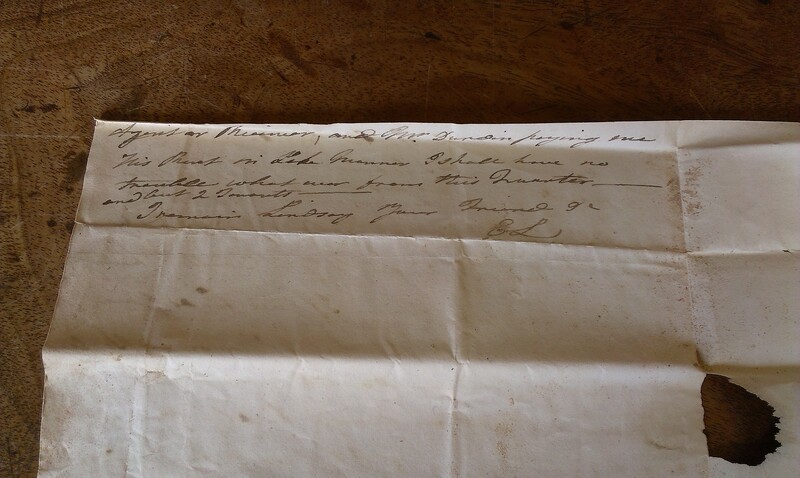 Letter from Sir Edward Leslie to Joseph Lindsay in Tarbert, 15 Feb 1801. 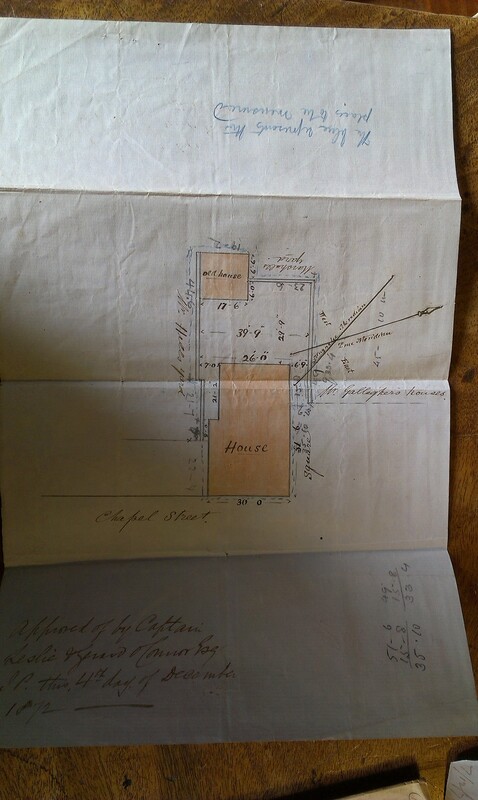 See cover and p.1 and p.2. 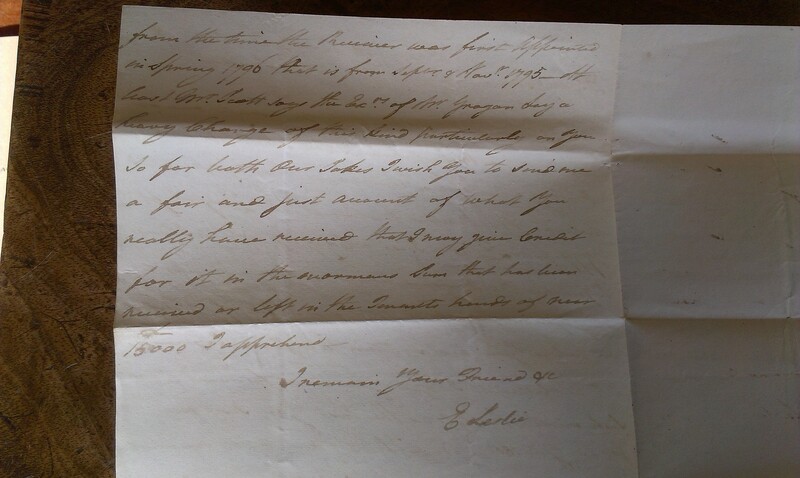 Letter from Sir Edward Leslie to Joseph Lindsay in Tarbert, 3 Apr 1801. 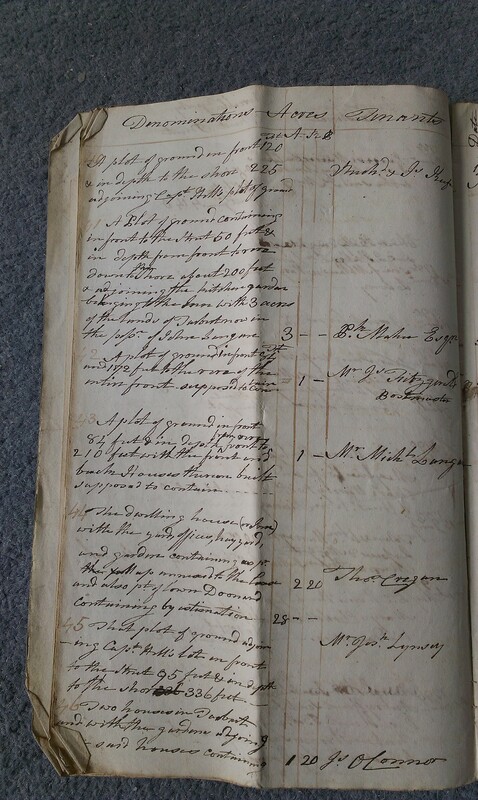 See cover and close-up and p.1 top and p.1 bottom and p.2 and p.3. 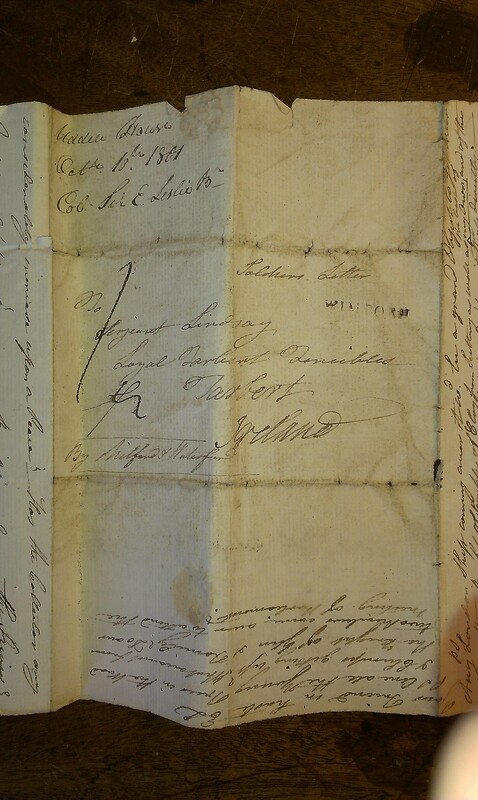 See cover and close-up and p.1 top and p.1 bottom and p.2. 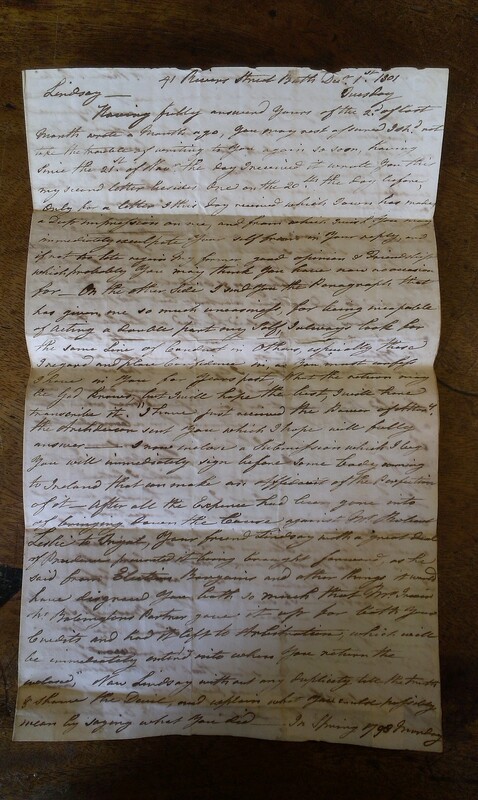 See p.1 top and p.1 middle and p.1 bottom. 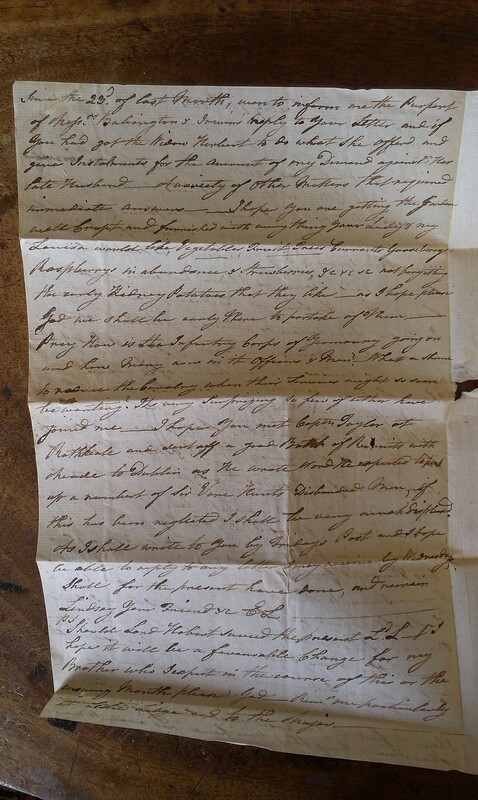 Letter from Sir Edward Leslie to Joseph Lindsay in Tarbert, 9 Sept 1801. 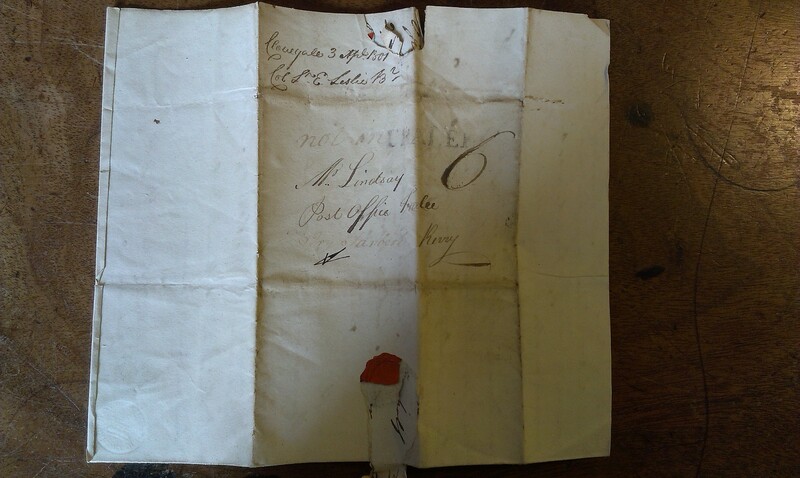 Letter from Sir Edward Leslie to Joseph Lindsay in Tarbert, 11 Sept 1801. 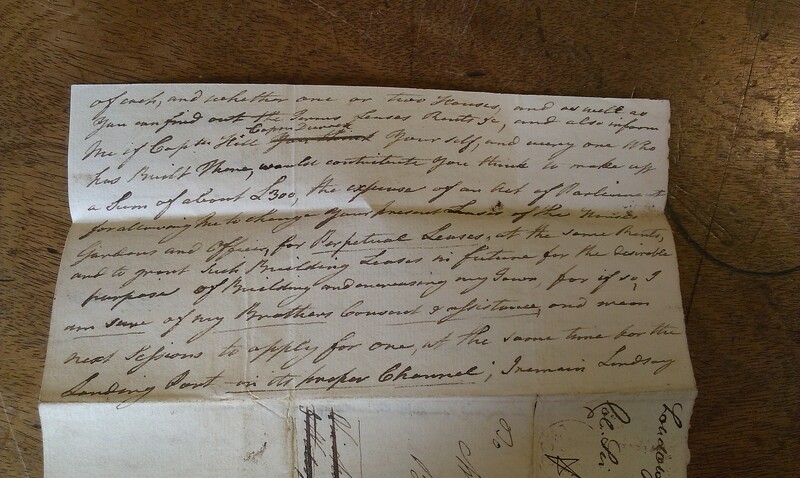 Letter from Sir Edward Leslie to Joseph Lindsay in Tarbert, 23 Sept 1801. 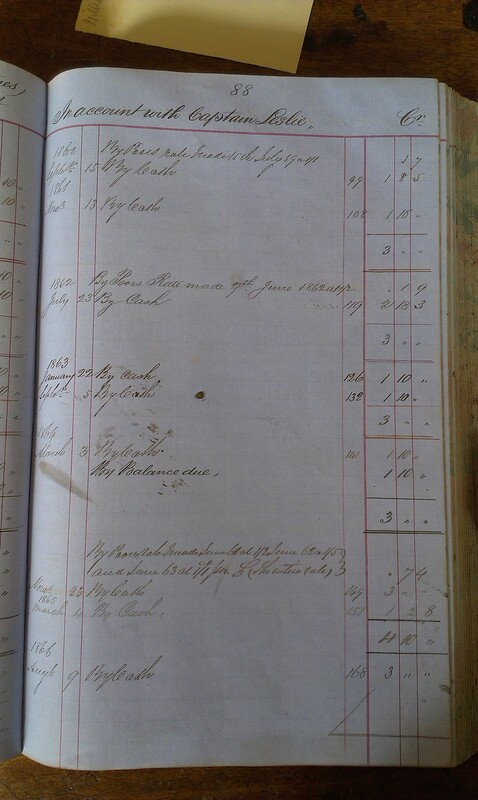 See cover and p.1 top and p.1 bottom and p.2 and p.3 and p.4. 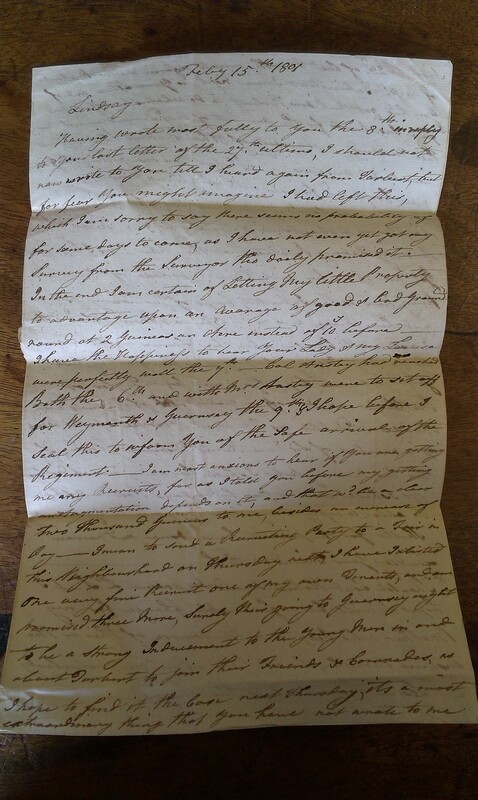 Letter from Sir Edward Leslie to Joseph Lindsay in Tarbert, 10 Oct 1801. 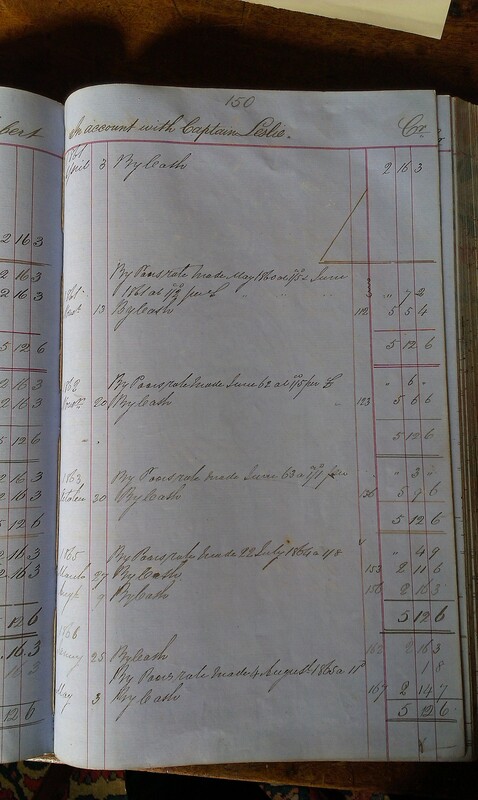 See cover and p.1 top and p.1 middle and p.1 bottom and p.2 top and p.2 bottom. 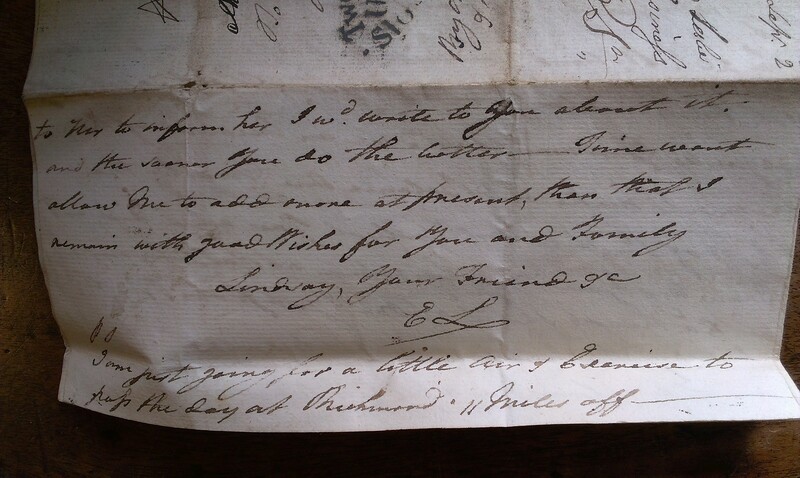 Letter from Sir Edward Leslie to Joseph Lindsay in Tarbert, 5 Nov 1801. 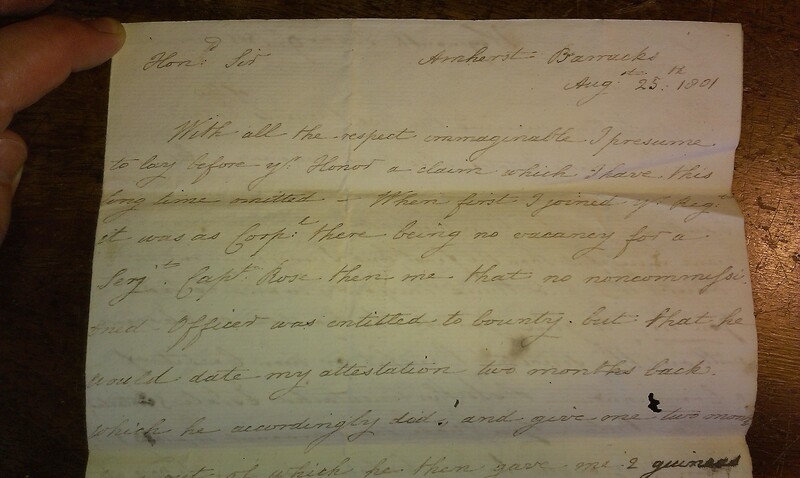 Letter from Sir Edward Leslie to Joseph Lindsay in Tarbert, 1 Dec 1801. 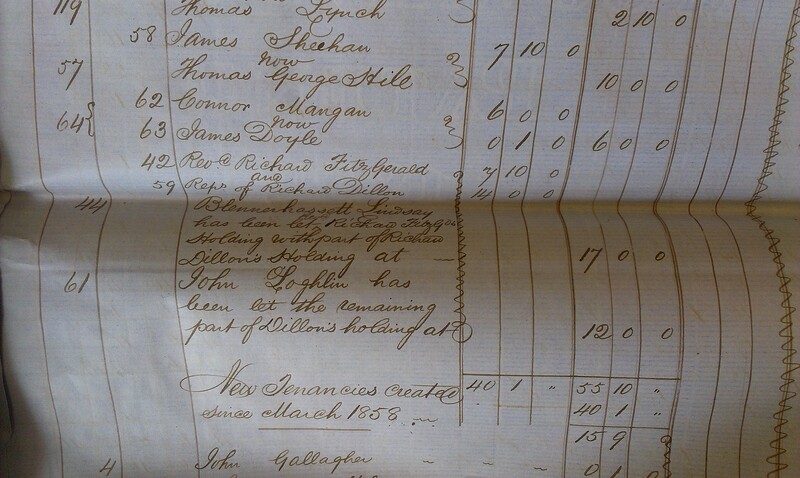 Accounts of 27 Dec 1801. 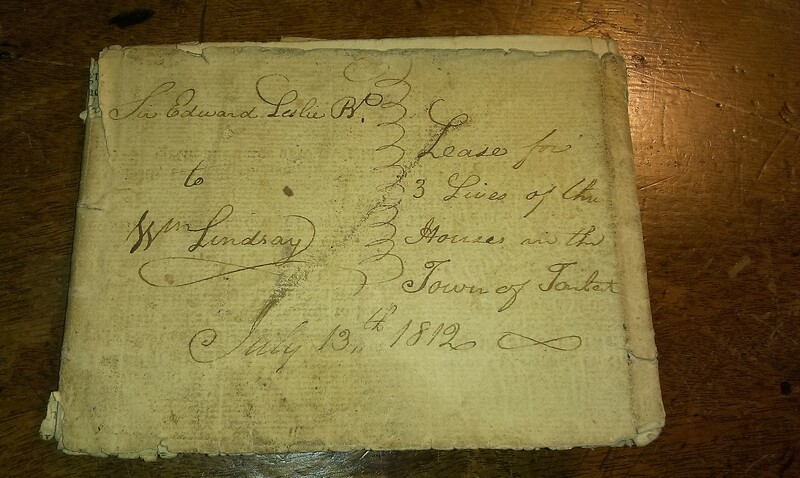 Copy prepared by the agent Joseph Lindsay. 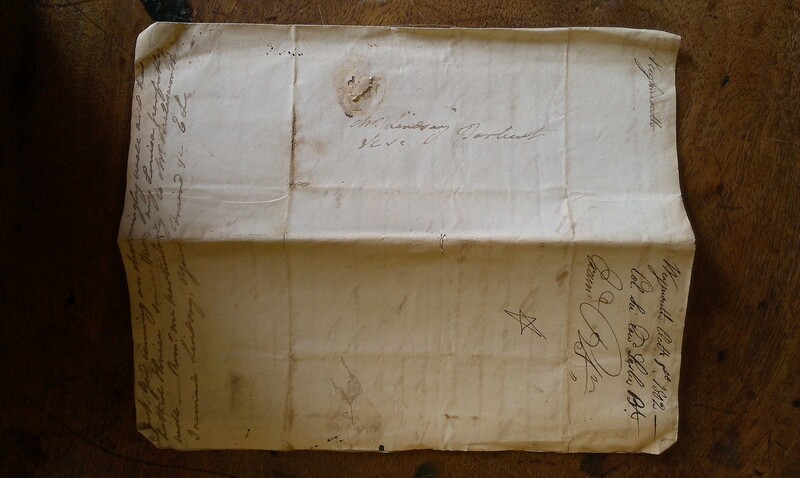 Letter from Sir Edward Leslie to Joseph Lindsay in Tarbert, 27 July 1802. 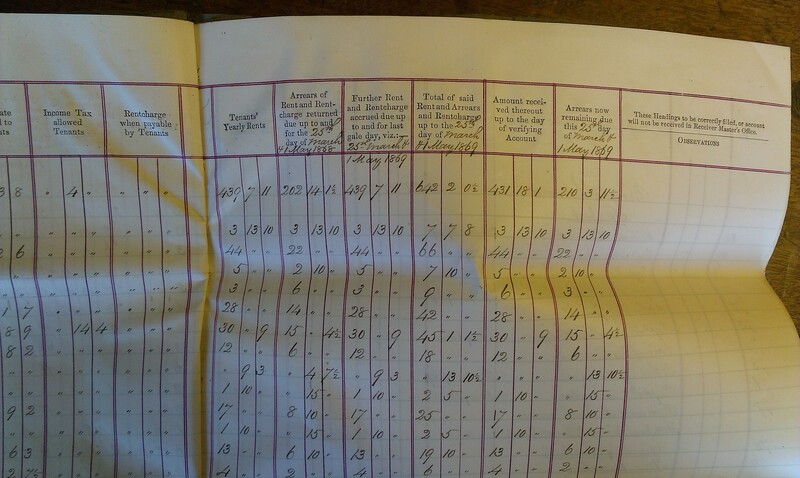 See cover and p.1 top and p.1 bottom and p.2 and p.3 and p.4 and p.5 and p.6. 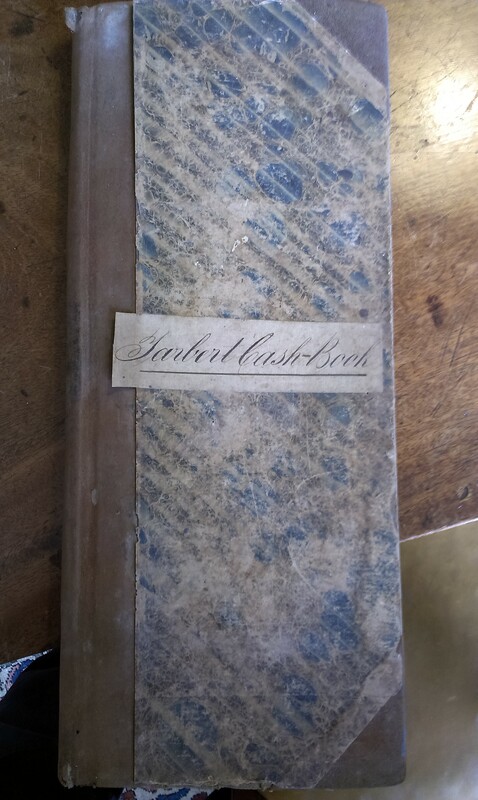 See other shot of cover. 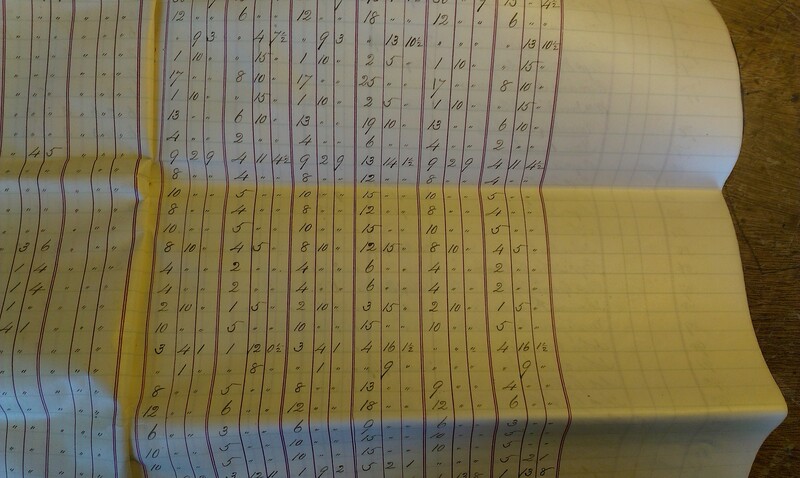 See cover and p.1 top and p.1 bottom and p.2 top and p.2 bottom and p.3 top and p.3 bottom and p.4 top and p.4 bottom. 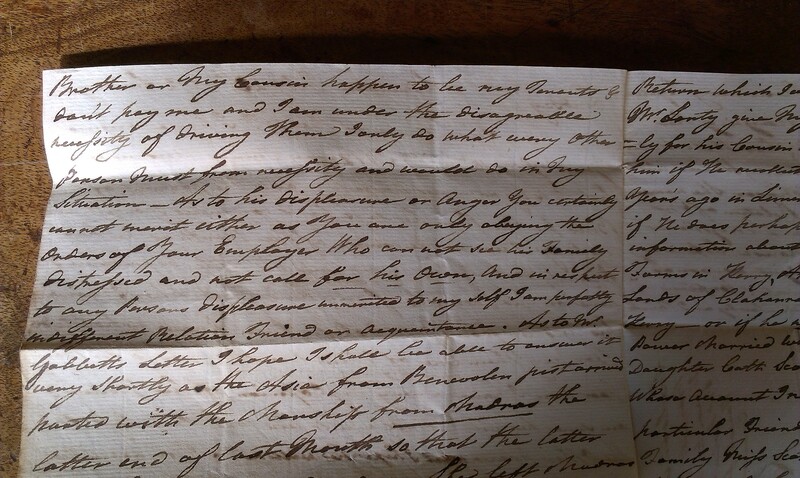 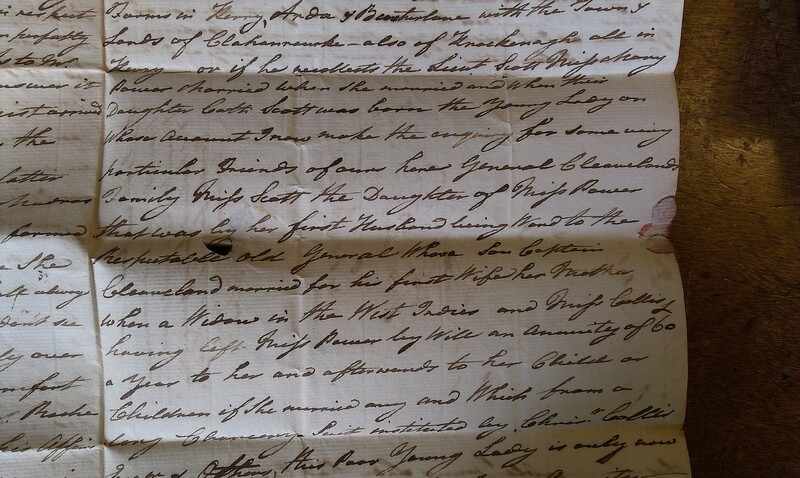 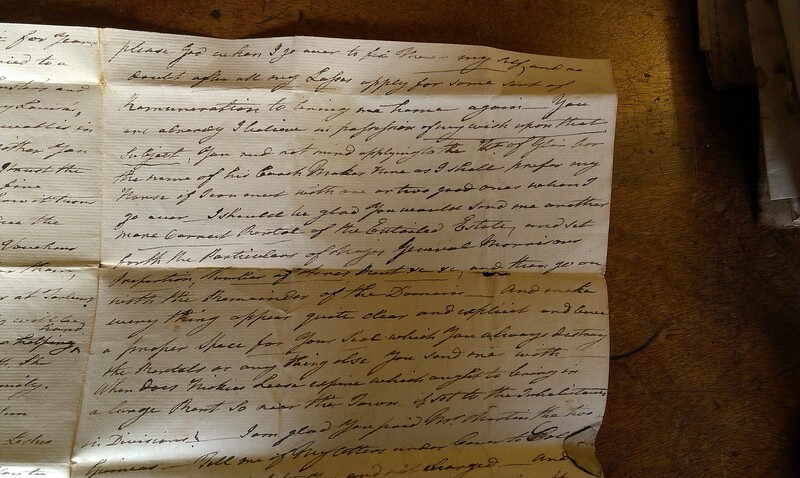 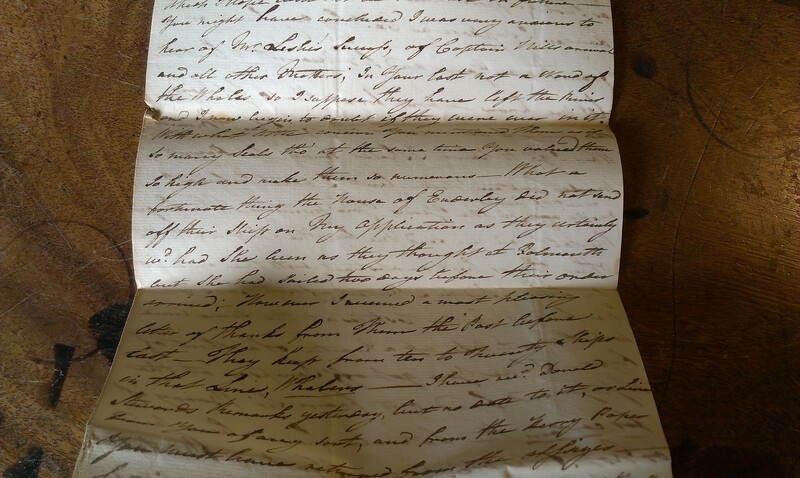 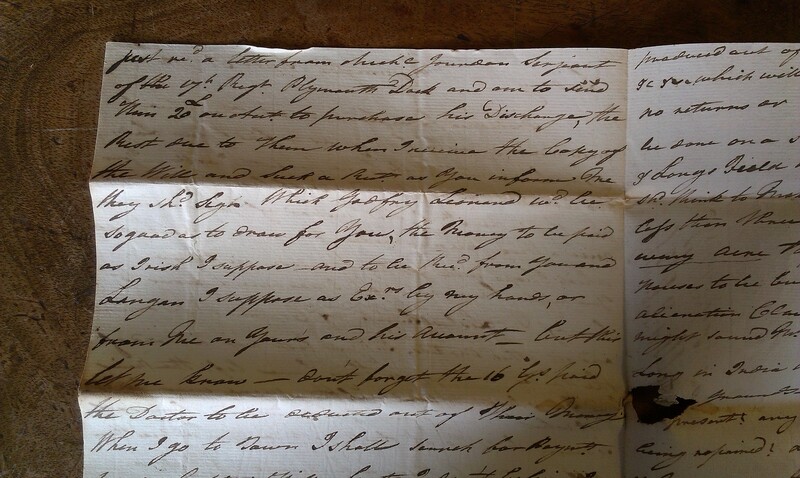 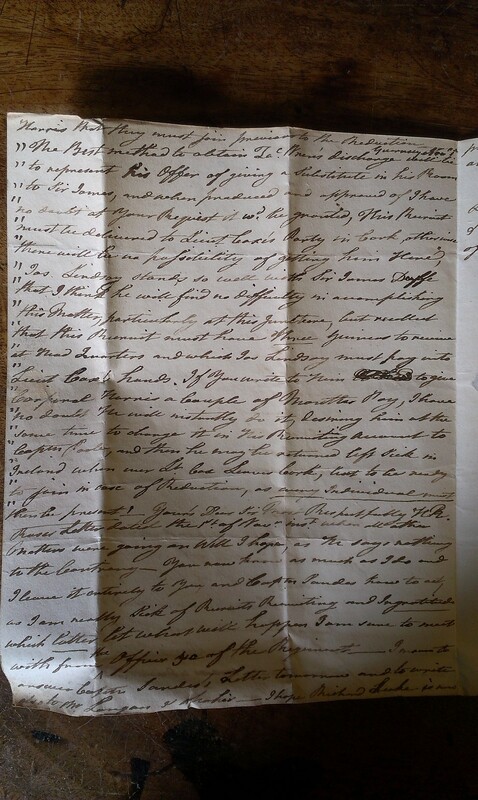 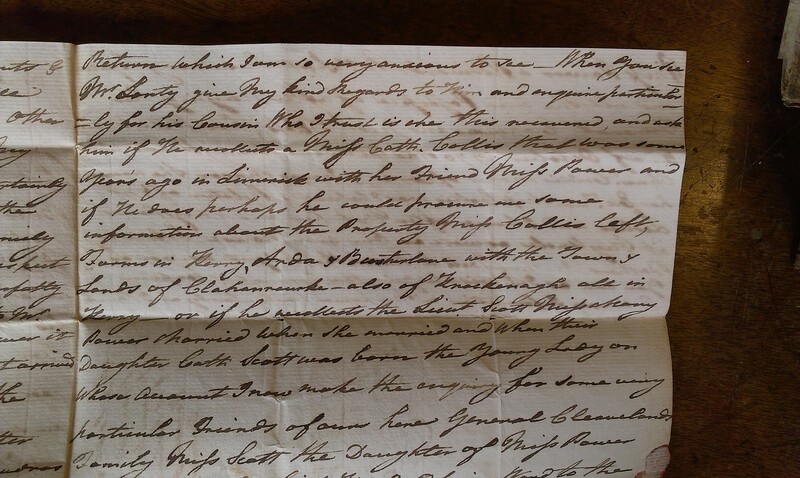 Letter from Sir Edward Leslie to Joseph Lindsay in Tarbert, 8 Sept 1802. 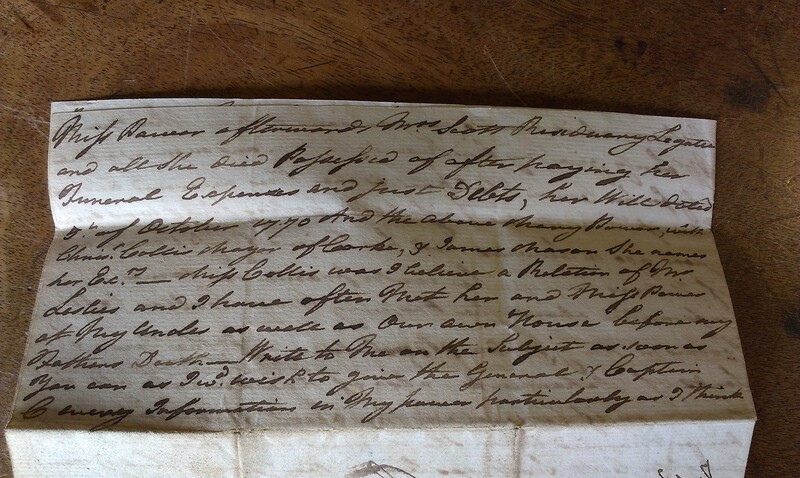 Letter from Sir Edward Leslie to Joseph Lindsay in Tarbert, 1 Oct 1802. 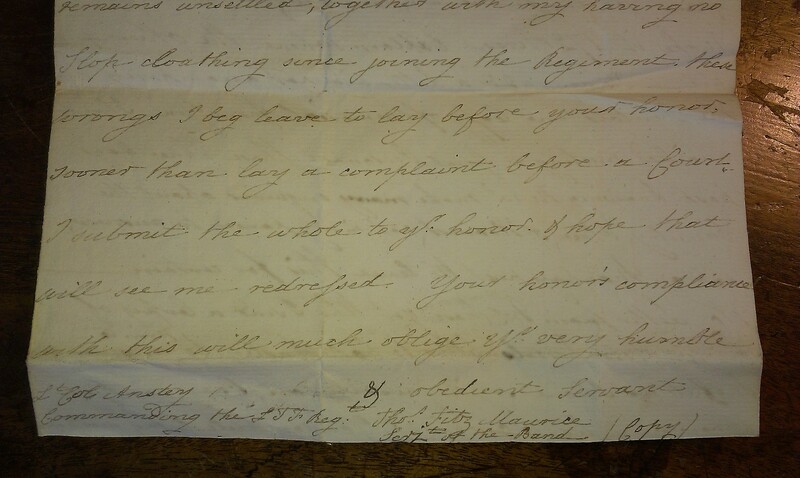 Letter from Sir Edward Leslie to Joseph Lindsay in Tarbert, 10 Oct 1802. 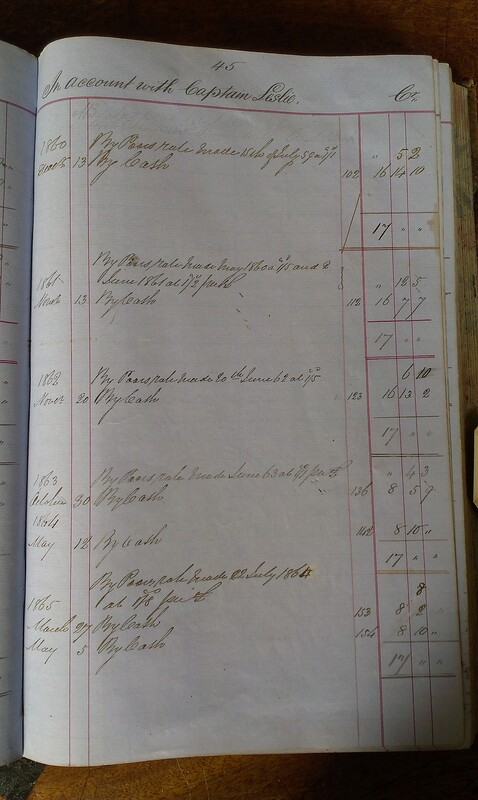 See cover and p.1 top and p.1 bottom and p.2. 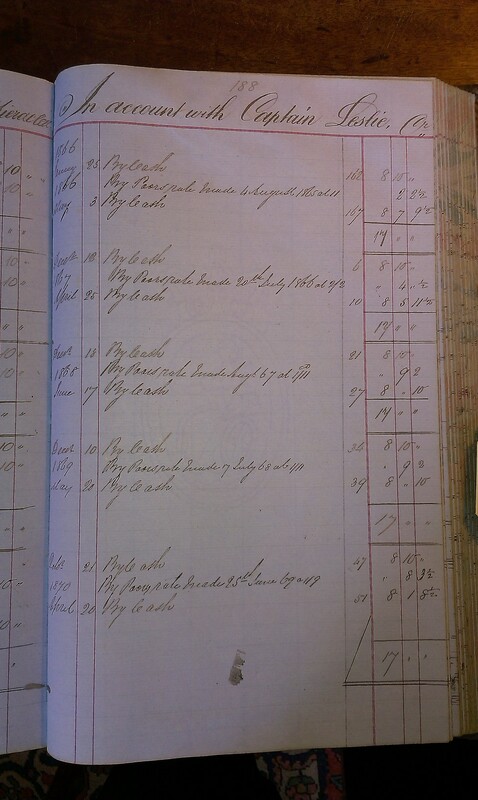 Accounts of 25 Oct 1802. 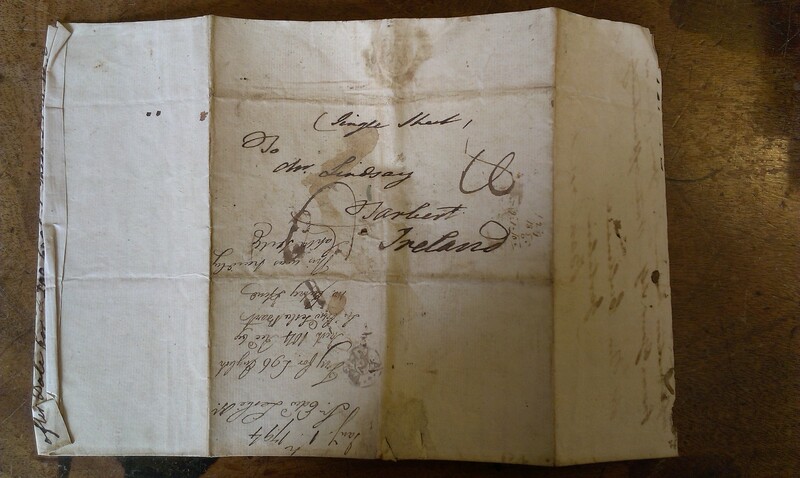 Signed by Joseph Lindsay. 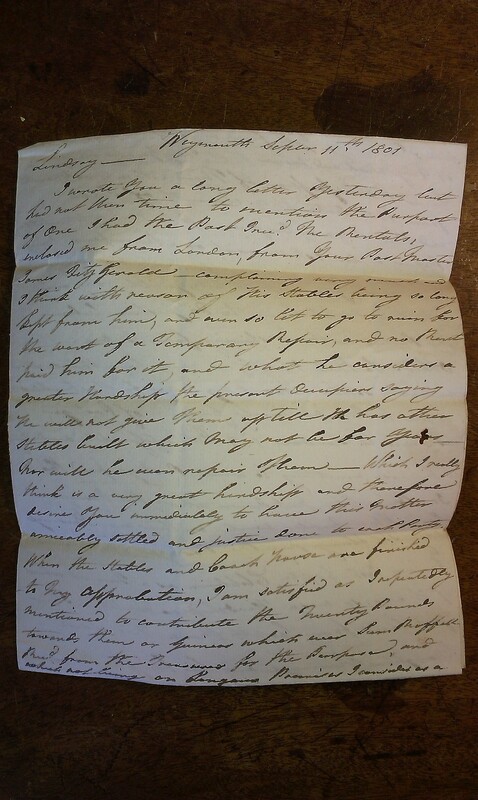 See cover and p.1 top and p.1 bottom and p.2 top and p.2 bottom. 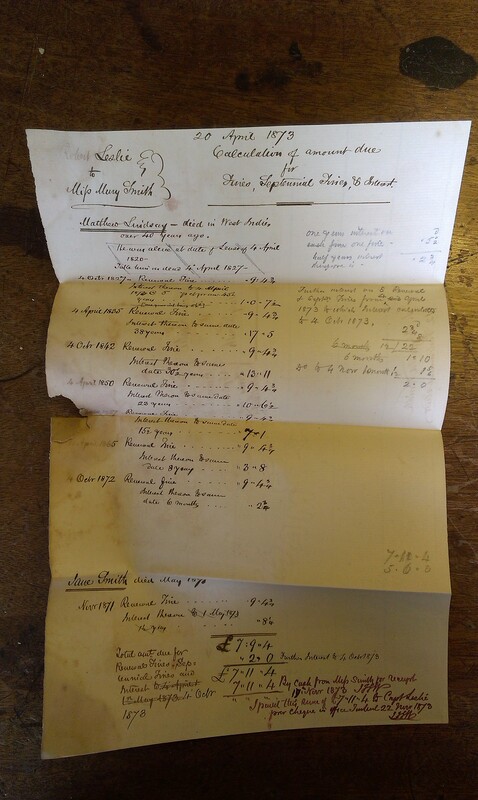 See alternative shots cover and p.1 and p.1 bottom and p.2 top and p.2 middle and p.2 bottom. 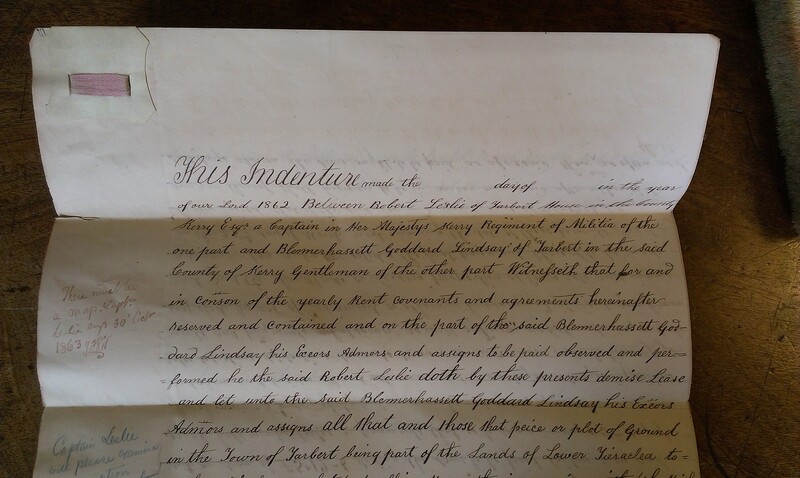 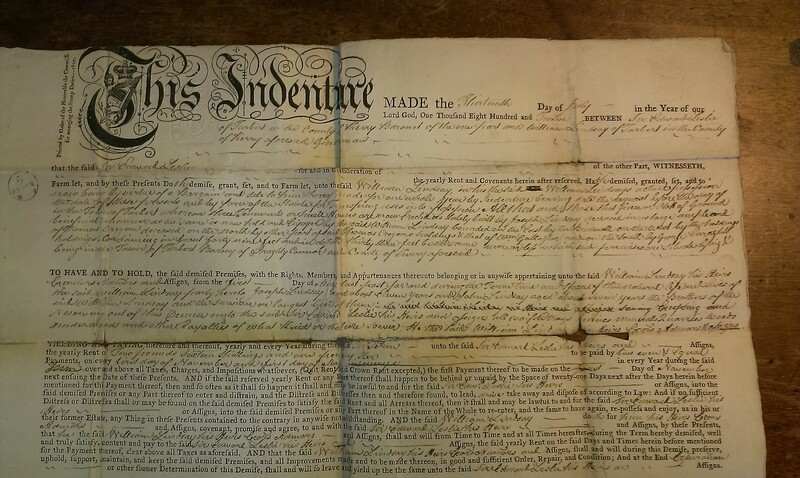 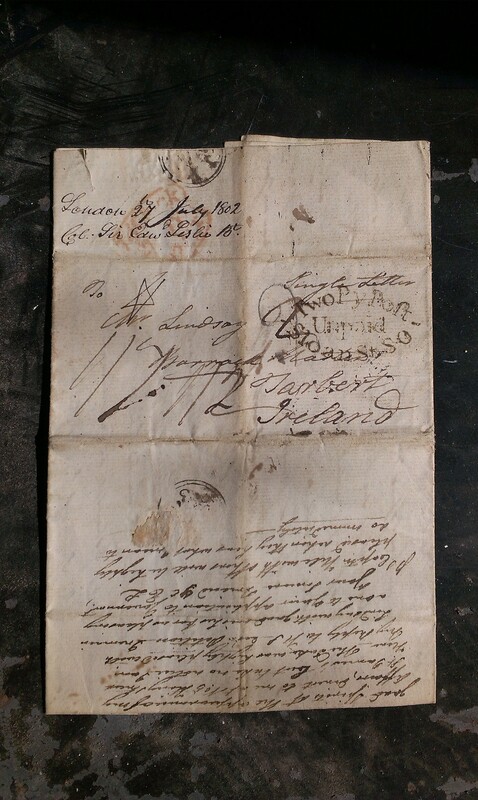 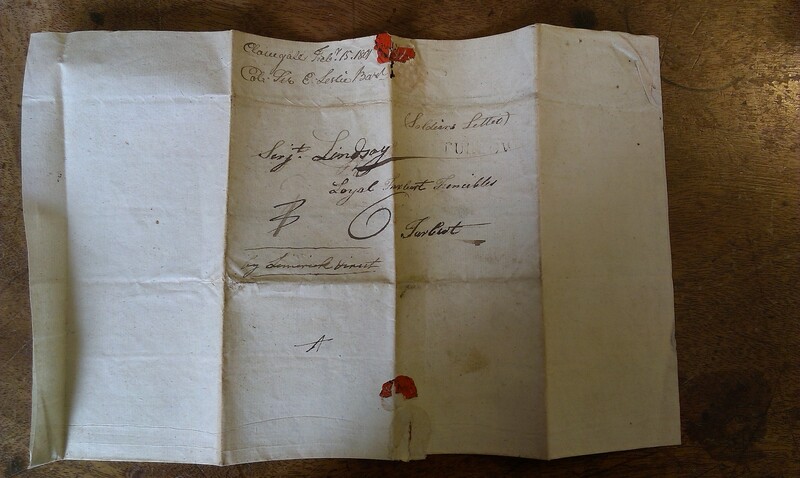 Deed, 13 July 1812, Sir Edward Leslie to William Lindsay of Tarbert. 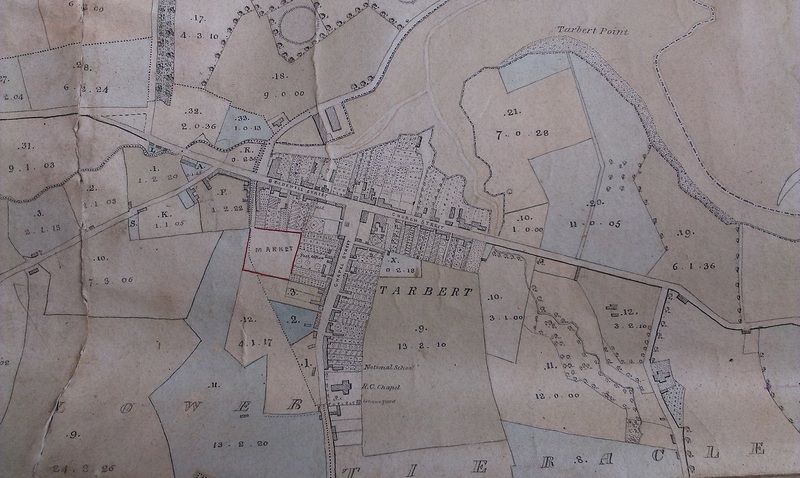 Lease of property in Tarbert. 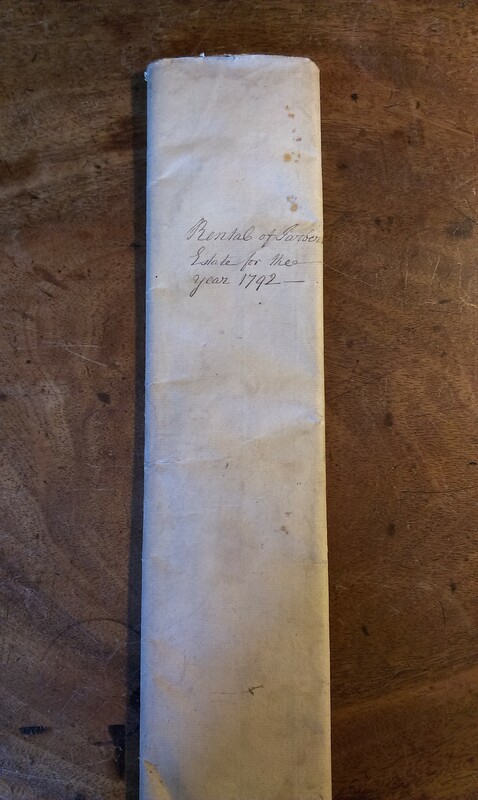 See cover and top and bottom. 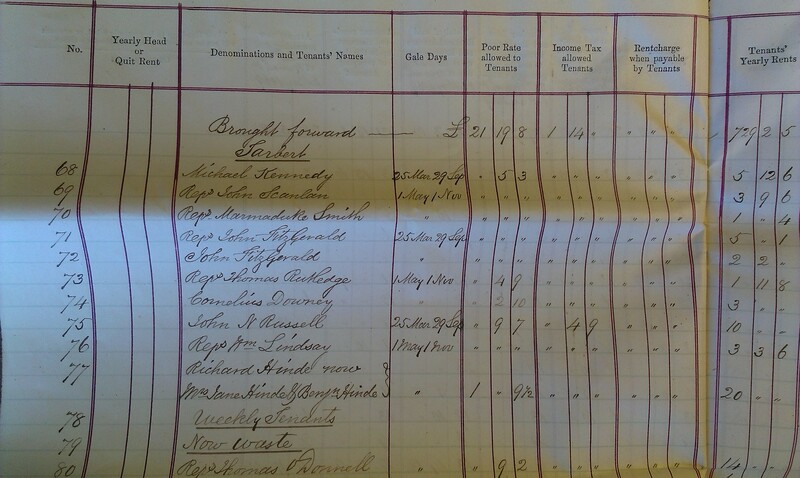 See top and LHS and RHS. 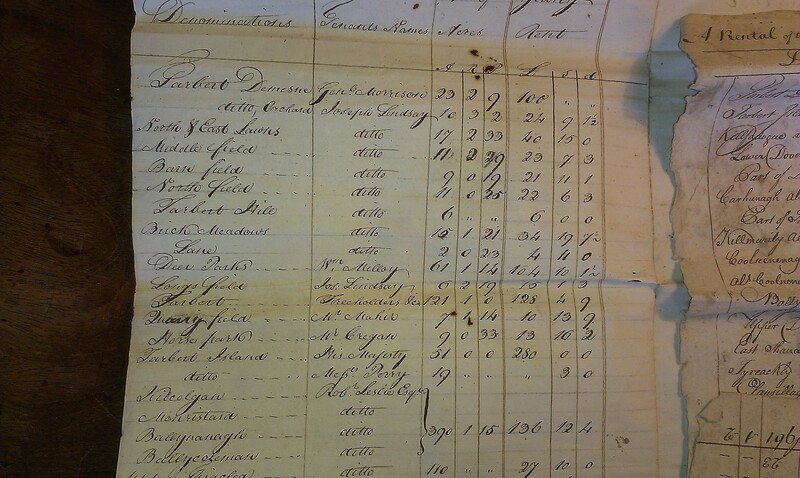 See bottom and LHS and RHS. 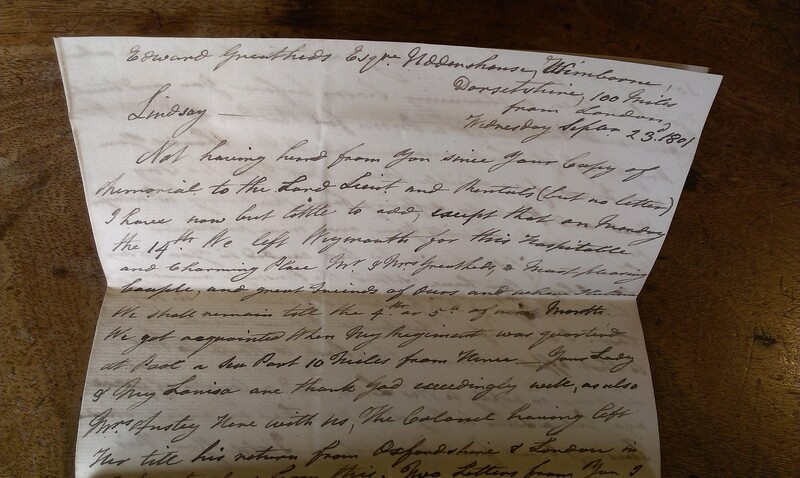 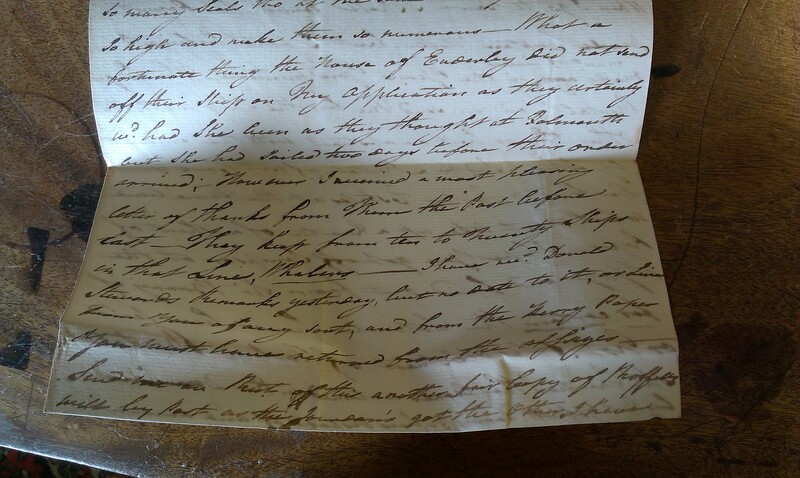 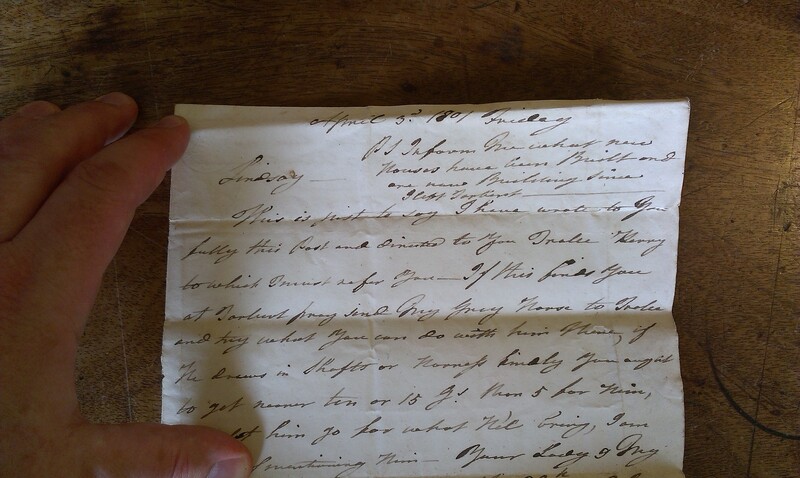 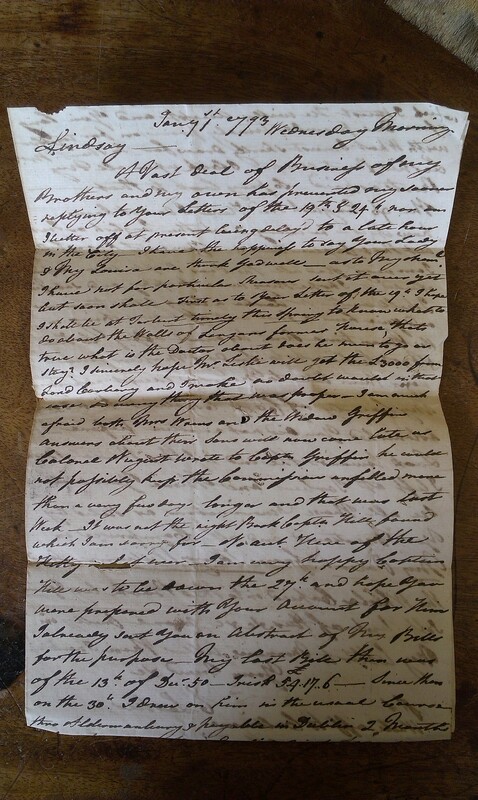 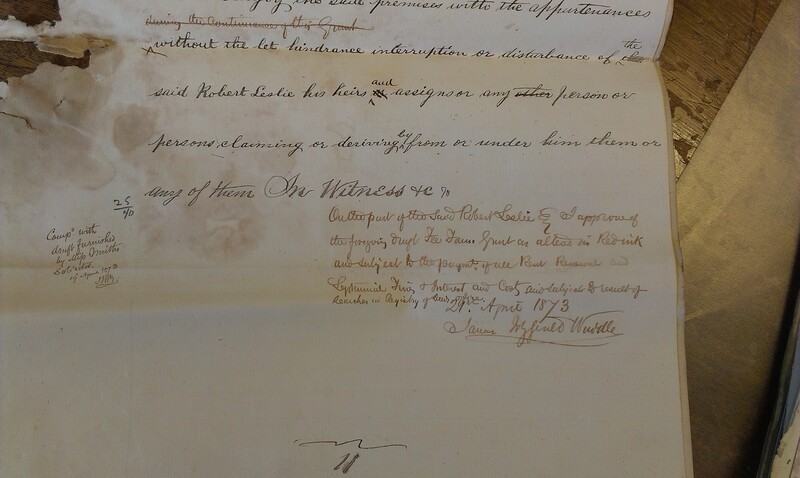 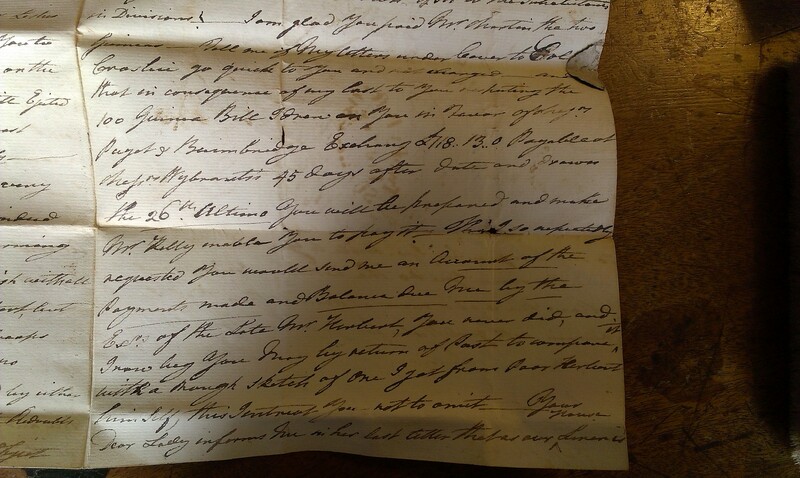 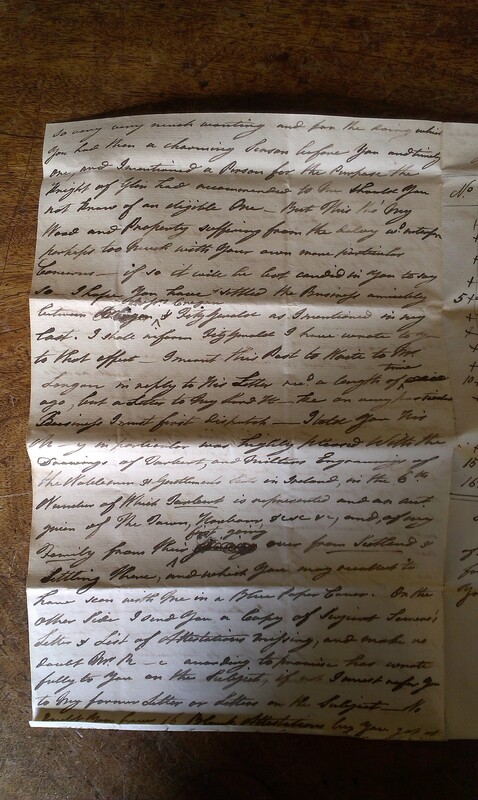 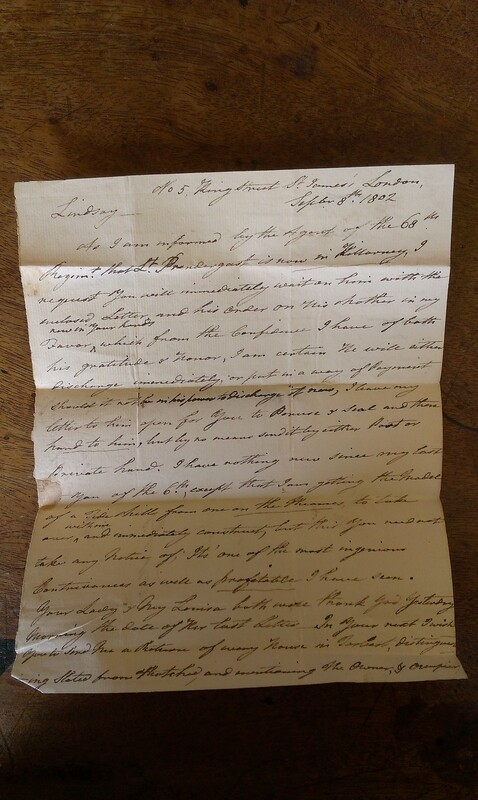 Deed, 4 Apr 1820, Robert Leslie to William Lindsay of Tarbert. 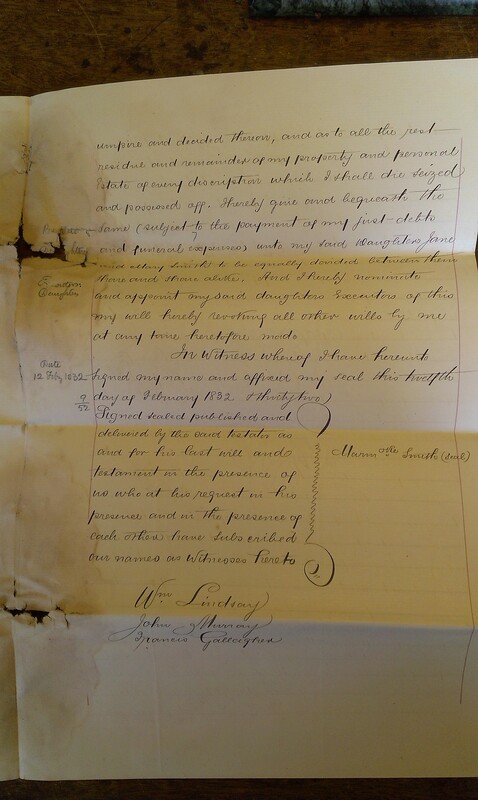 Lease of Church St properties in Tarbert. 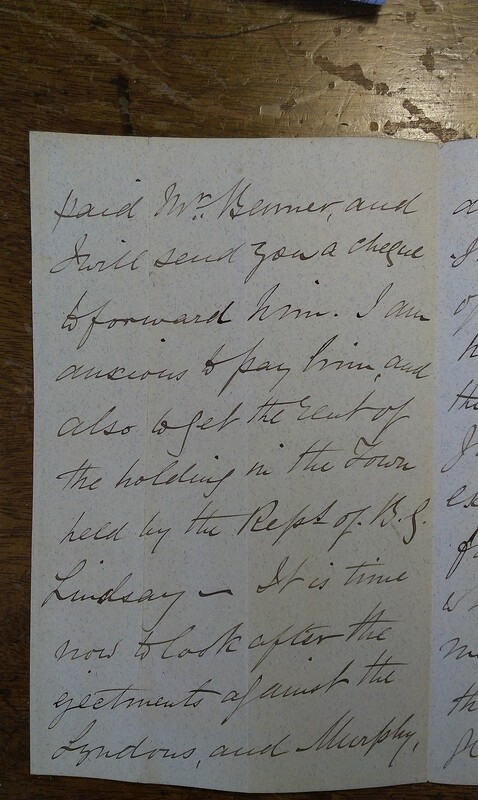 Memorial in [LR] book 753, p. 197, no. 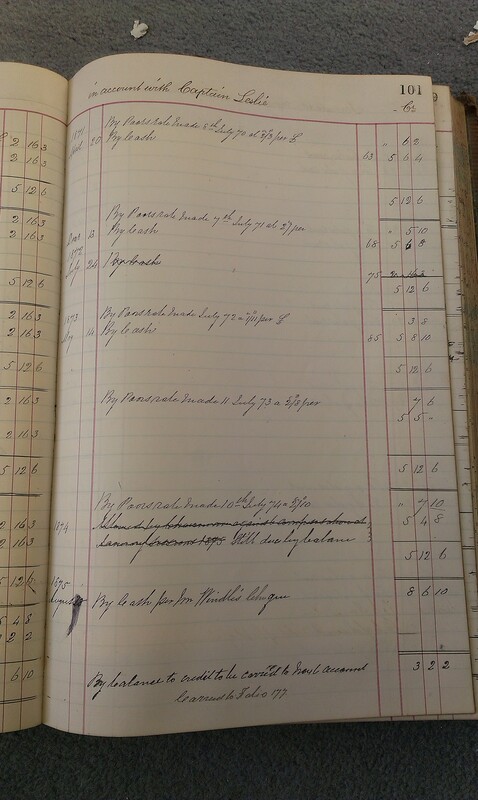 511932. 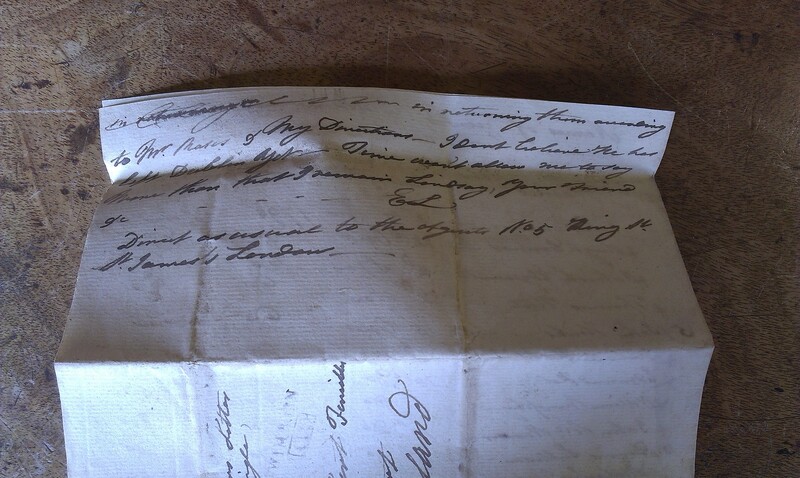 Sworn 20 May 1820, registered 17 June 1820. 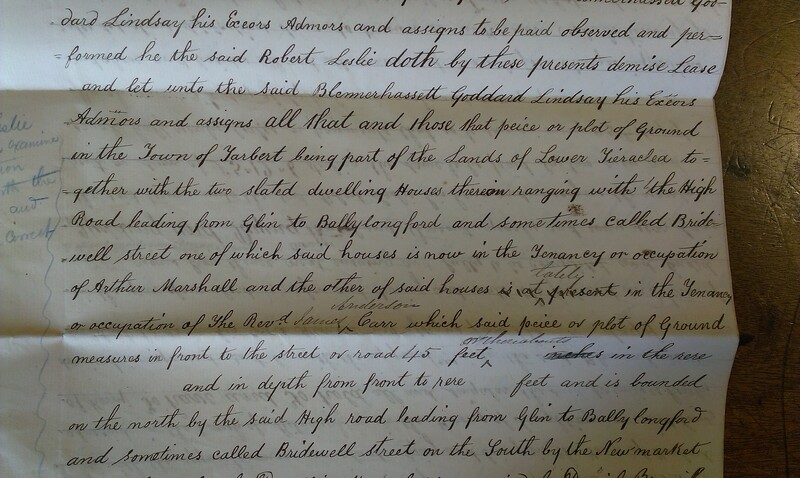 Full deed in Leslie papers. 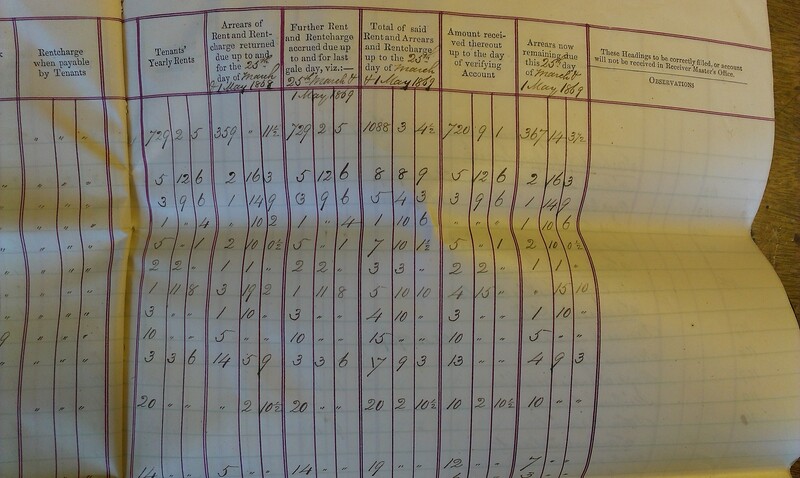 See cover and p.1 and p.2 and p.3 and p.4 and p.4 detail and p.5 and p.6 and p.7 and p.8. 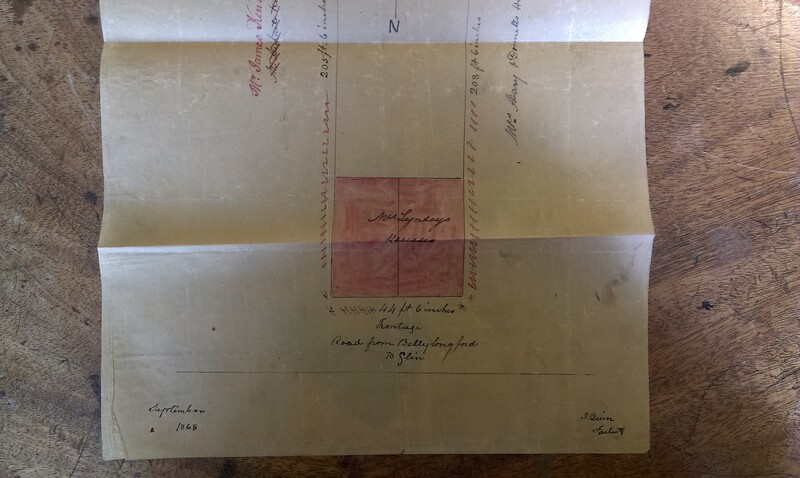 See map and map rotated. 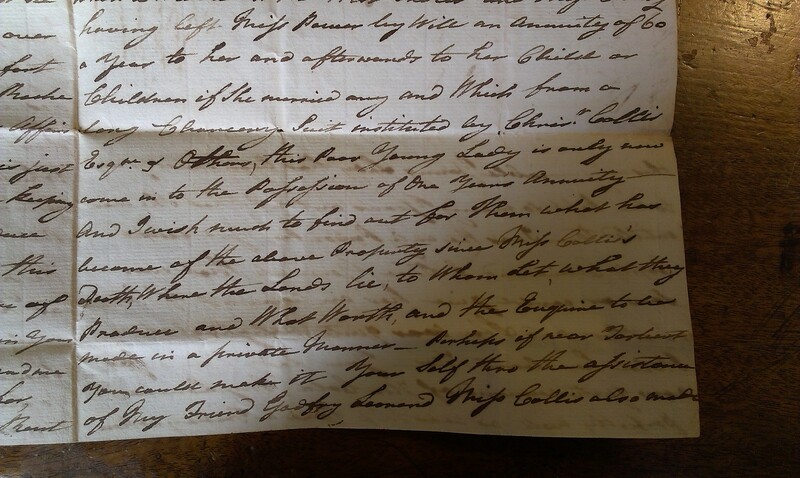 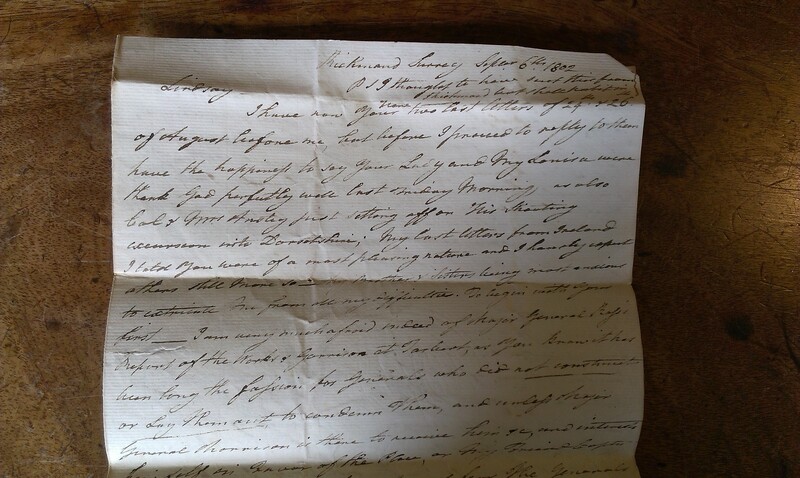 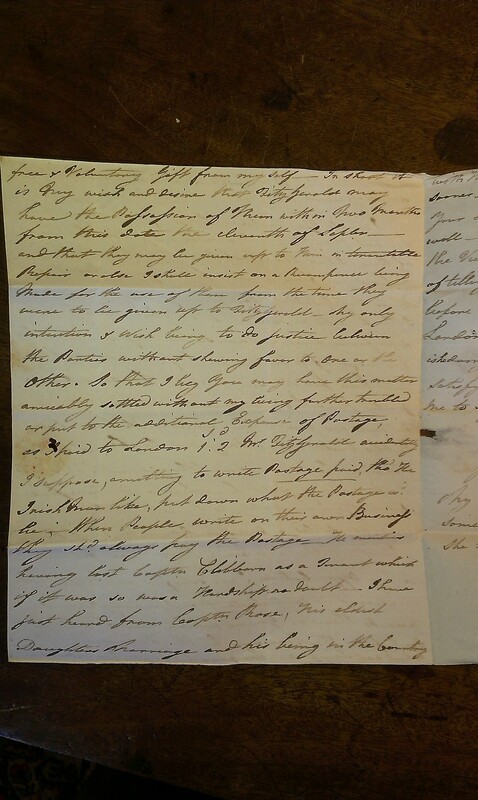 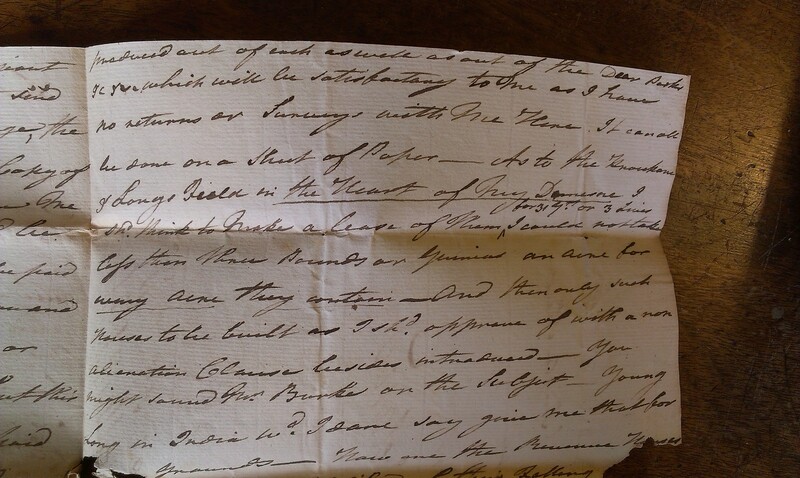 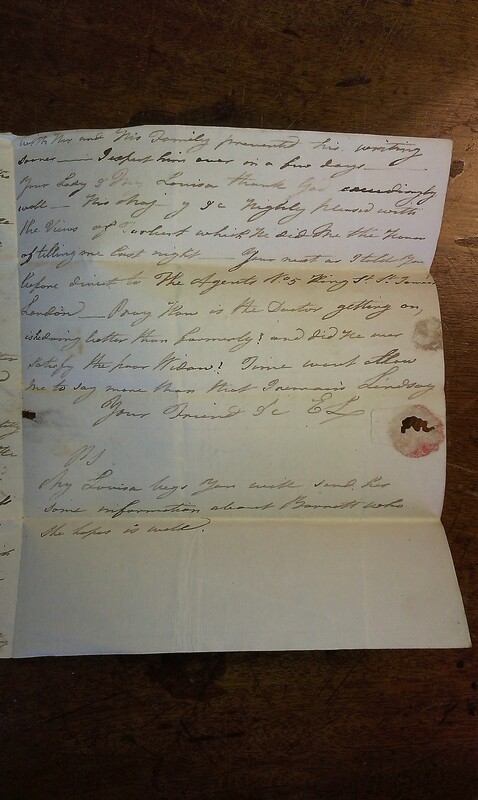 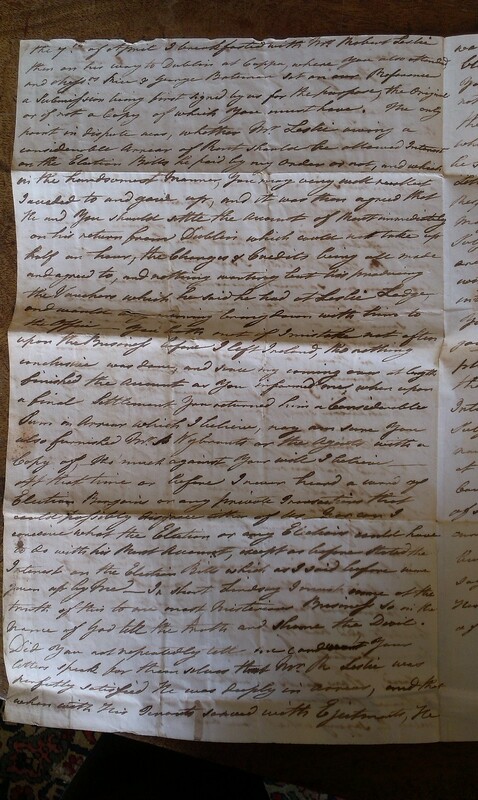 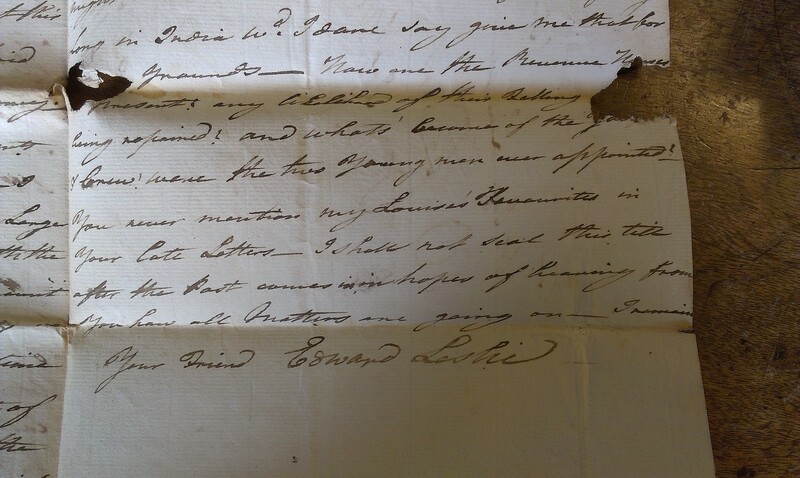 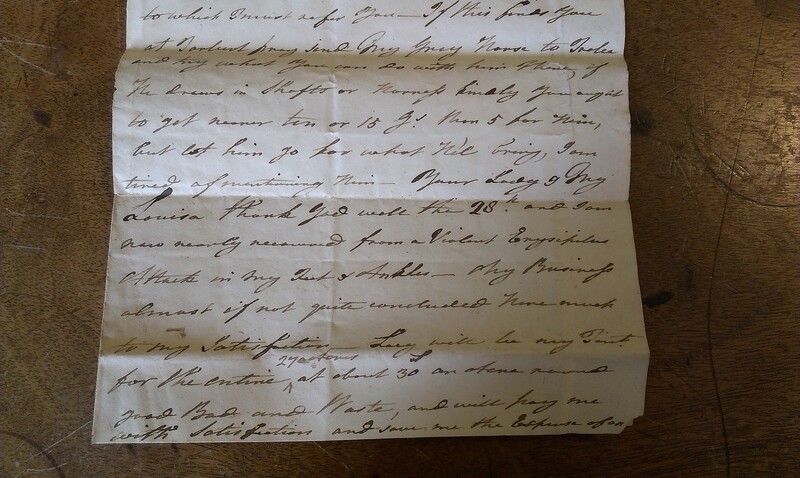 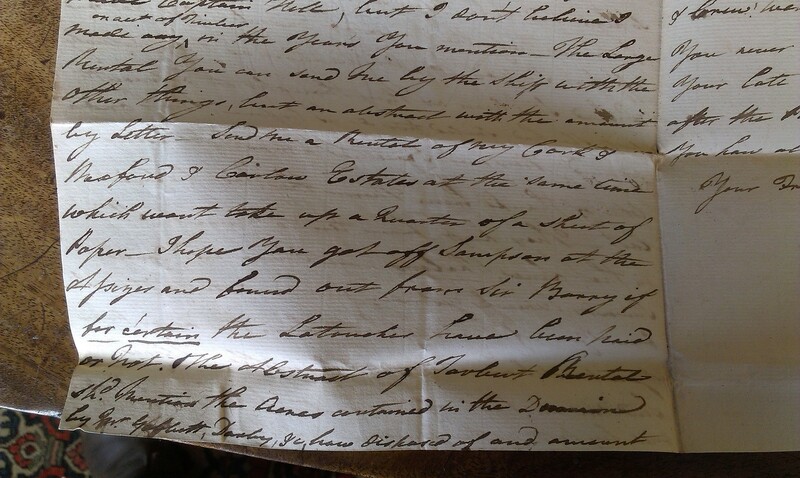 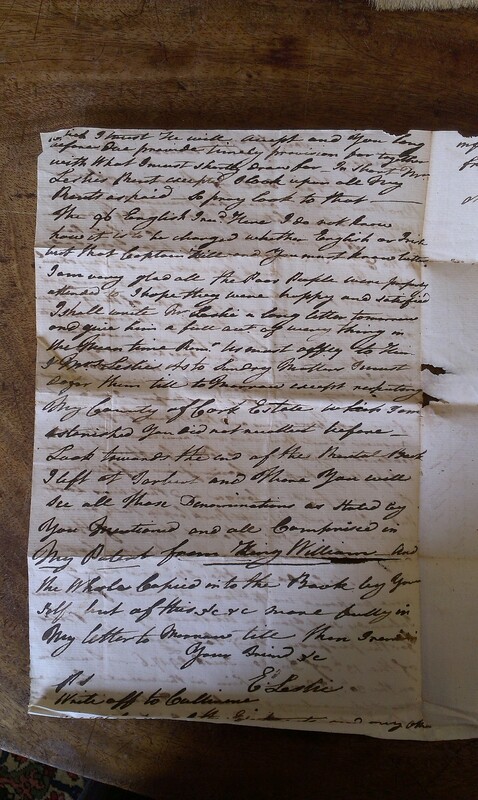 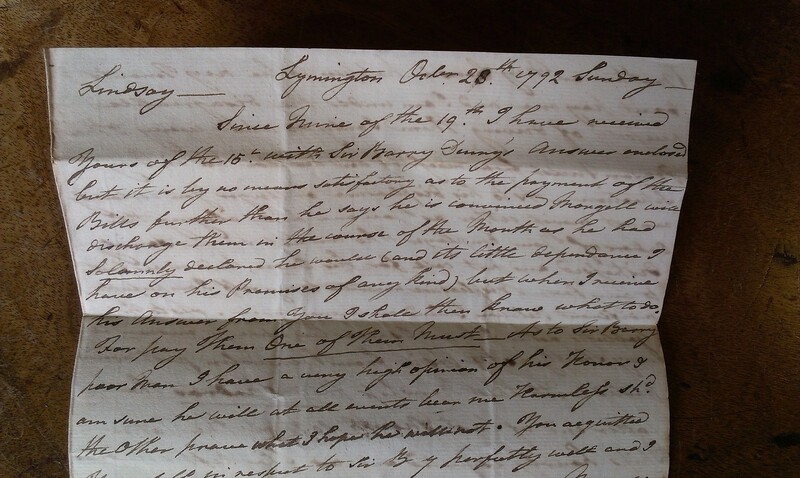 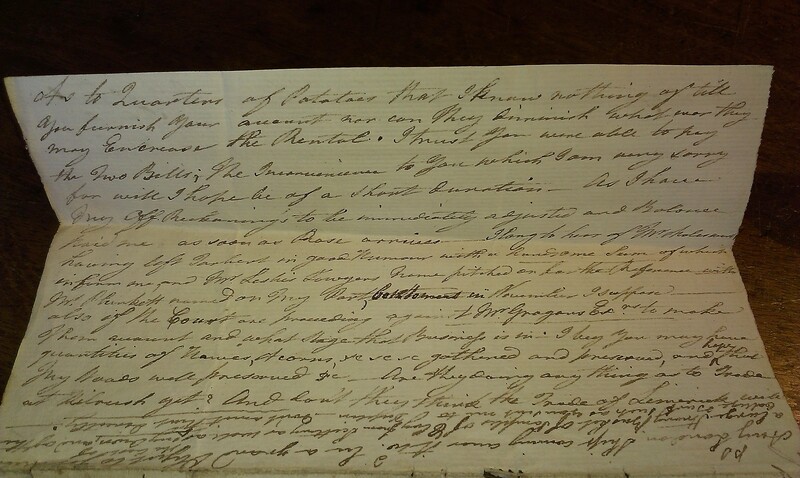 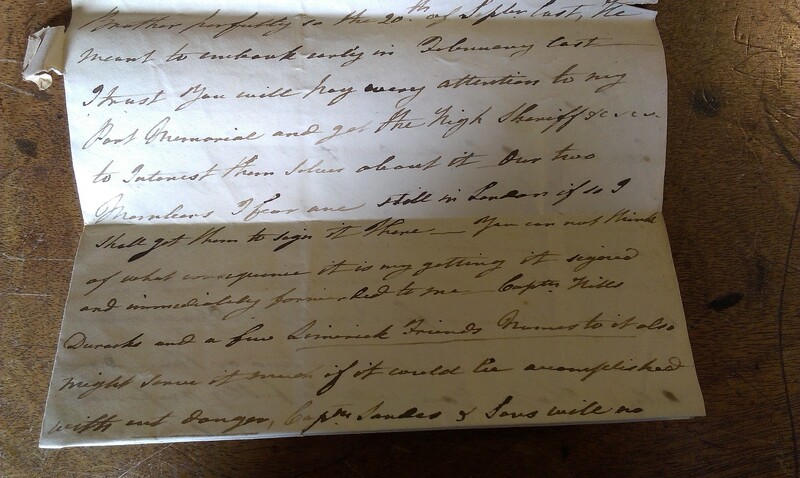 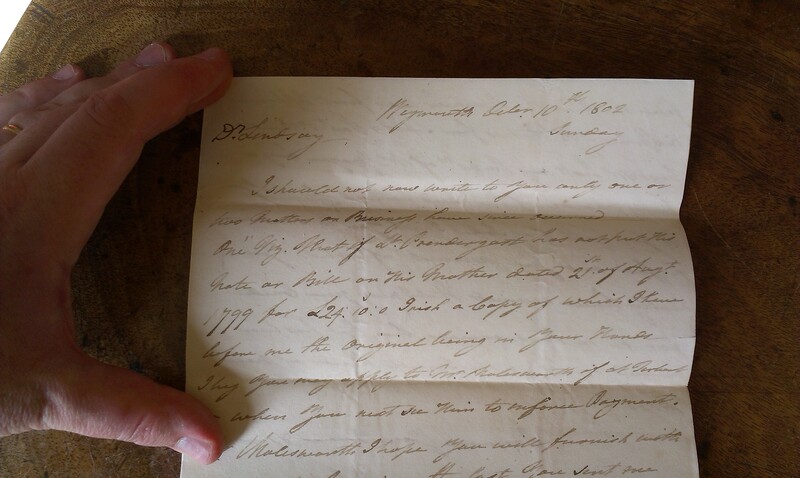 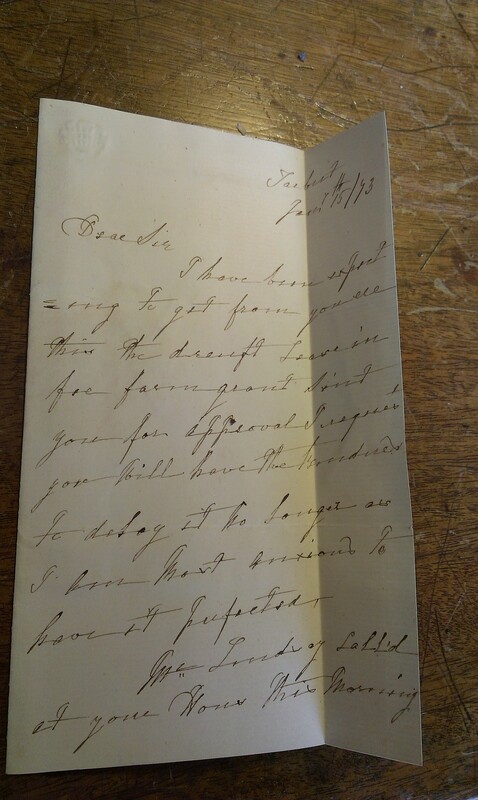 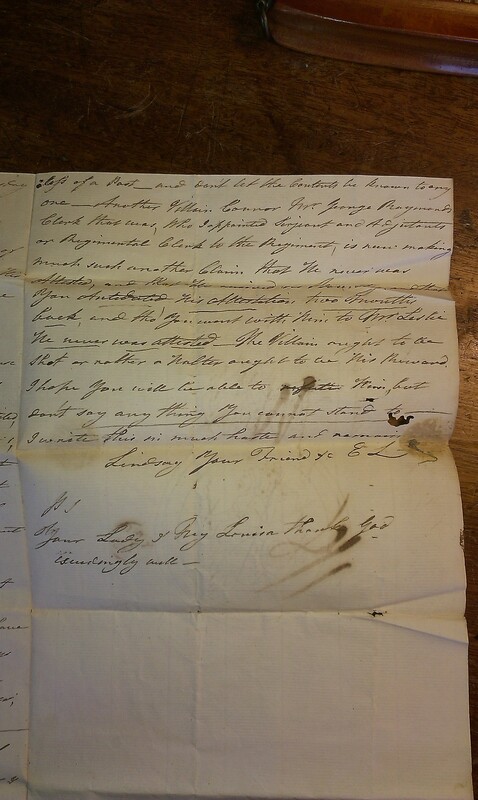 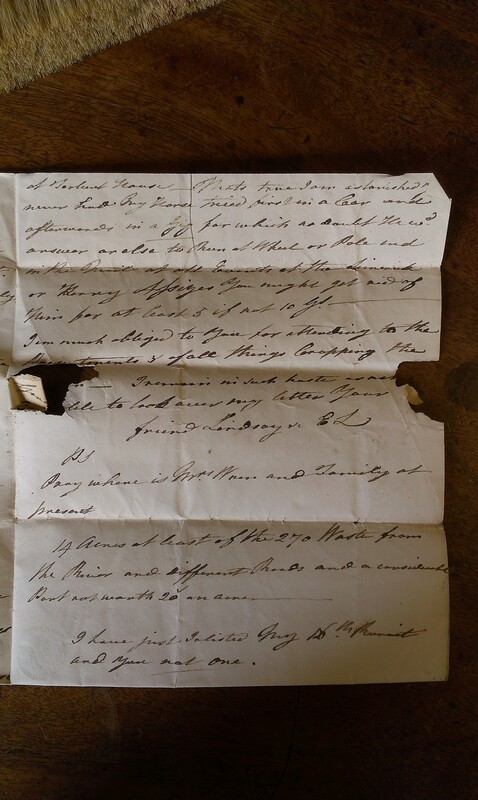 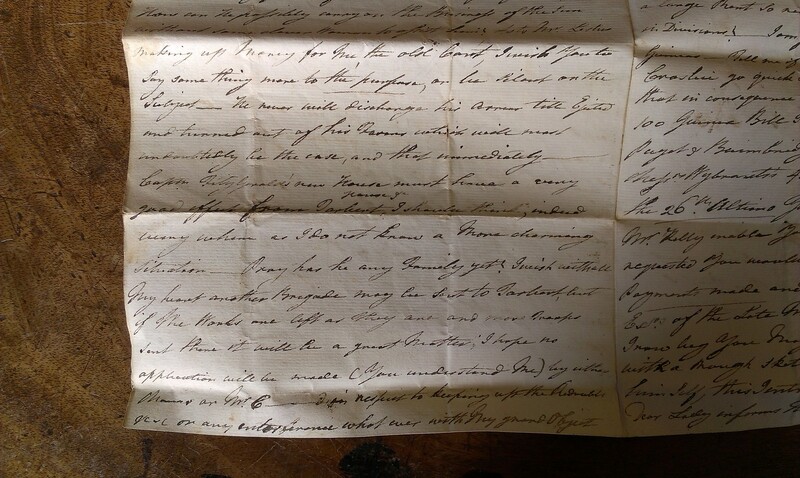 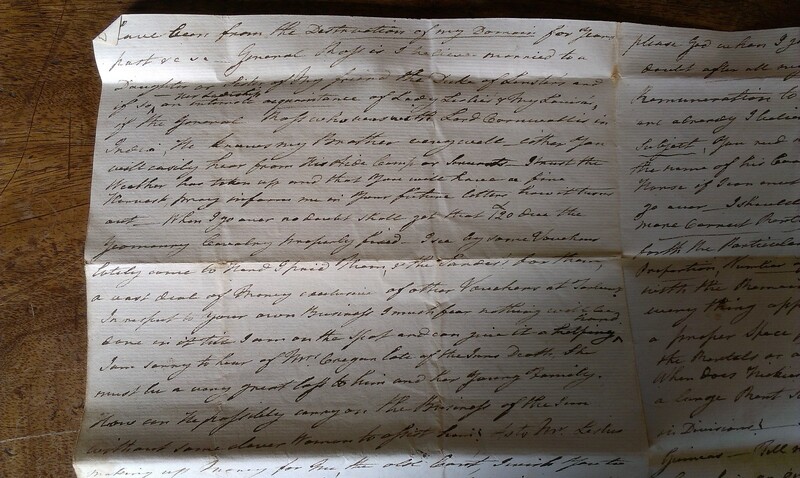 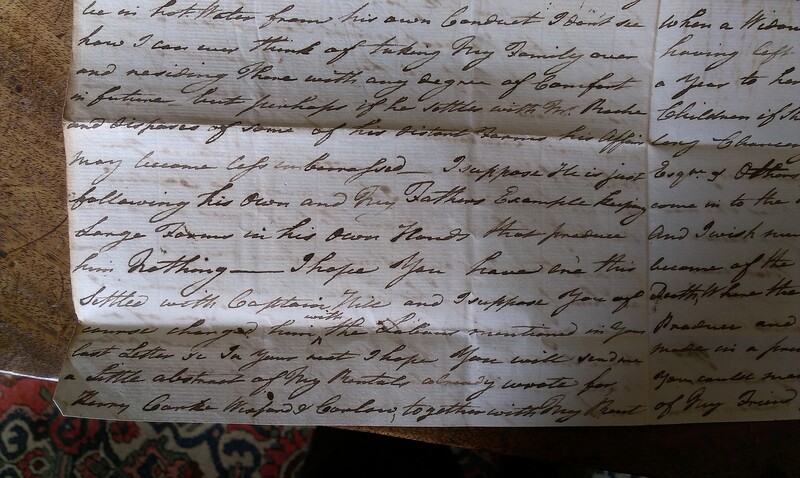 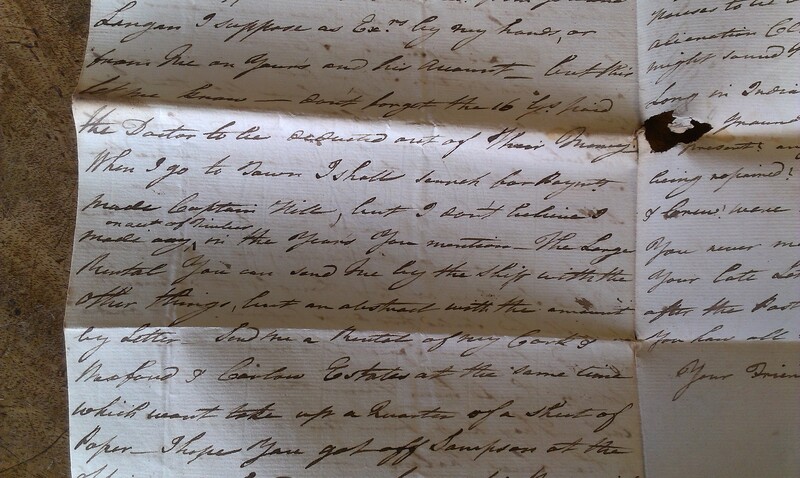 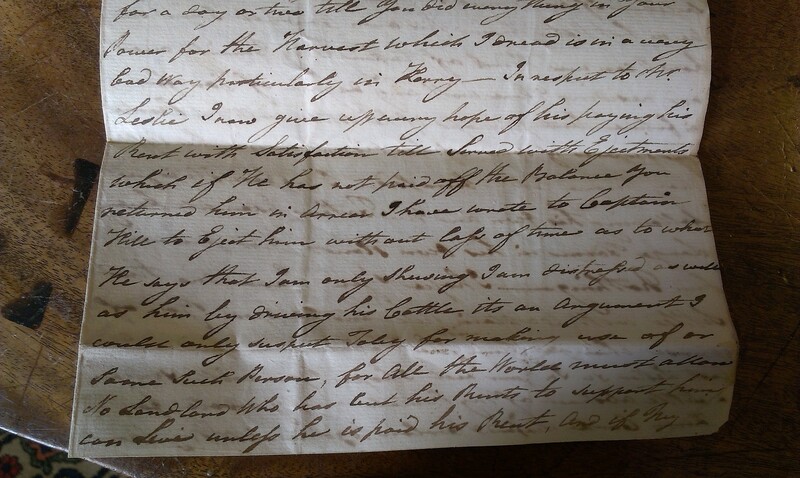 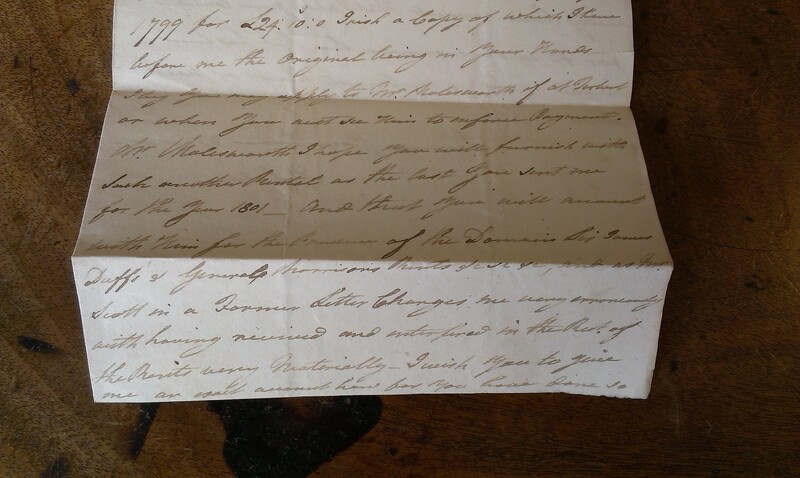 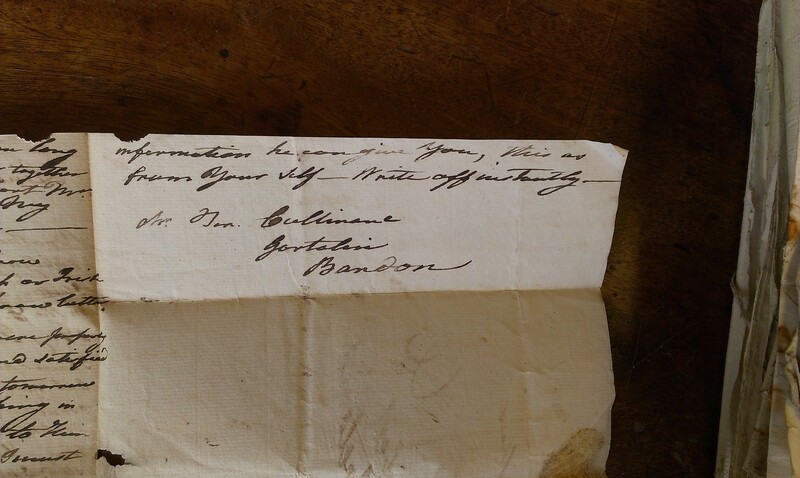 Deed, 4 Apr 1820, Robert Leslie to Marmaduke Smith. 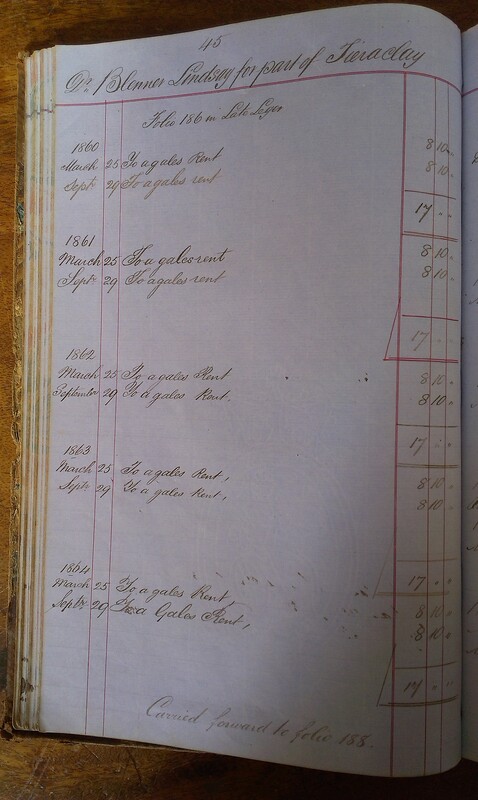 See cover and p.1 top and p.1 bottom and p.2 and p.3 and end. 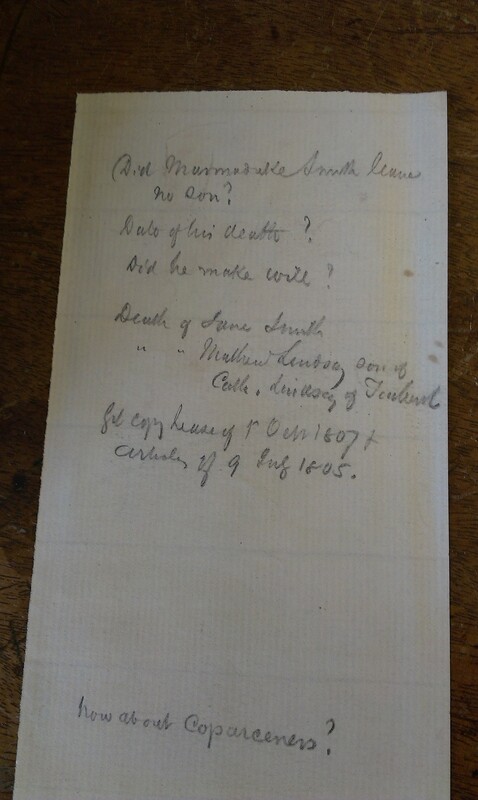 Memorial in [LR] book 753, p. 284, no. 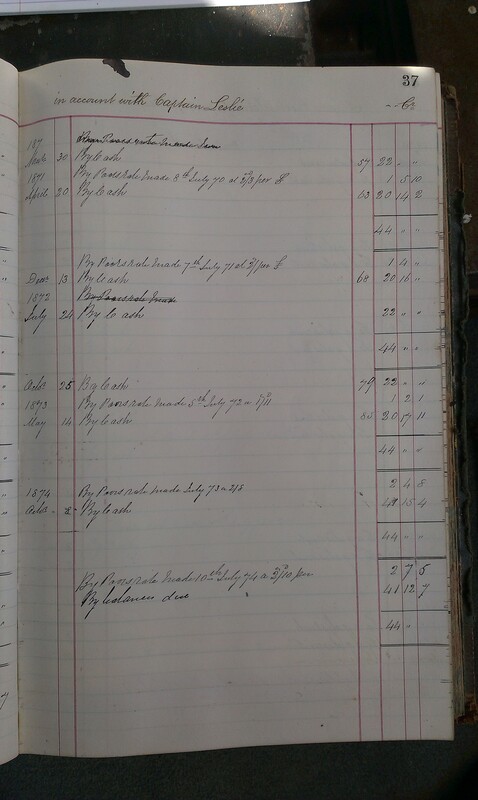 512019. 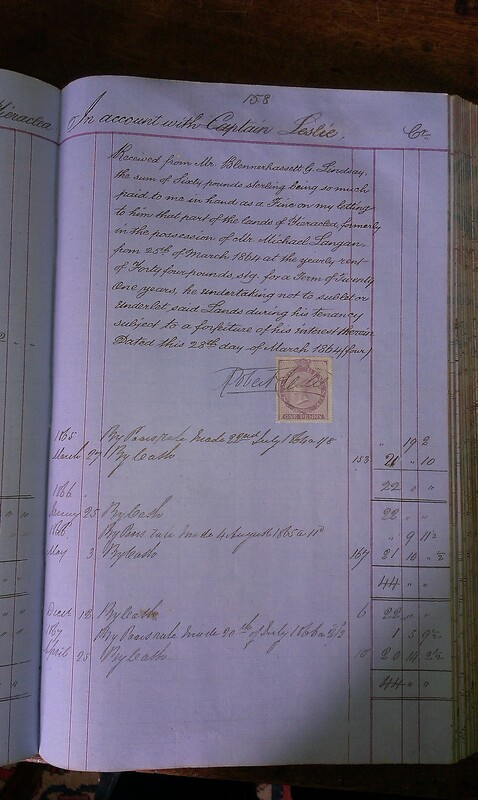 Registered 22 June 1820. 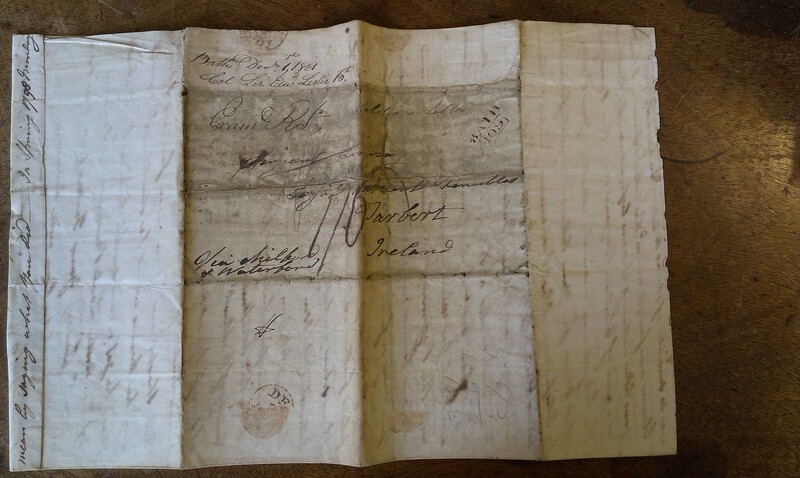 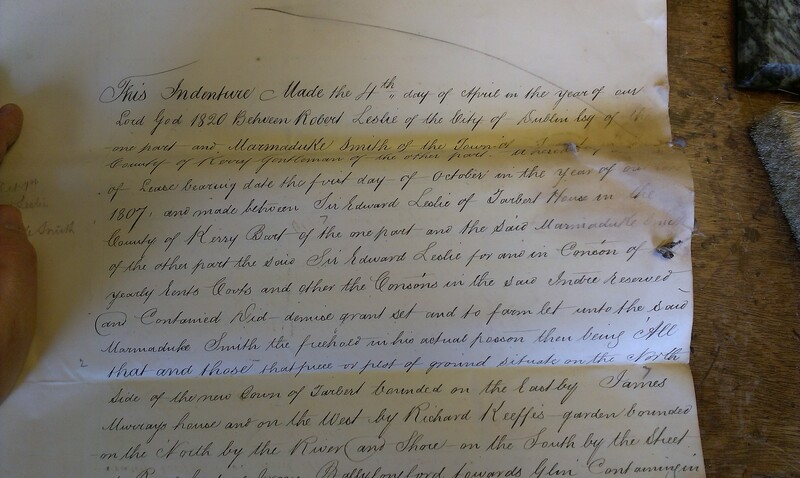 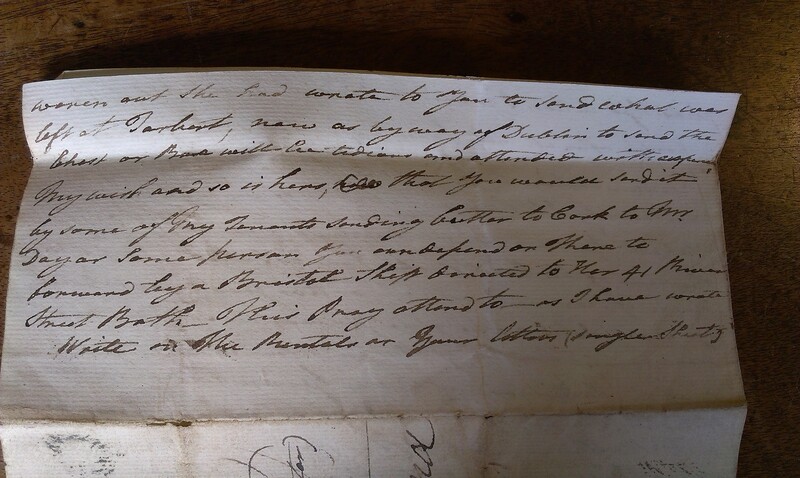 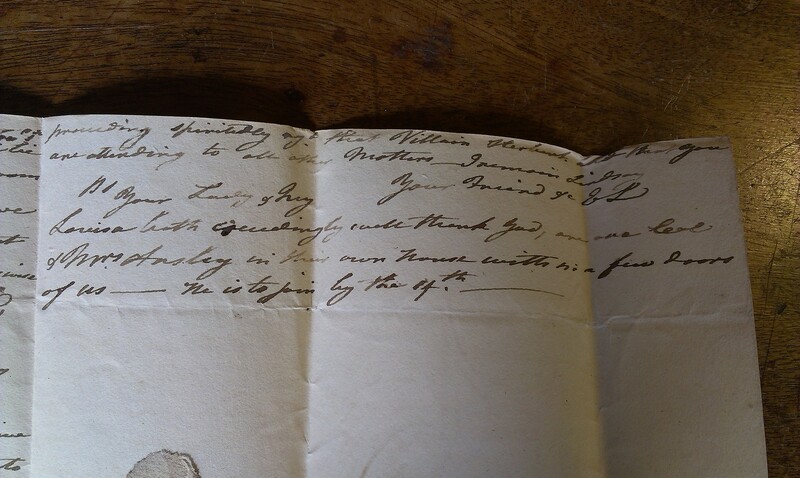 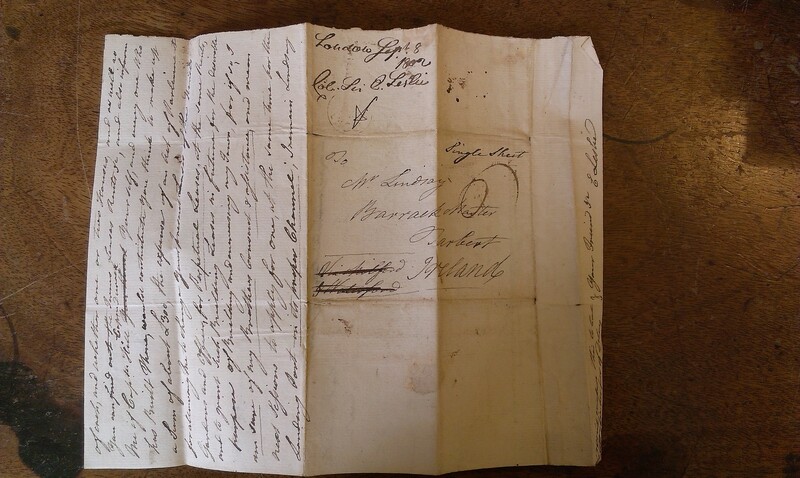 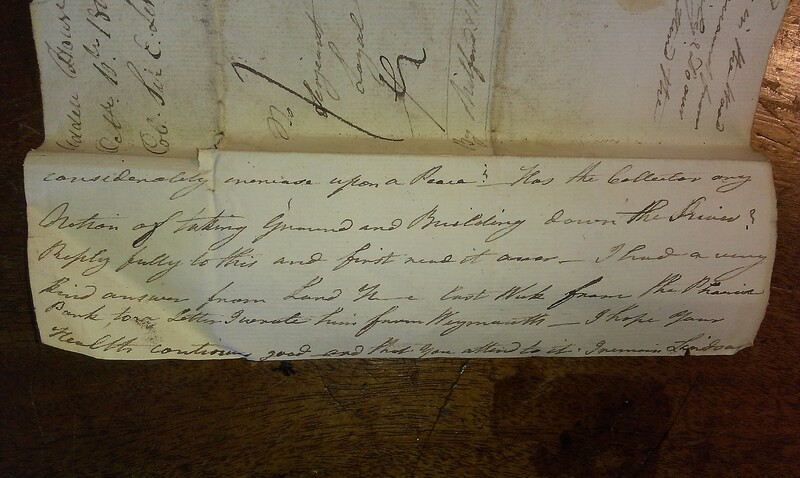 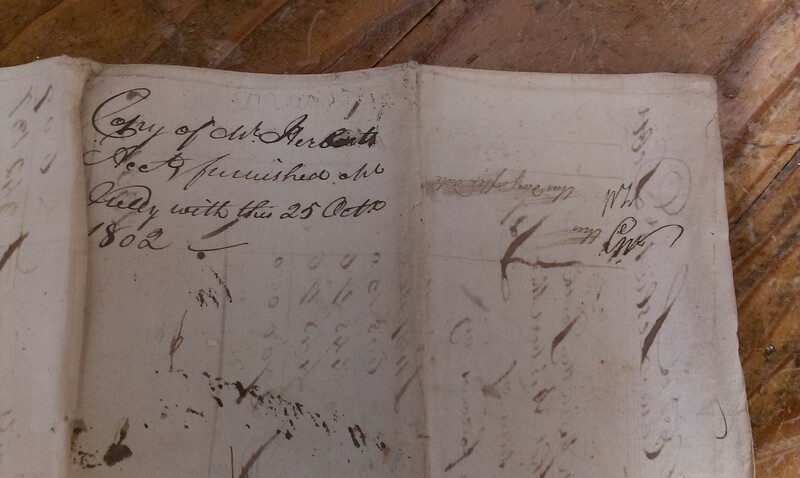 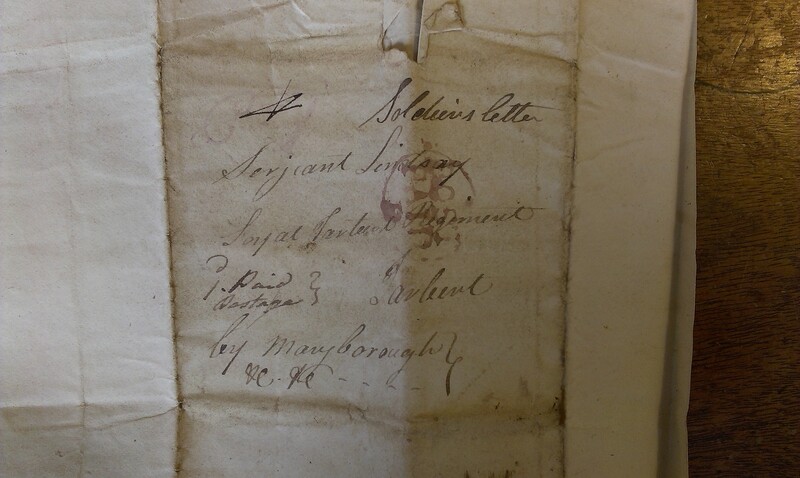 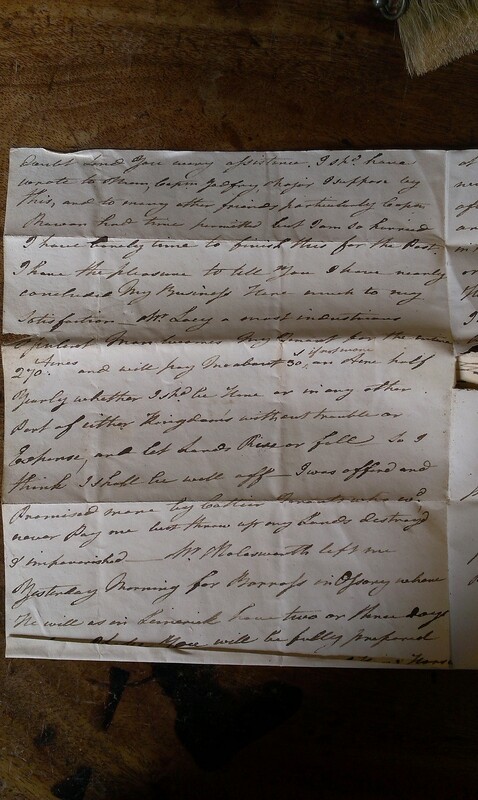 Deed, 9 Feb 1823, Robert Leslie junior, of Tarbert House, to William Lindsay of Tarbert. 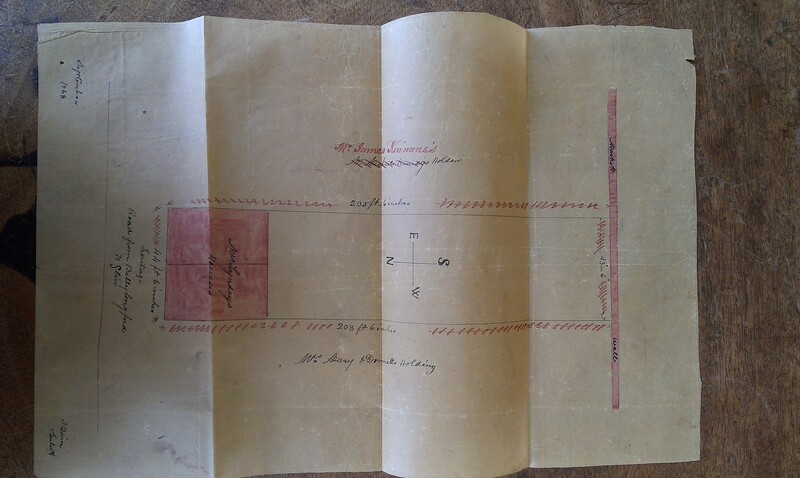 Lease of land of 185 acres. 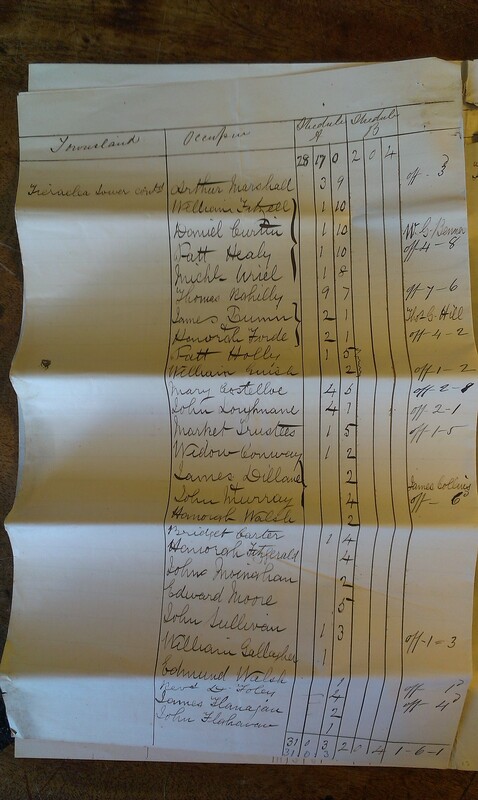 See bottom LHS and RHS. 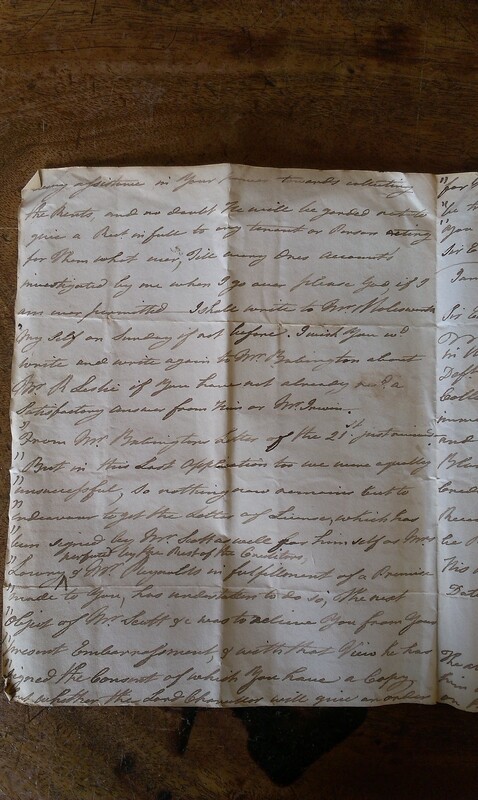 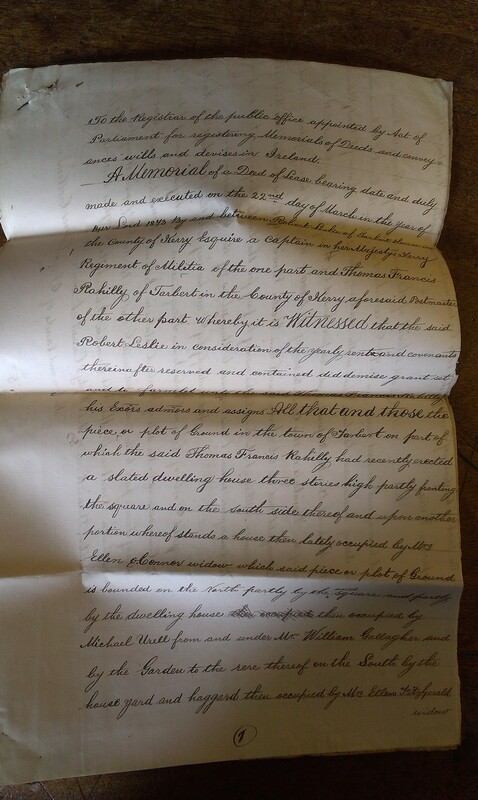 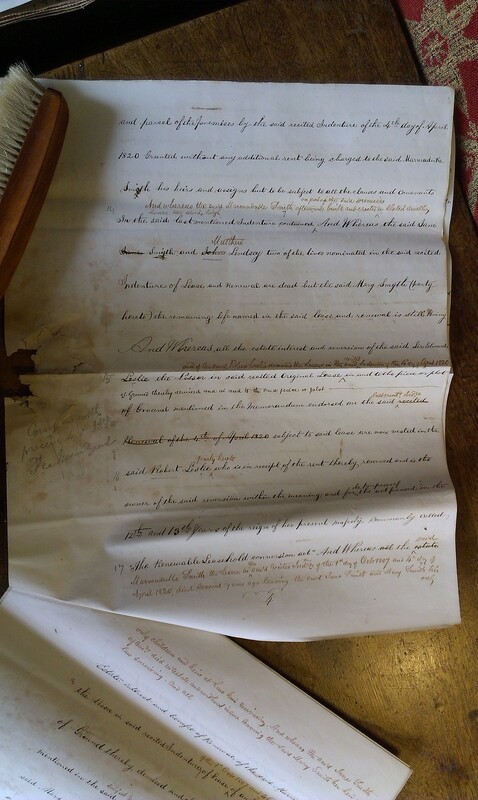 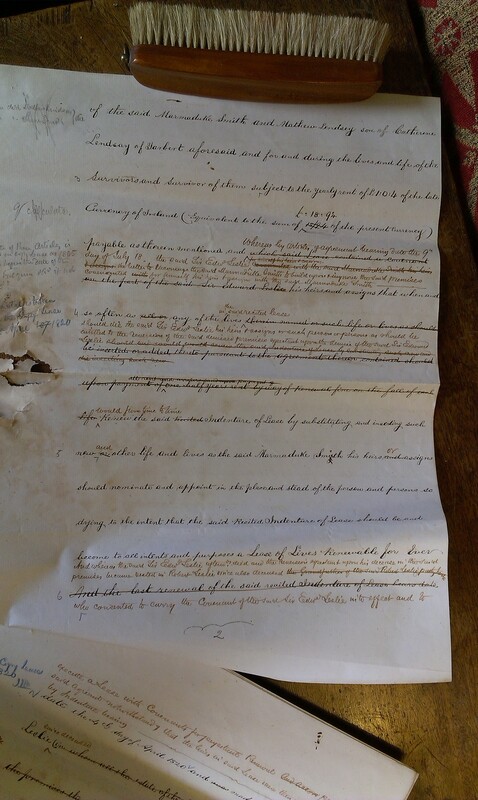 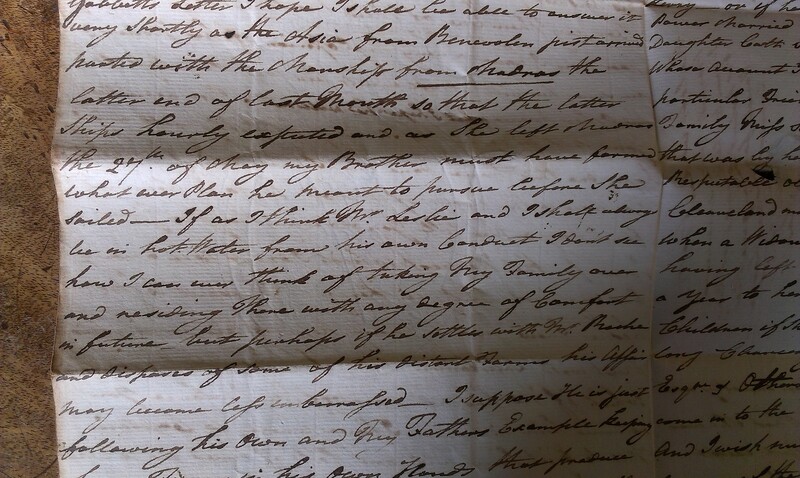 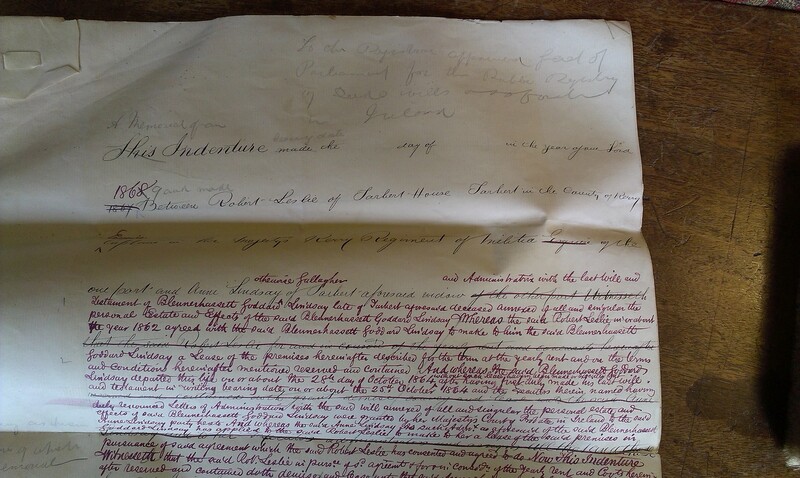 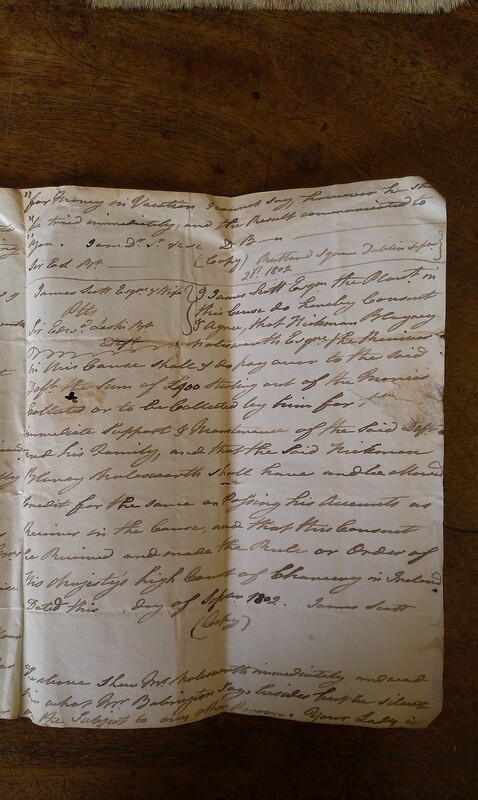 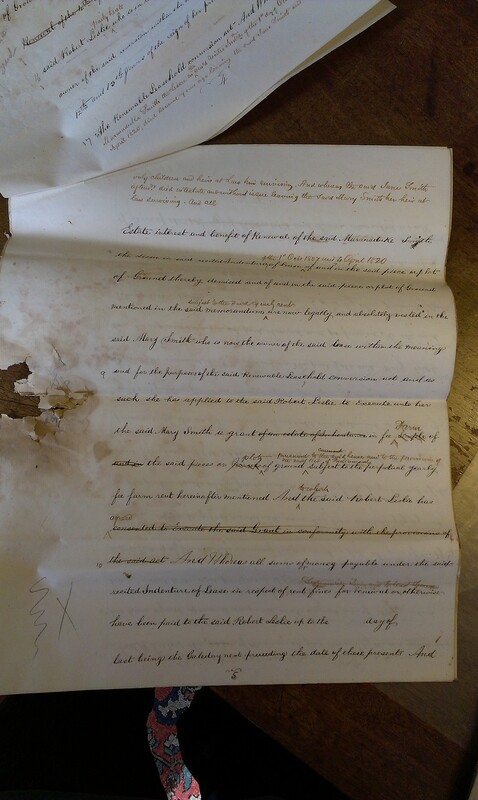 Will of Marmaduke Smith, 12 Feb 1832. 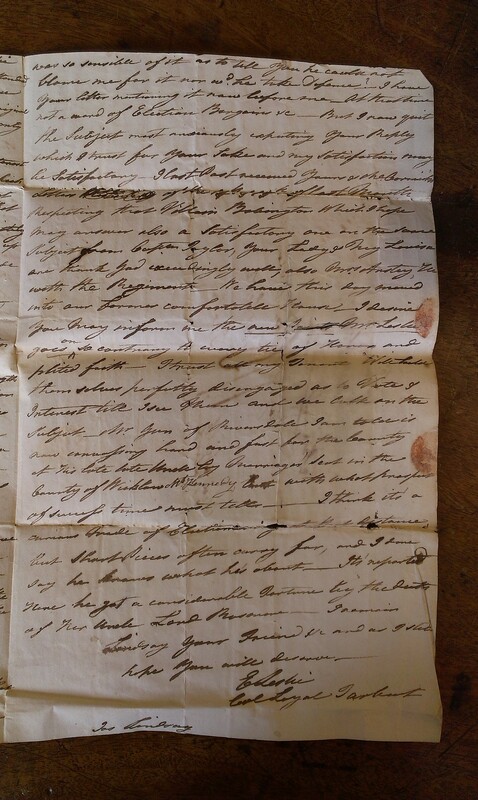 See p.1 and p.2 and p.3. 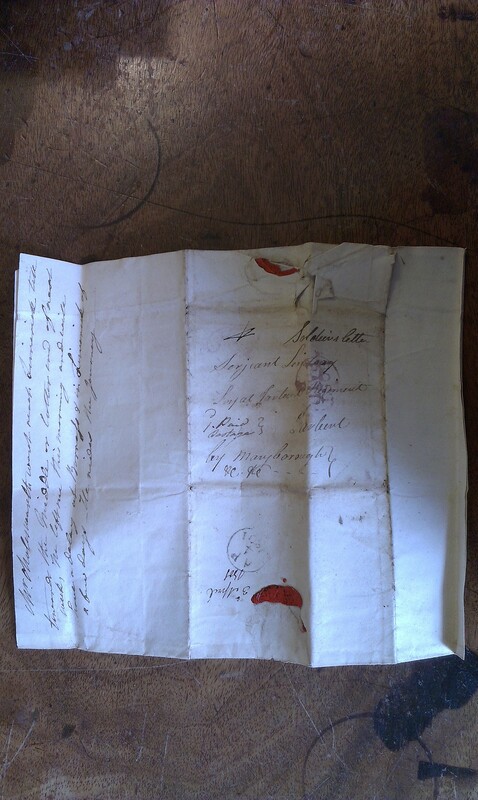 See note. 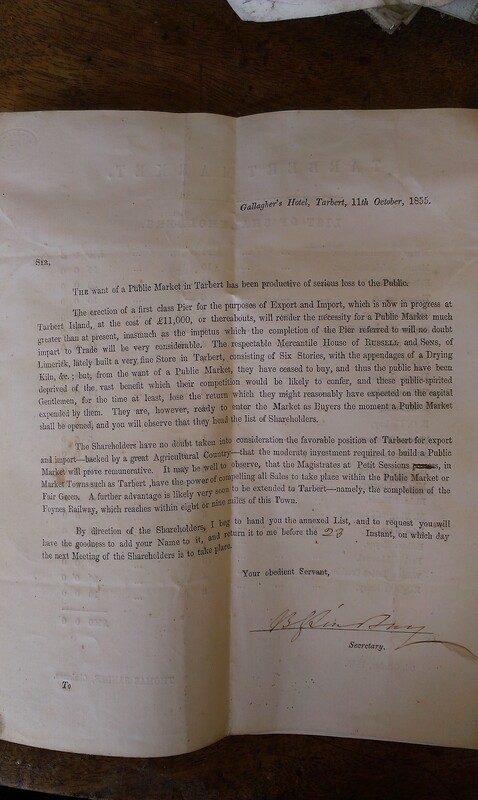 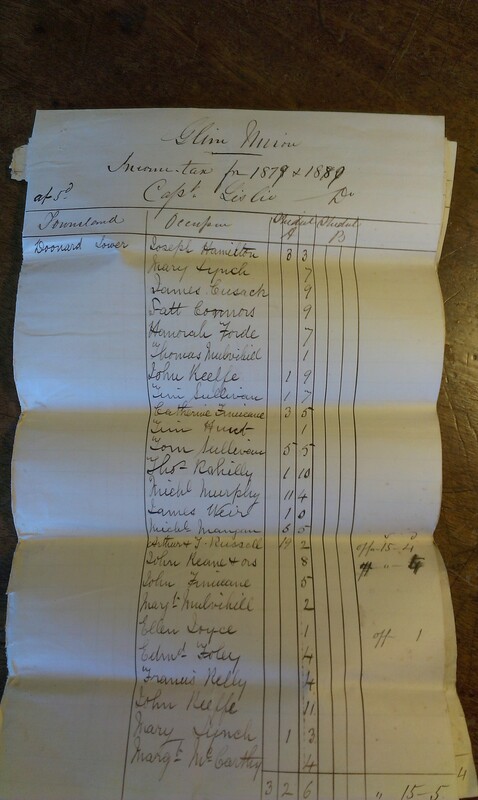 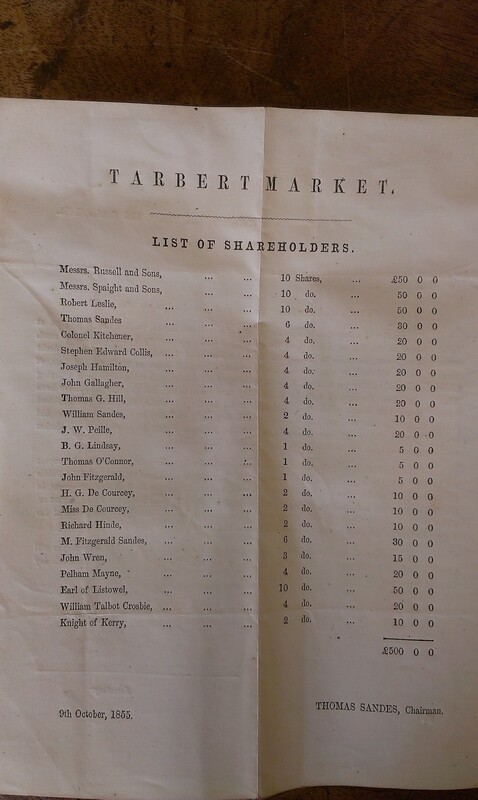 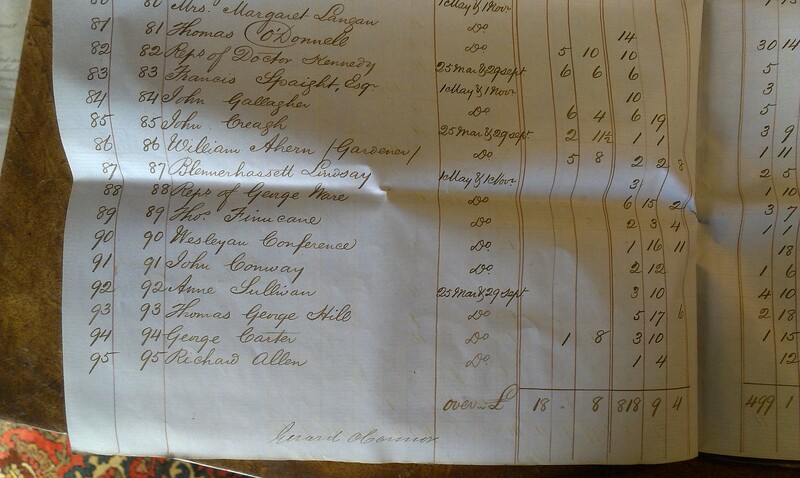 Tarbert Market shareholders, 1855. 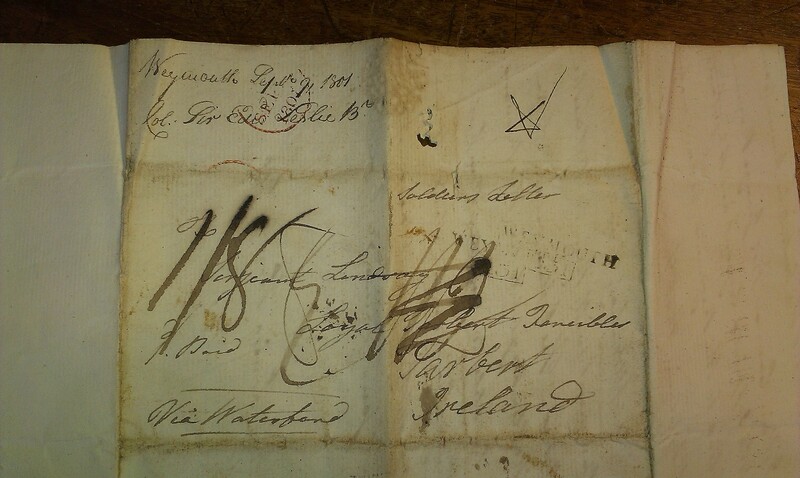 Apparently signed by Blennerhassett Lindsay. 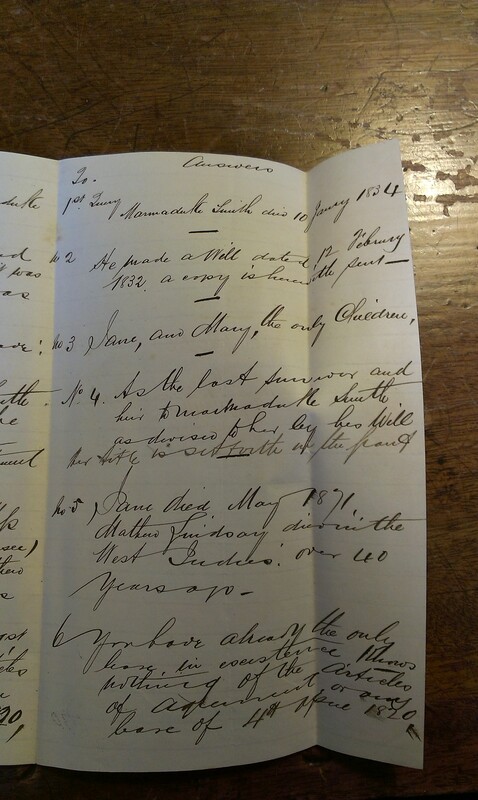 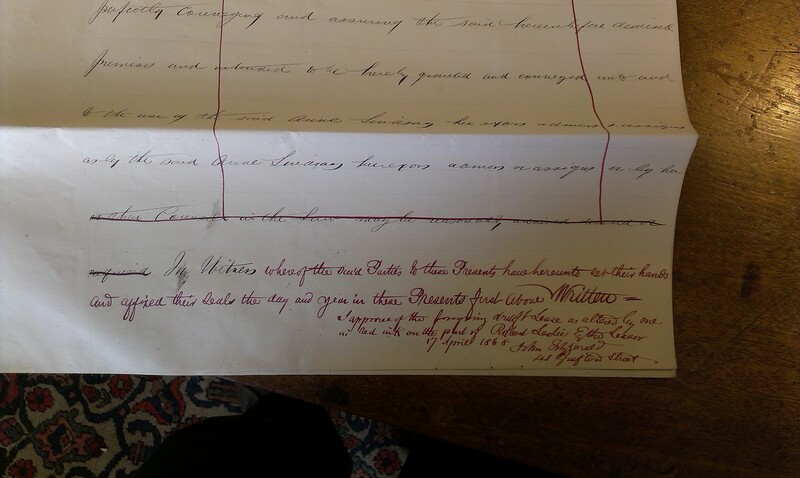 1860-70 accounts for William Lindsay and heirs. 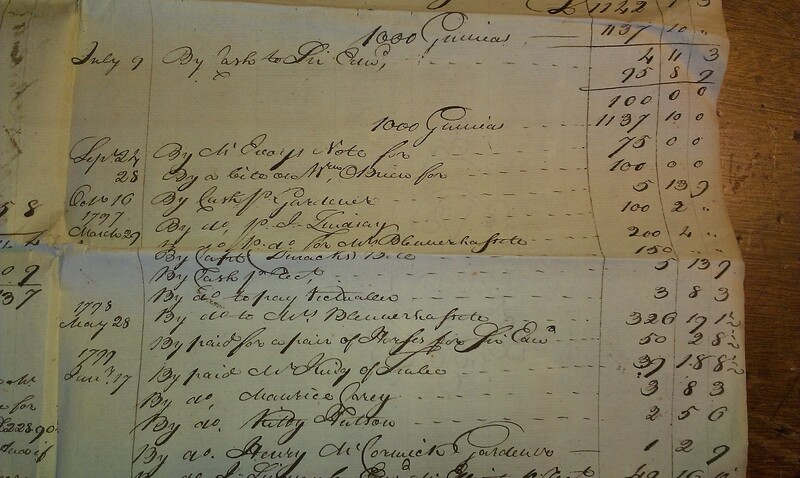 Note that every single name in these accounts is prefaced by "Dr" which presumably is "Debtor". 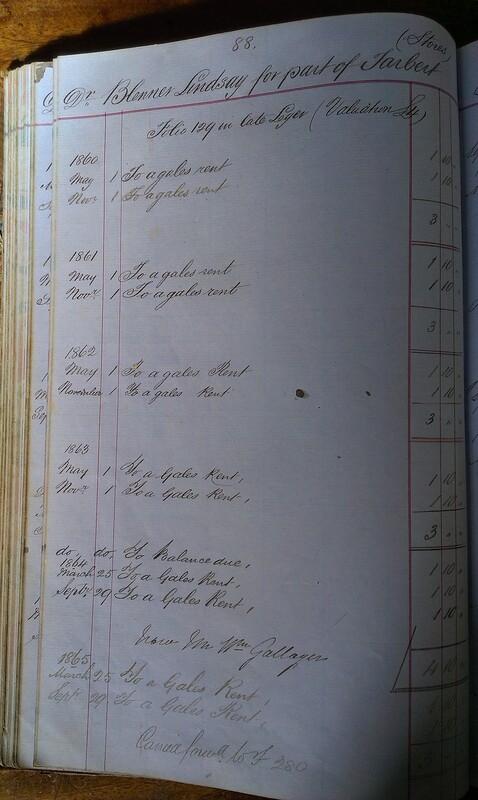 Page 67. 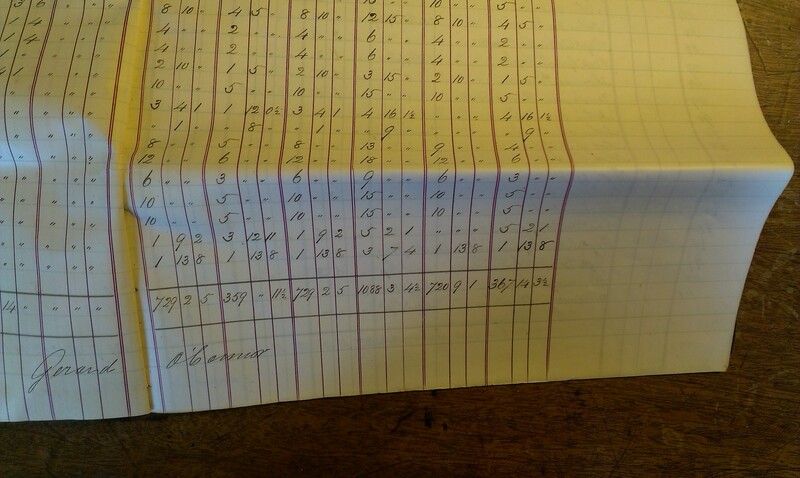 See LHS and RHS. 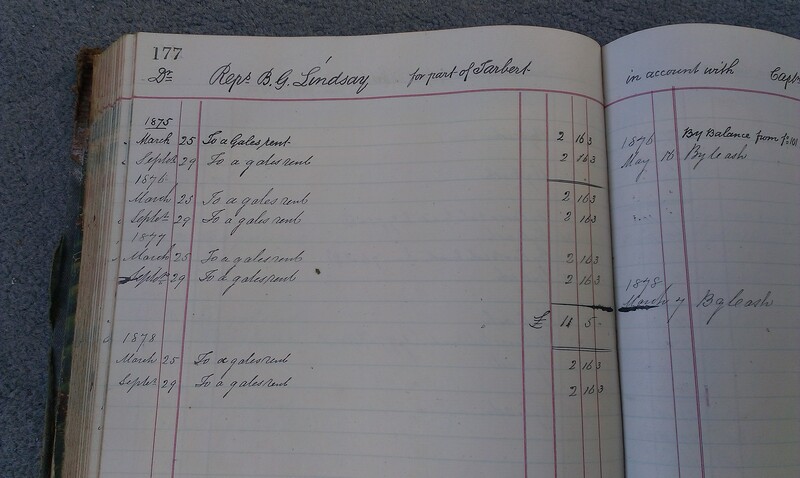 Page 76. 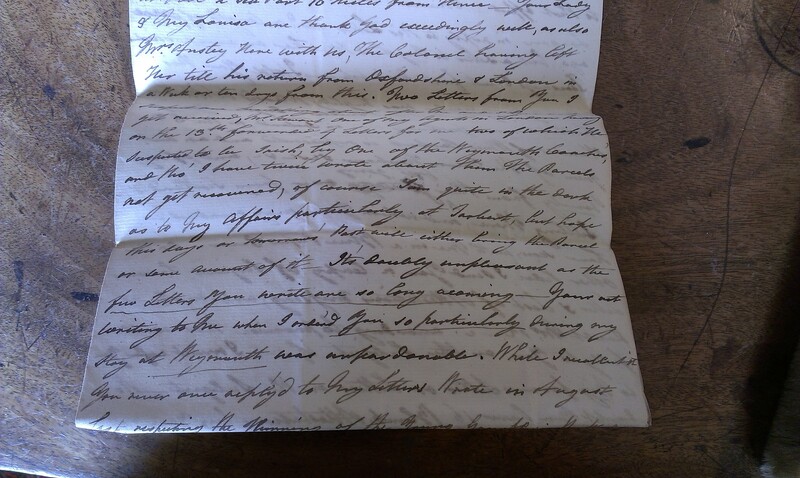 See LHS and RHS. 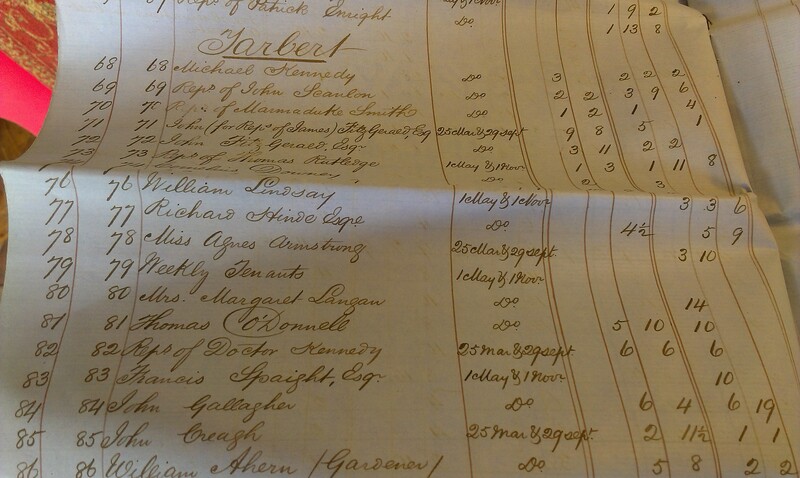 1860-70 accounts for Blennerhassett Lindsay and heirs. 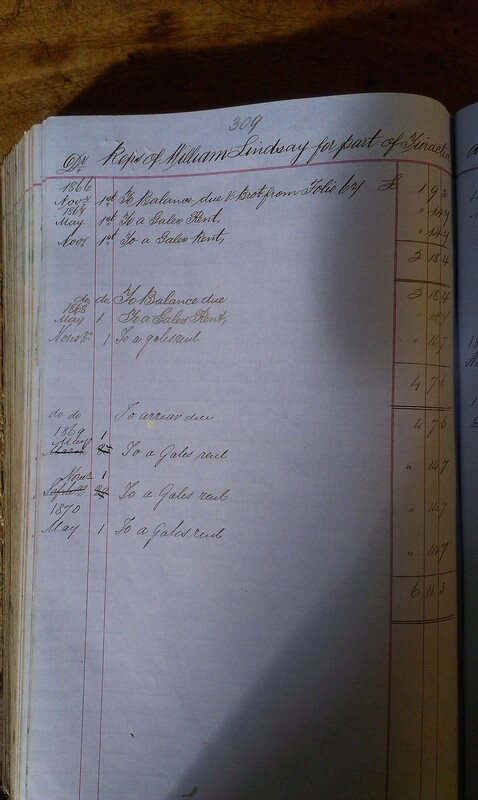 Page 45. 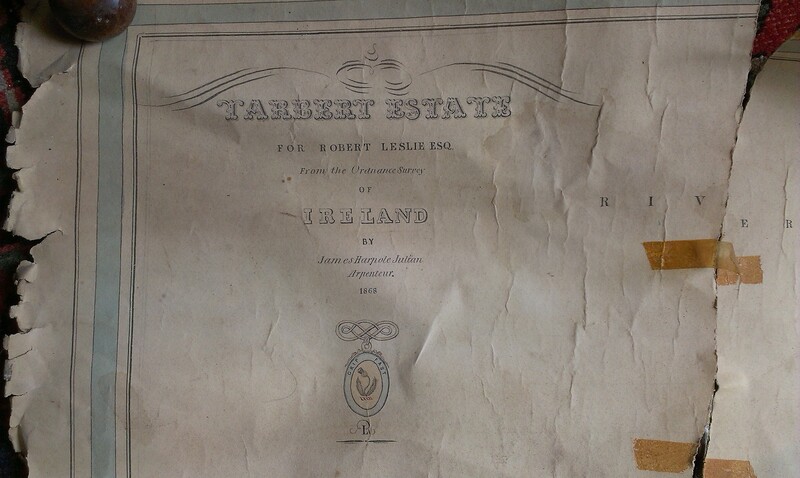 See LHS and RHS. 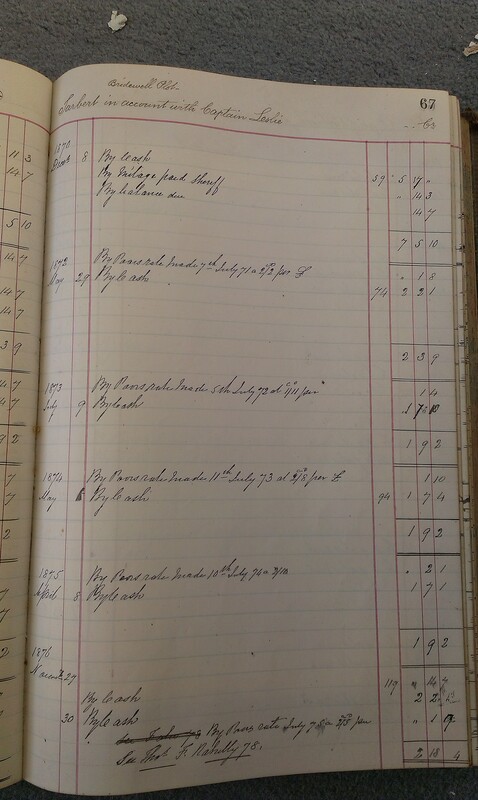 Page 88. 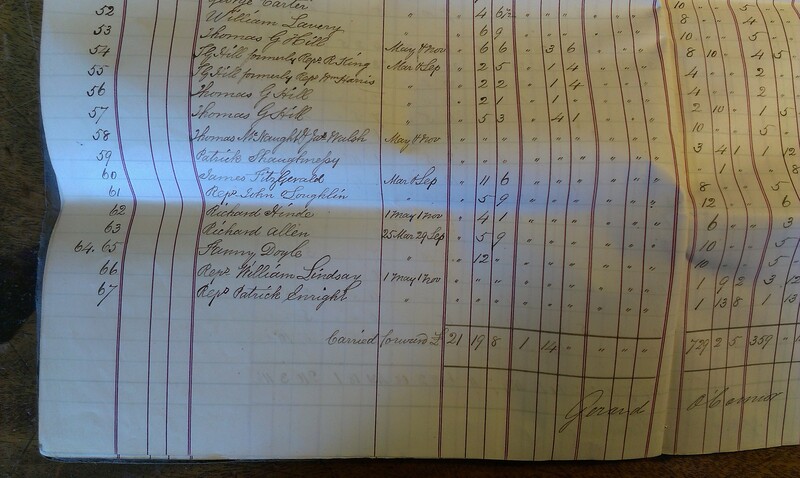 See LHS and RHS. 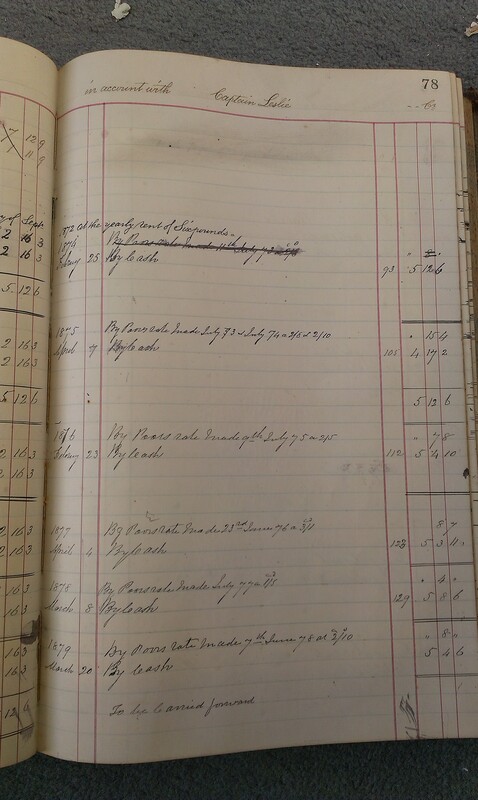 Page 150. 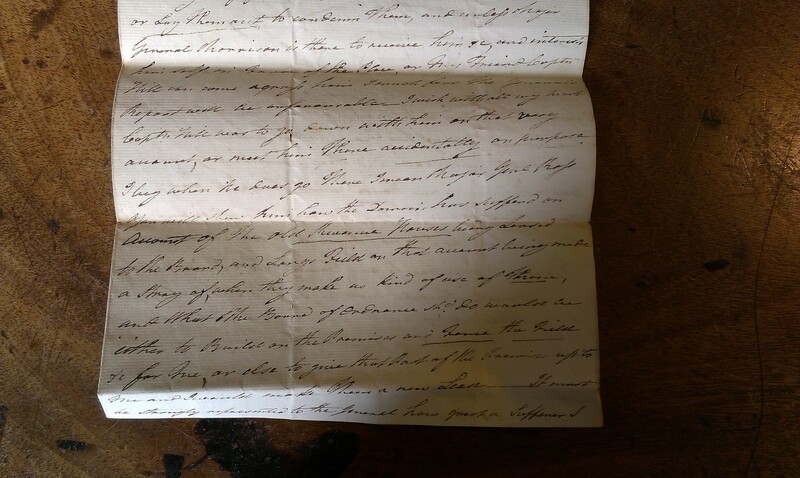 See LHS and RHS. 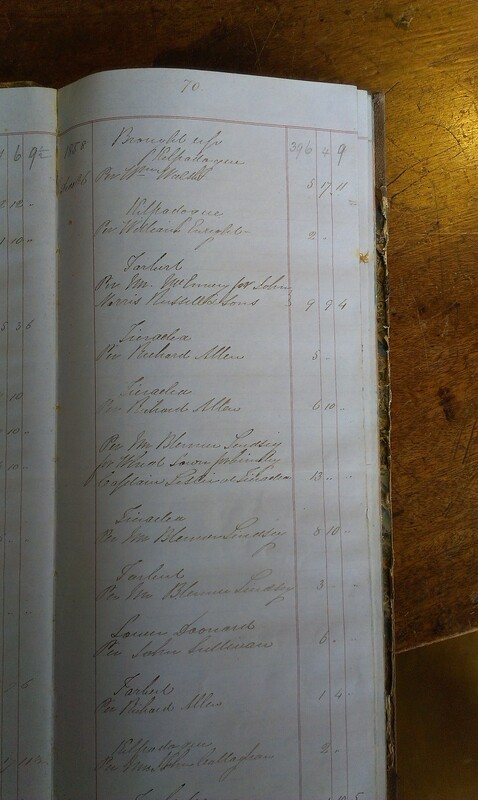 Page 158. 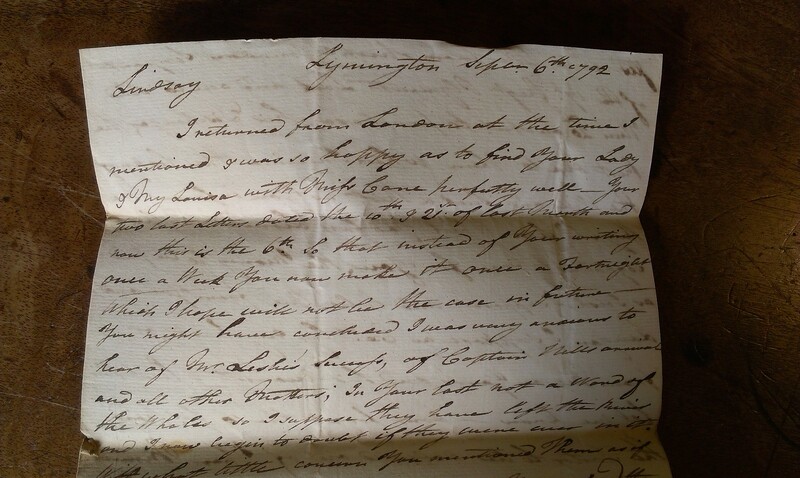 See LHS and RHS. 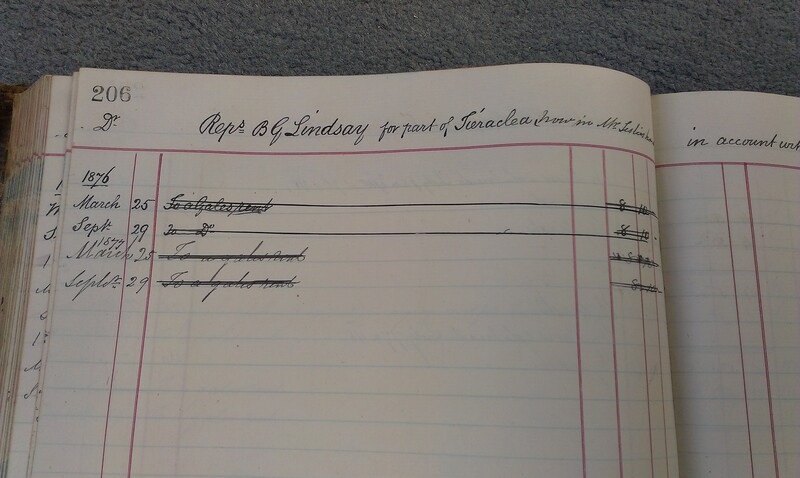 Page 188. 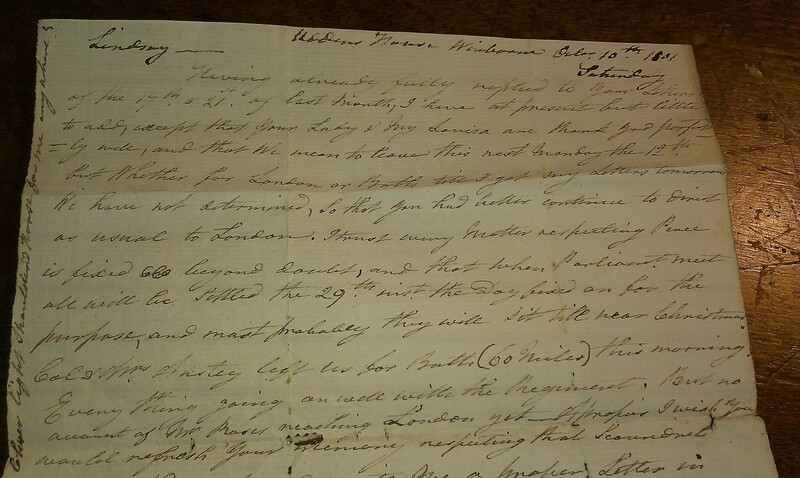 See LHS and RHS. 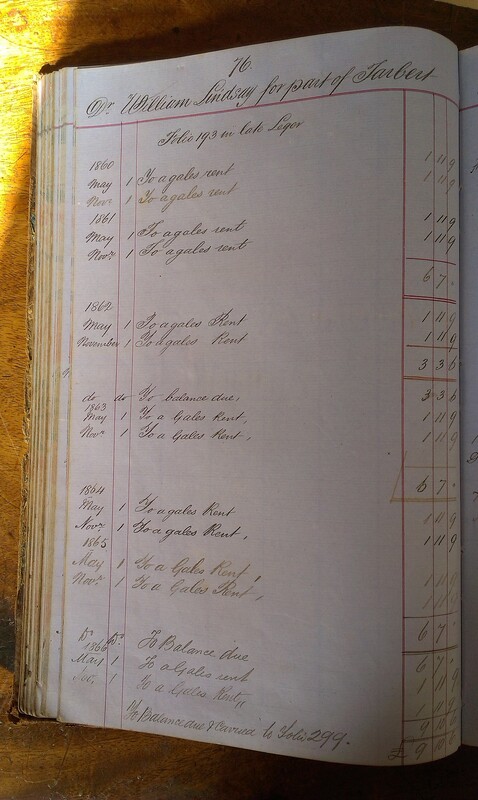 Page 268. 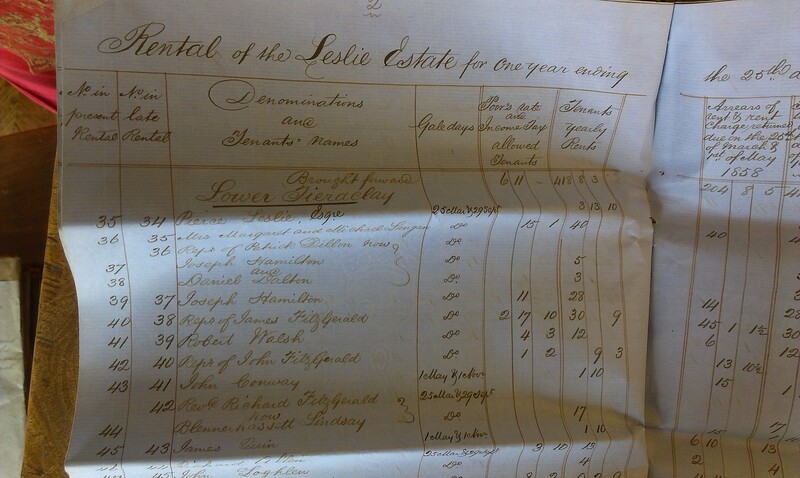 See LHS and RHS. 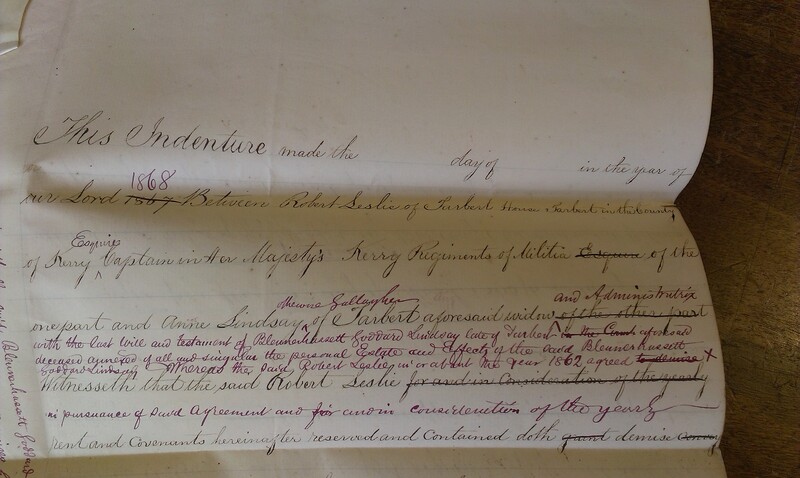 Instructions for lease, Robert Leslie to Blennerhassett Lindsay, 15 Oct 1862. 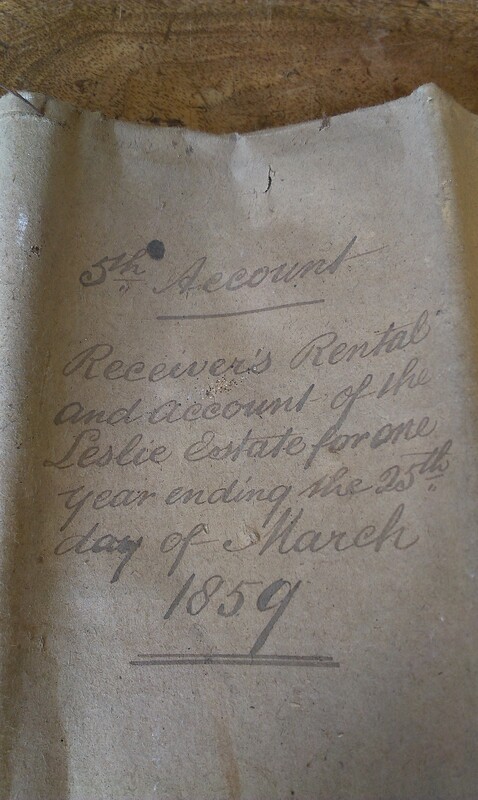 With a note saying lease was in draft as at 29 Oct 1863. 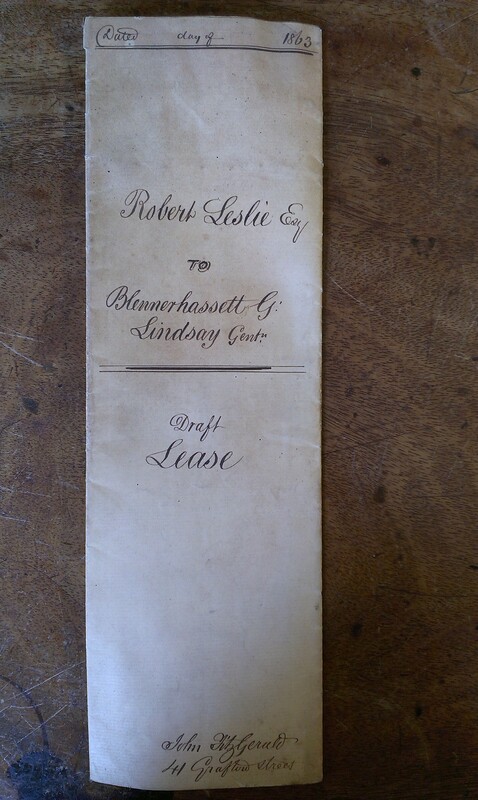 Draft lease, Robert Leslie to Blennerhassett Lindsay, 1862-63. 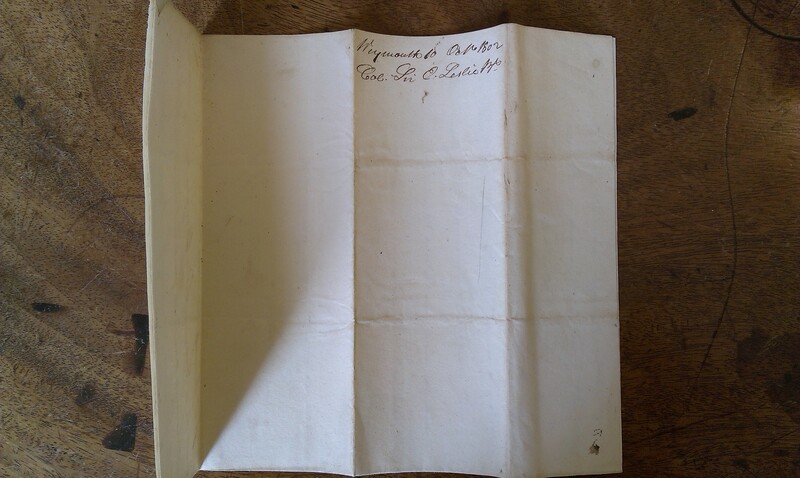 See cover and p.1 top and p.1 middle. 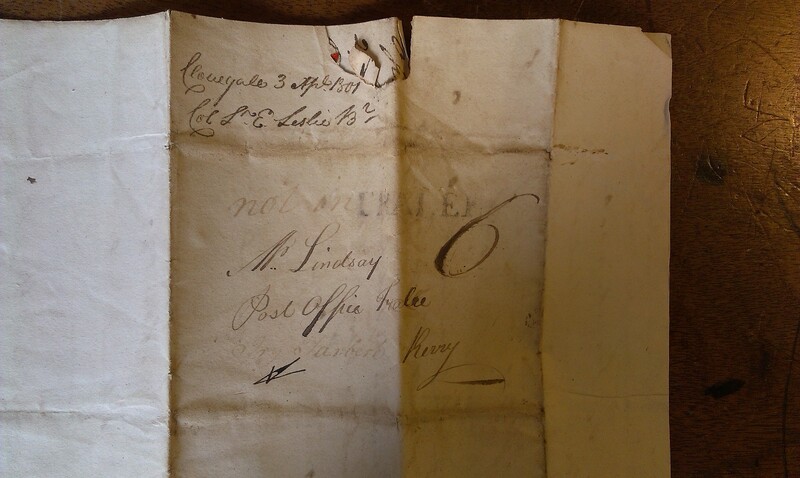 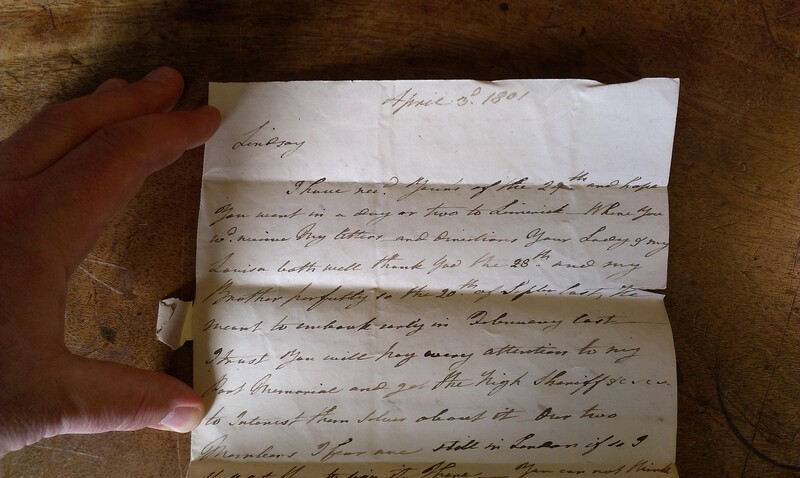 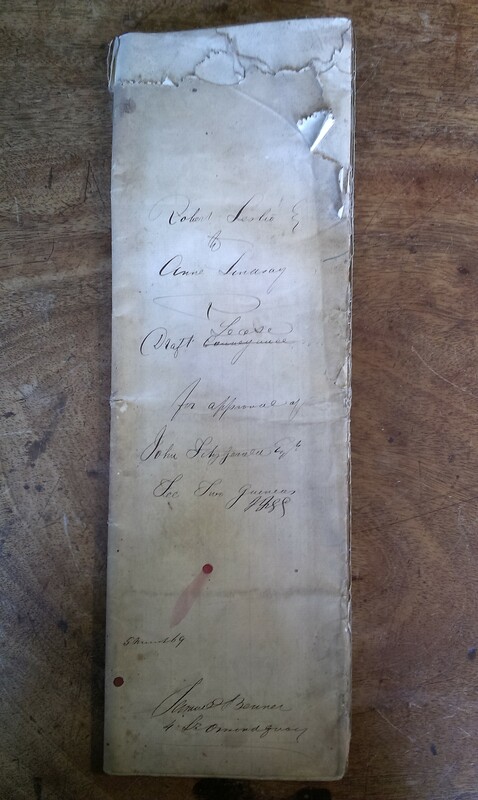 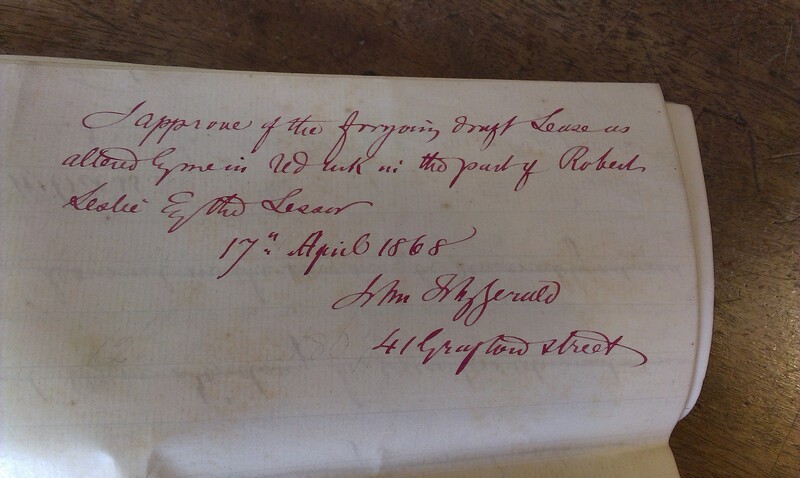 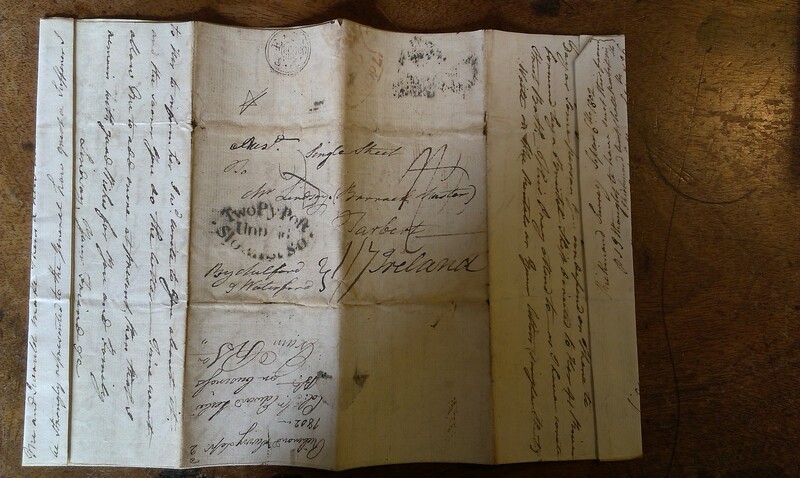 Draft lease, Robert Leslie to Anne Lindsay, 17 Apr 1868. 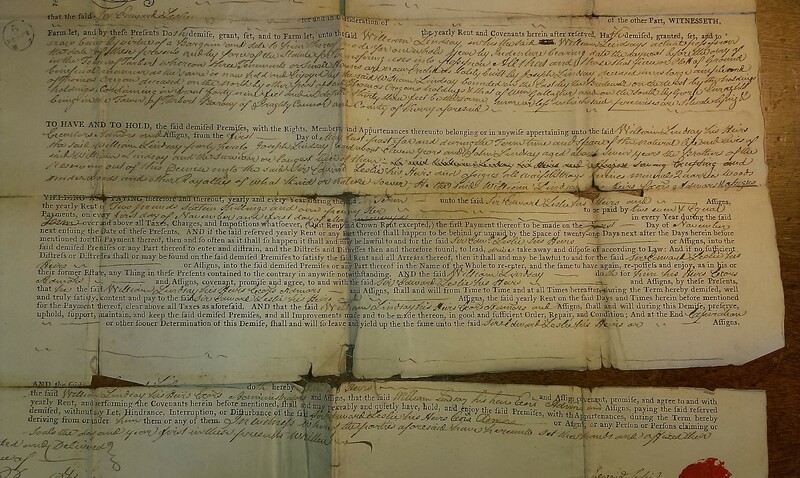 See cover and p.1 top and p.1 middle and p.1 bottom and end. 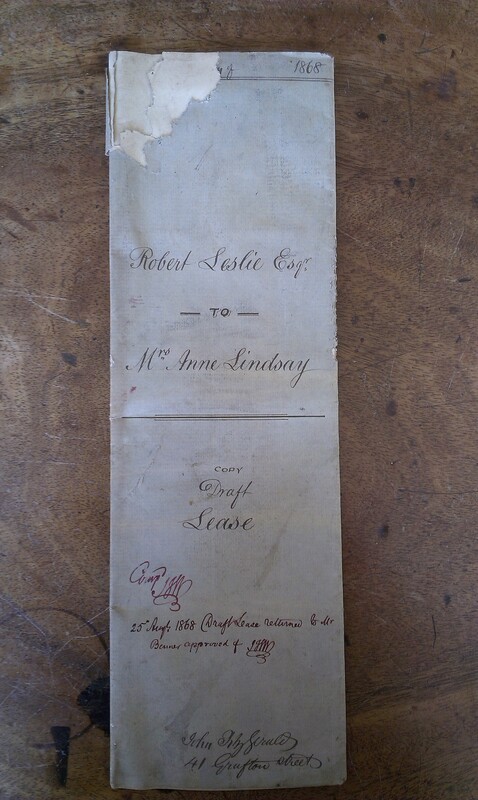 Draft lease, Robert Leslie to Anne Lindsay, 25 Aug 1868. 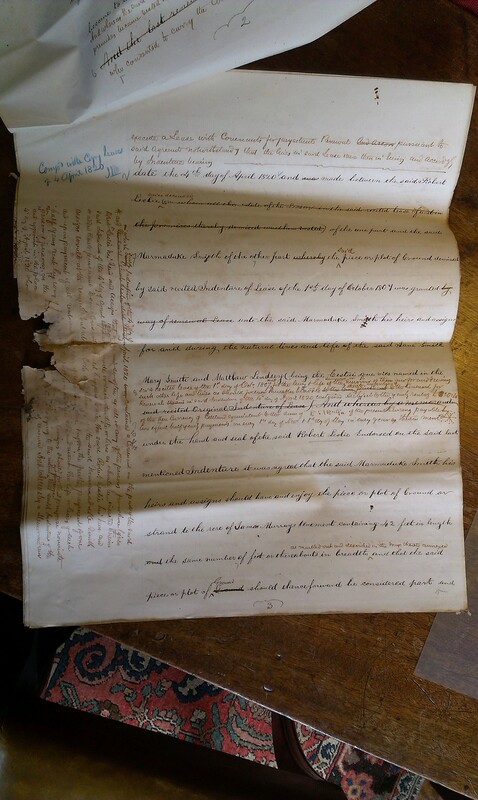 See cover and p.1 top and p.1 middle and p.1 bottom and side and end. 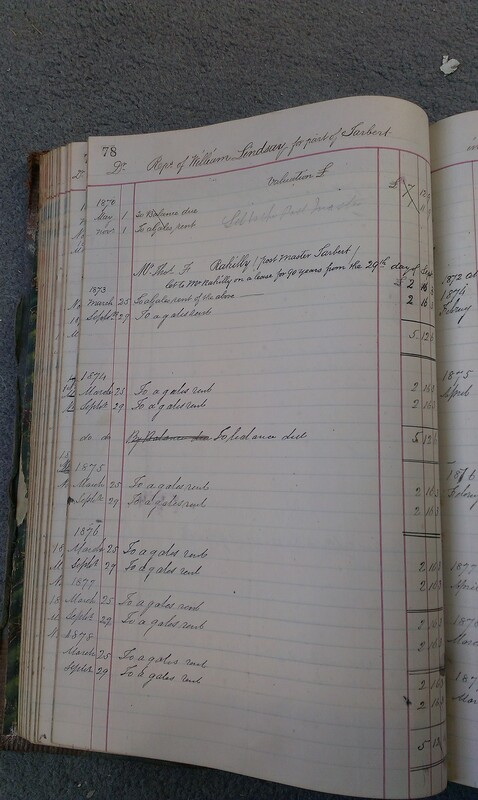 See p.1 top LHS and RHS. 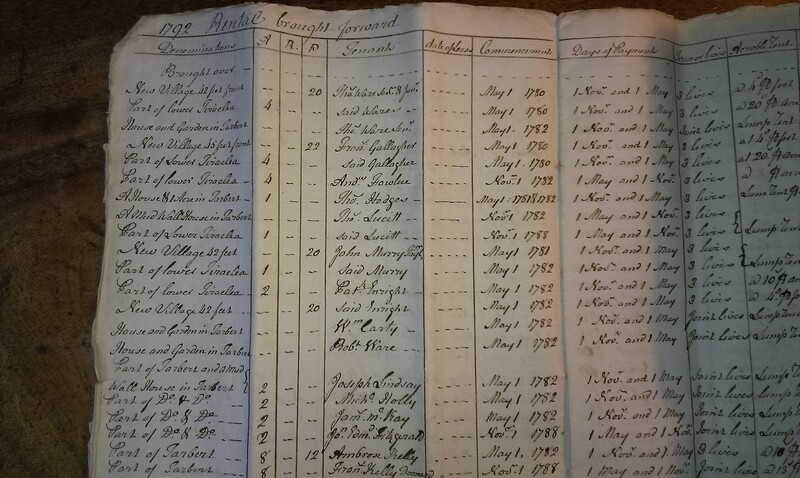 See p.1 middle LHS and RHS. 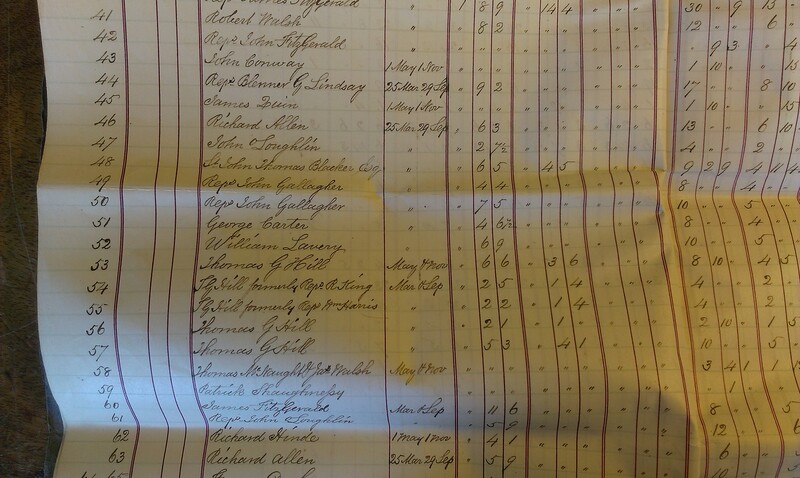 See p.1 bottom LHS and RHS. 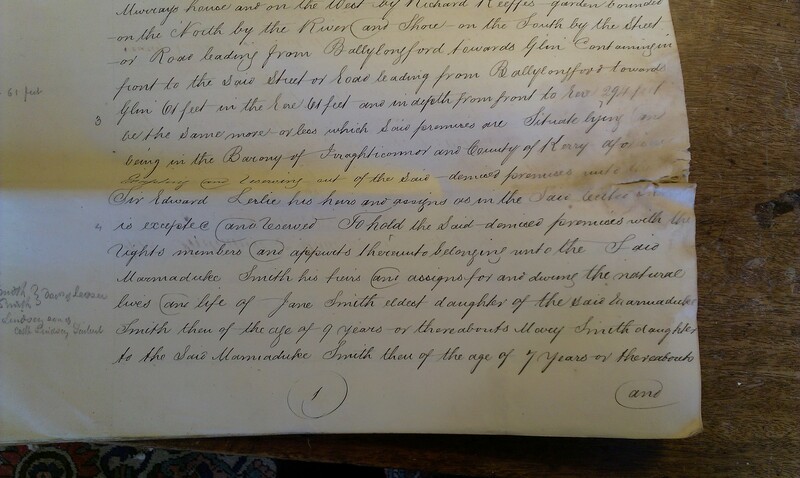 See p.2 LHS and RHS. 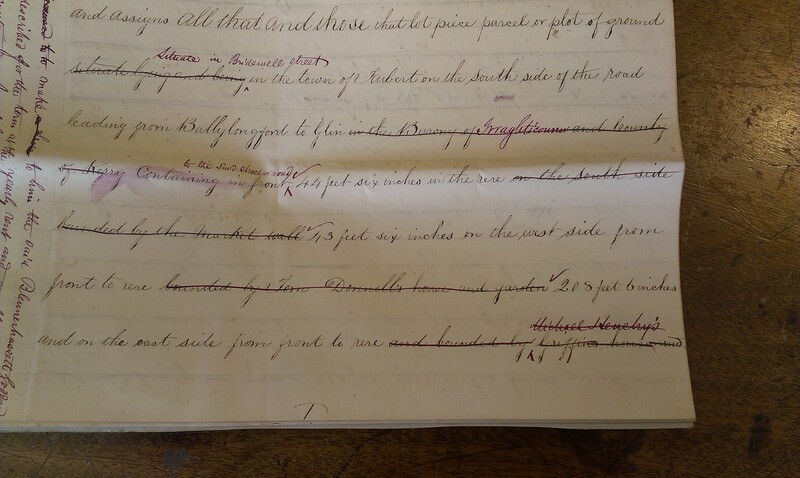 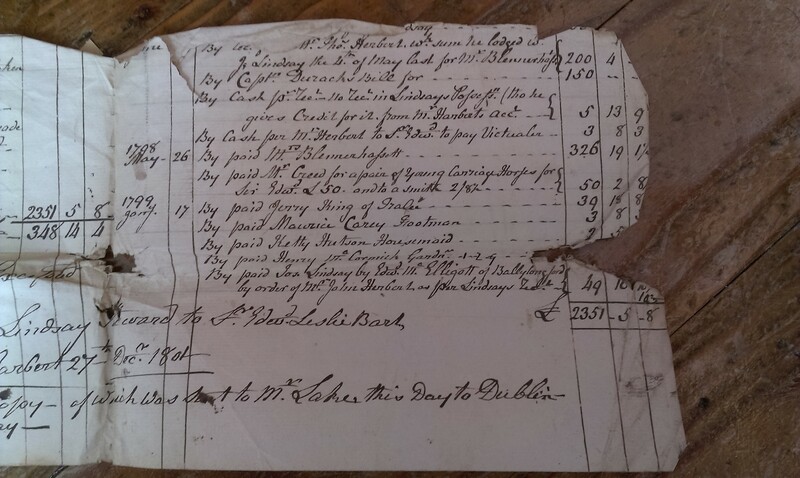 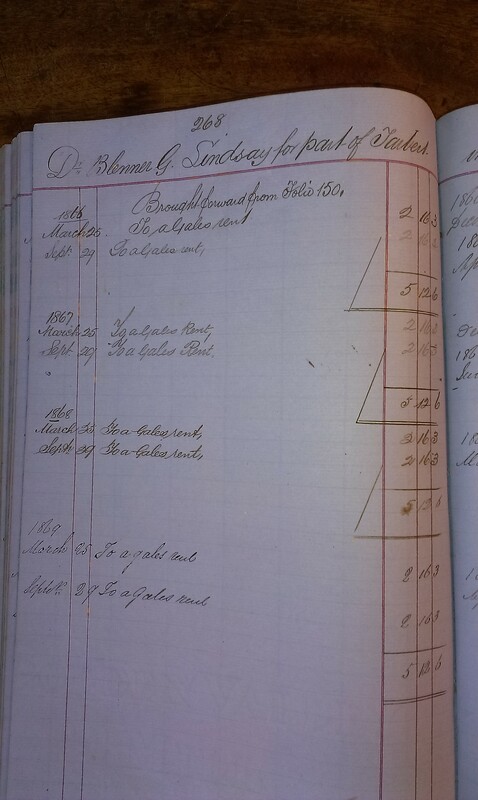 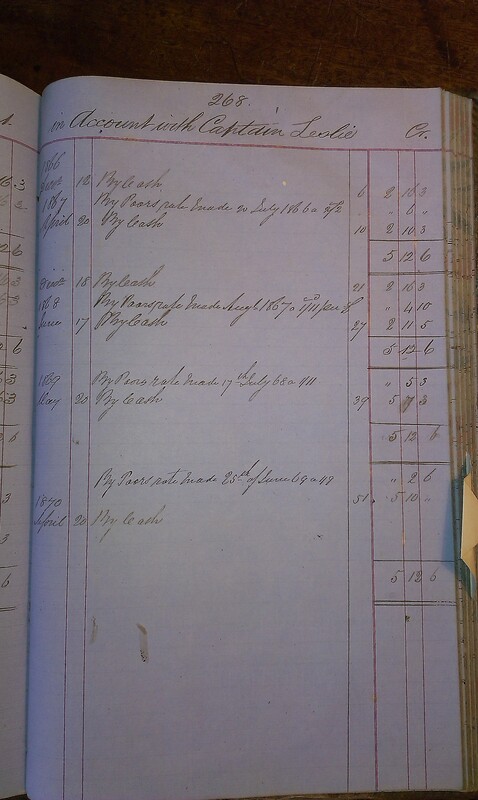 1870-78 accounts for Blennerhassett Lindsay heirs. 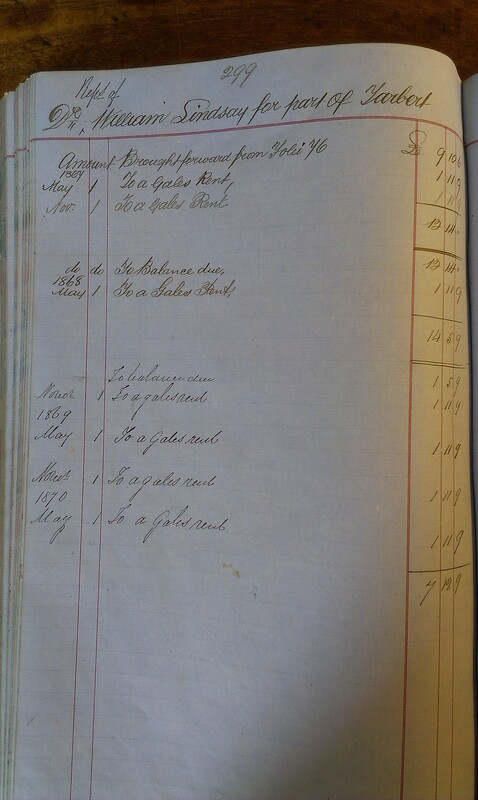 Page 37. 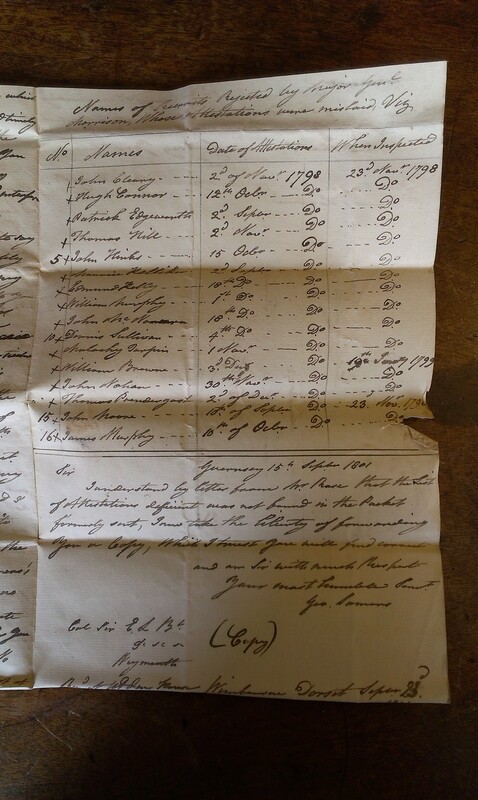 See LHS and RHS. 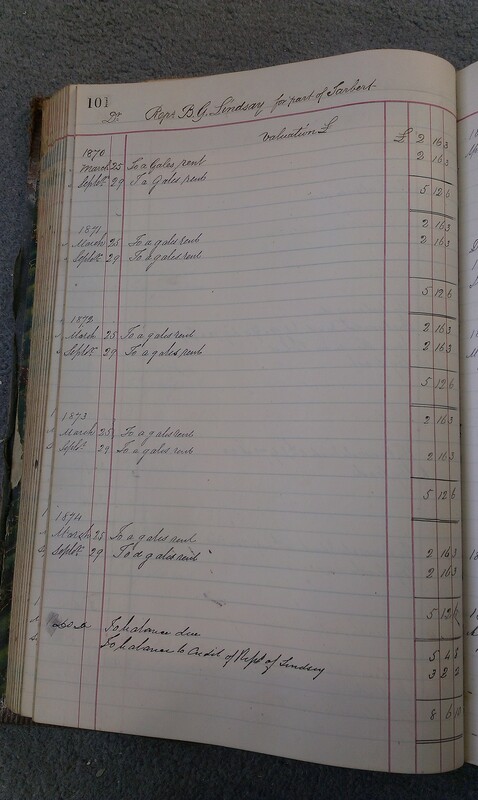 Page 101. 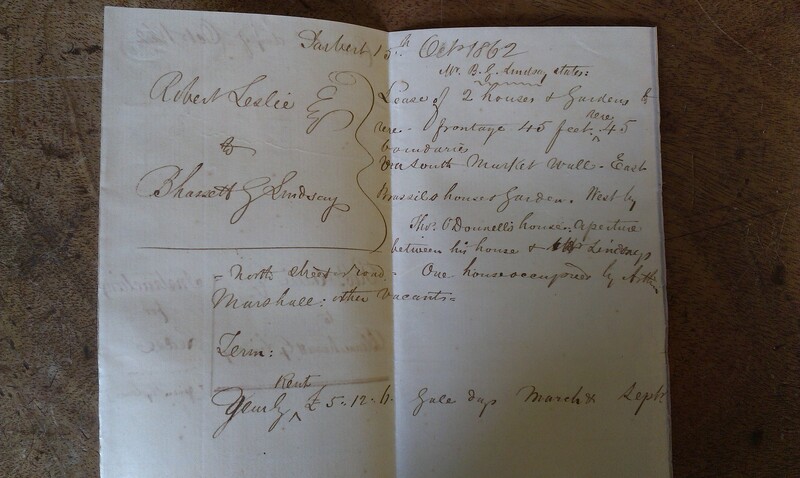 See LHS and RHS. 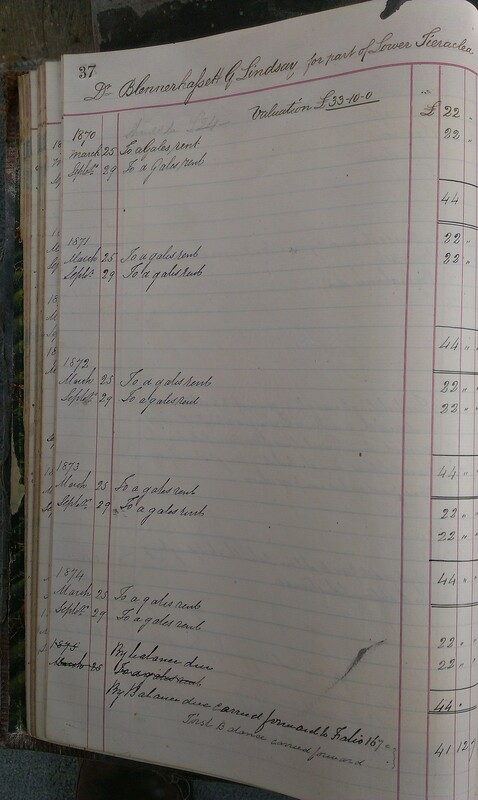 Page 167. 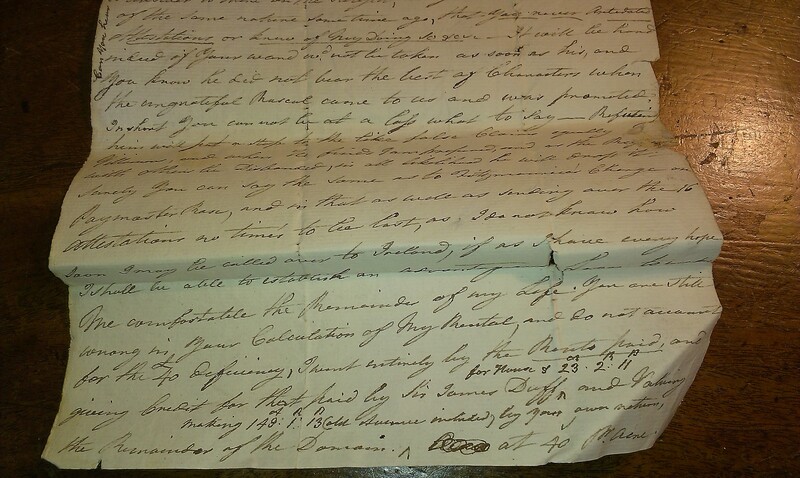 See LHS and RHS. 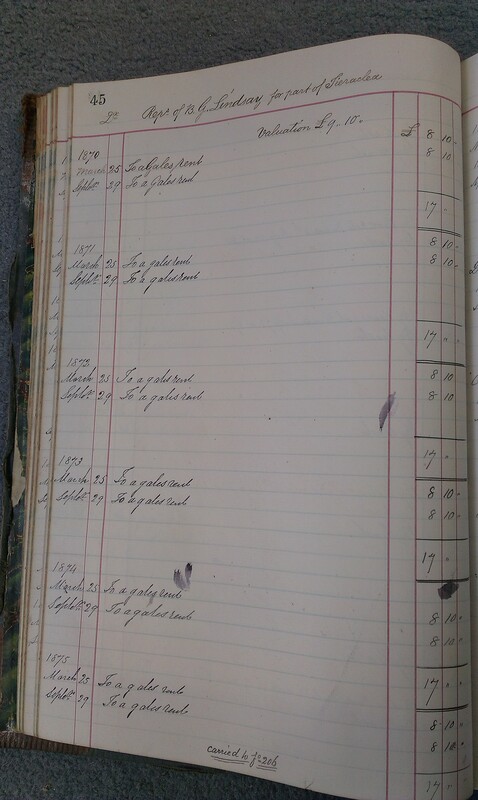 Page 177. 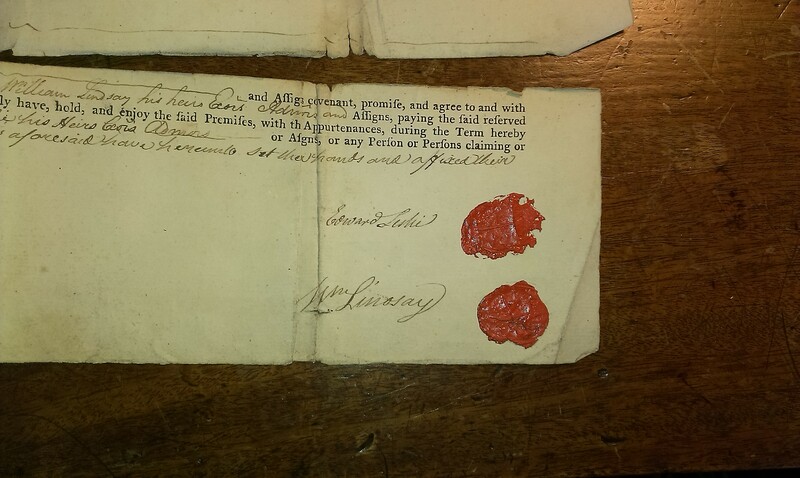 See LHS and RHS. 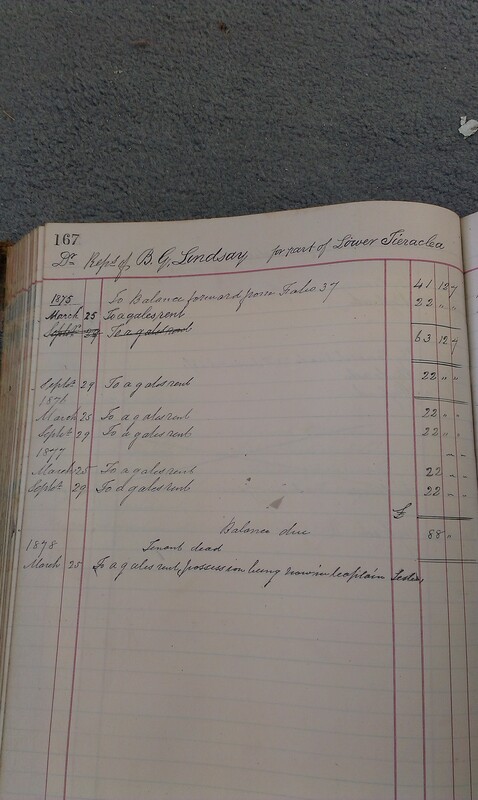 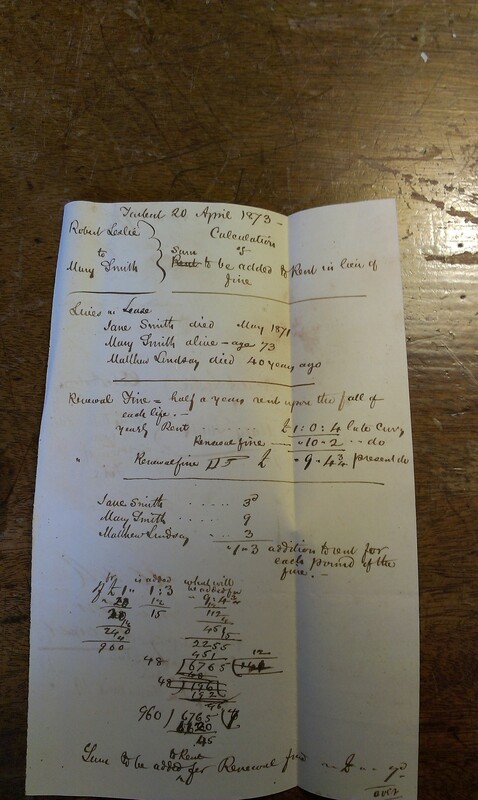 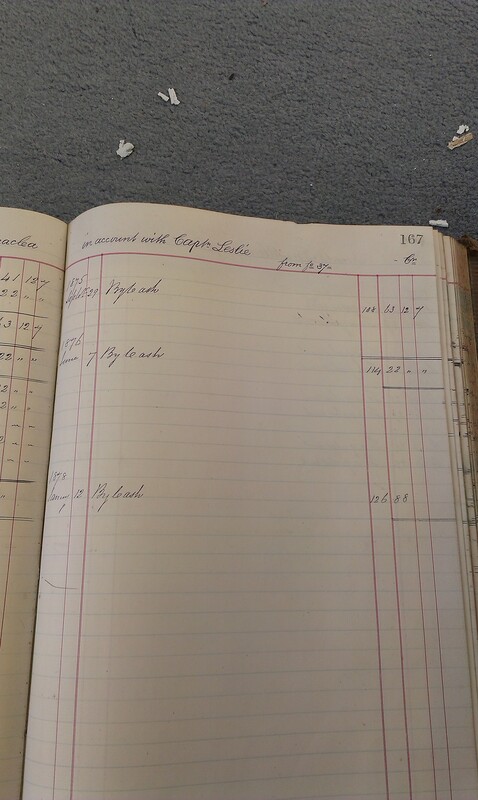 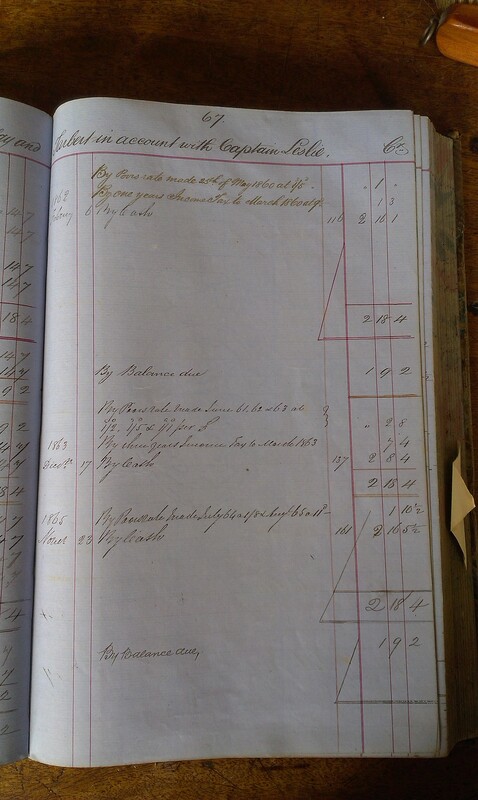 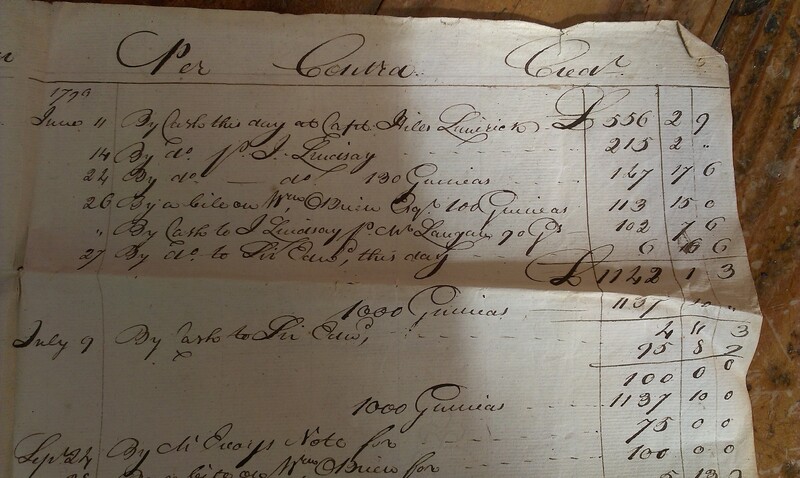 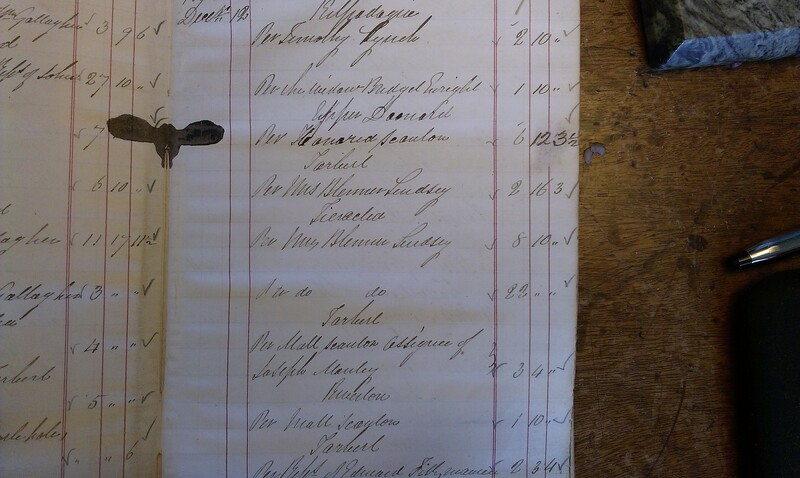 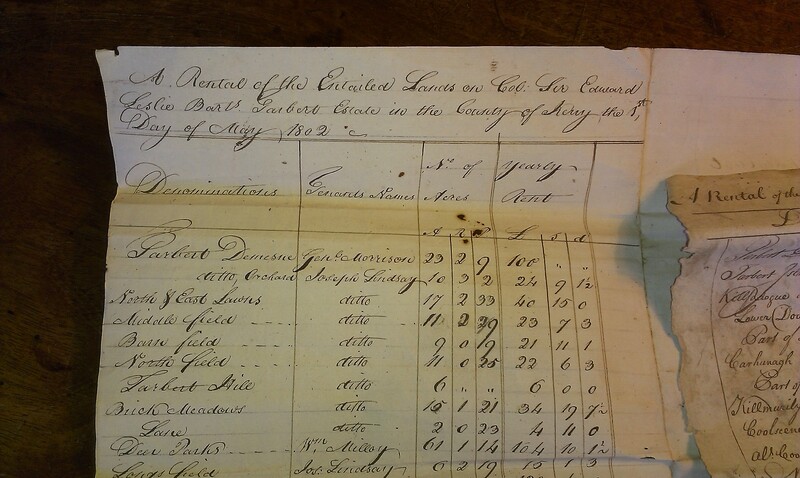 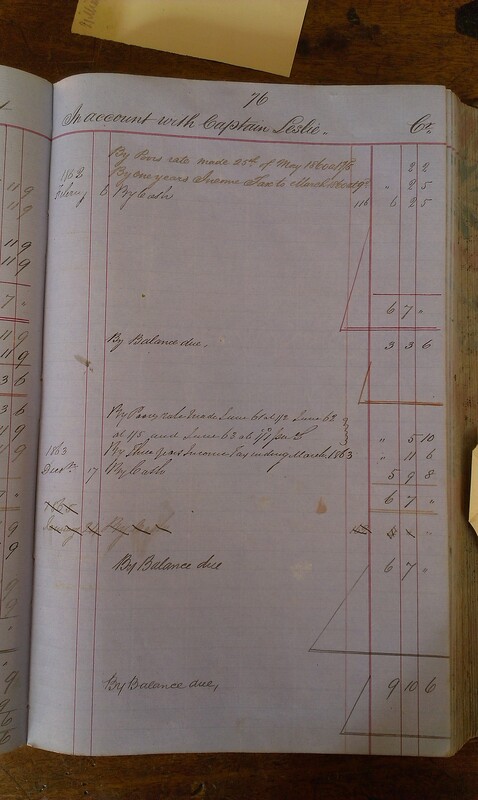 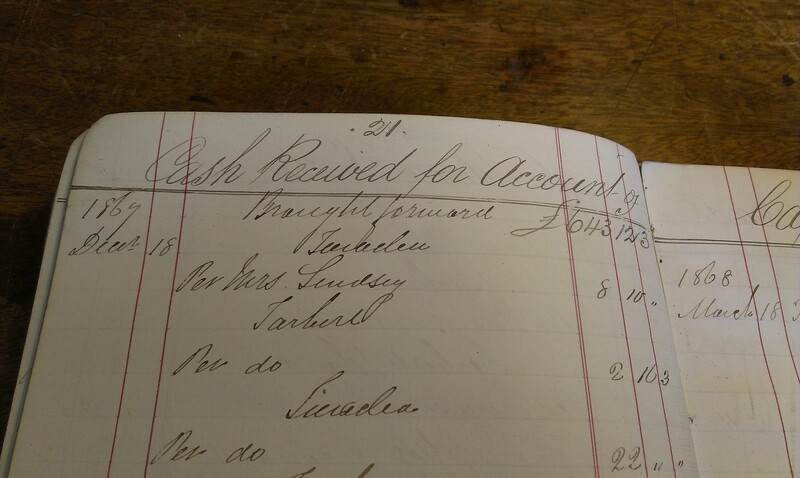 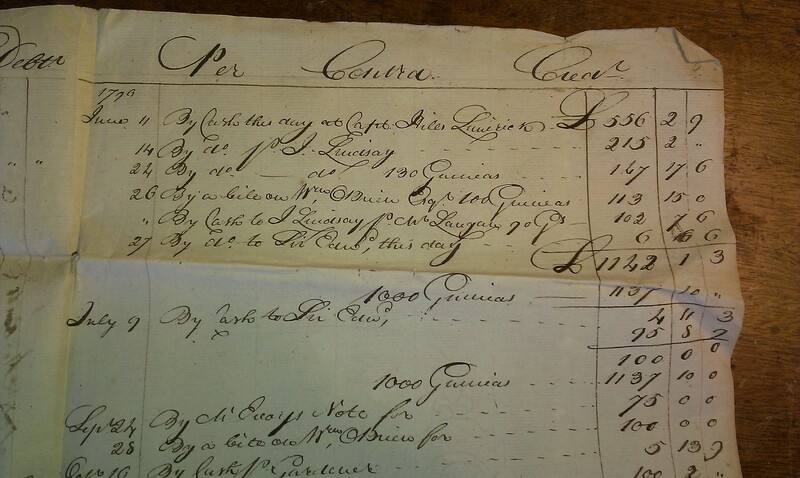 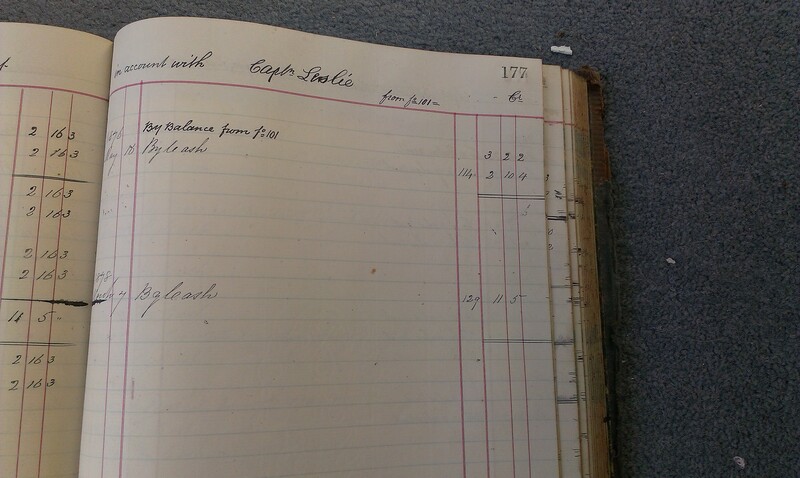 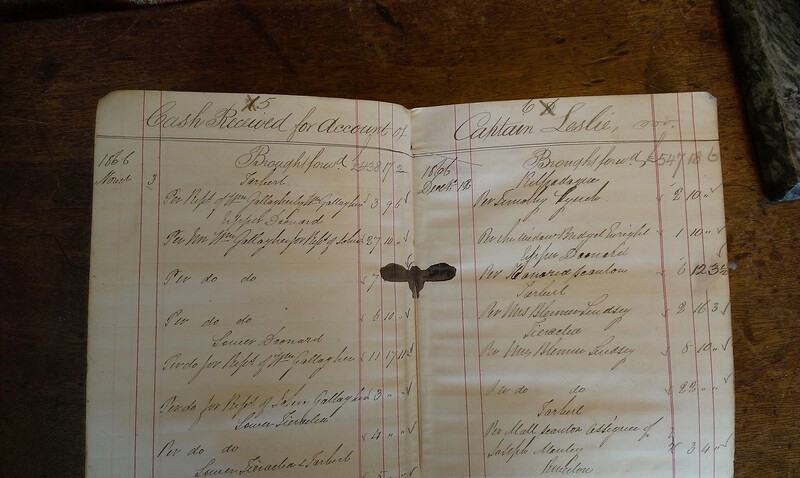 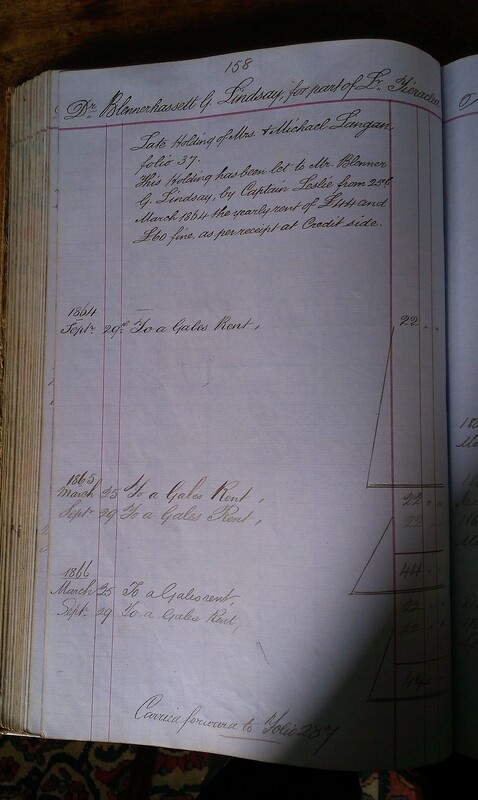 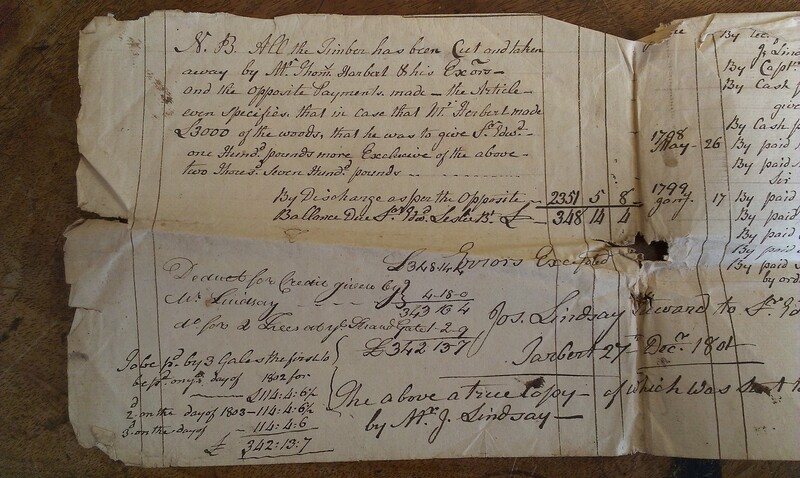 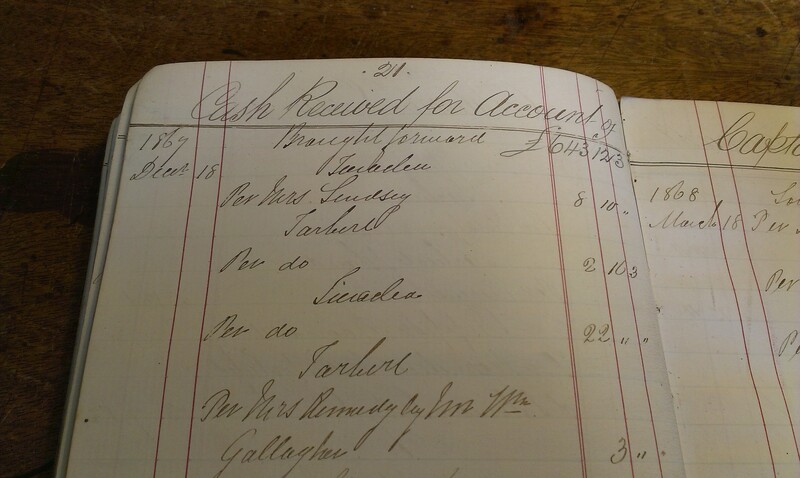 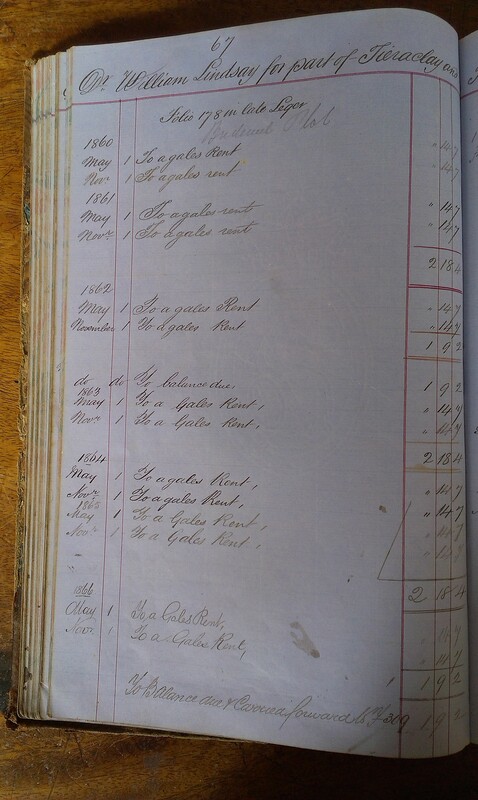 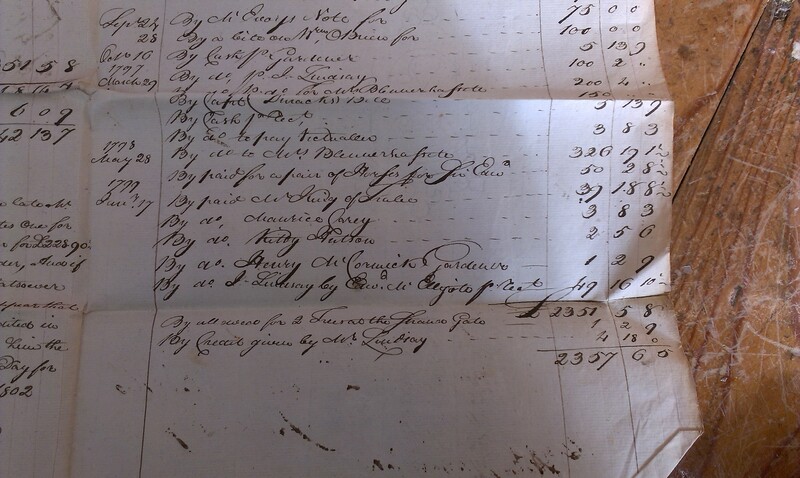 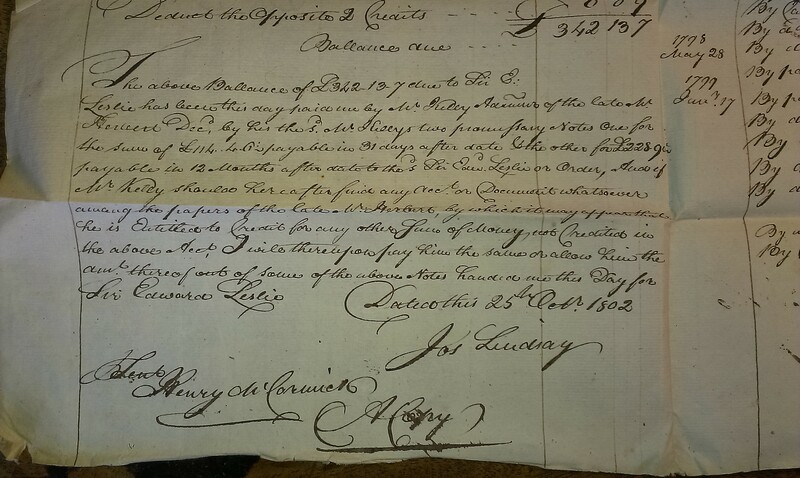 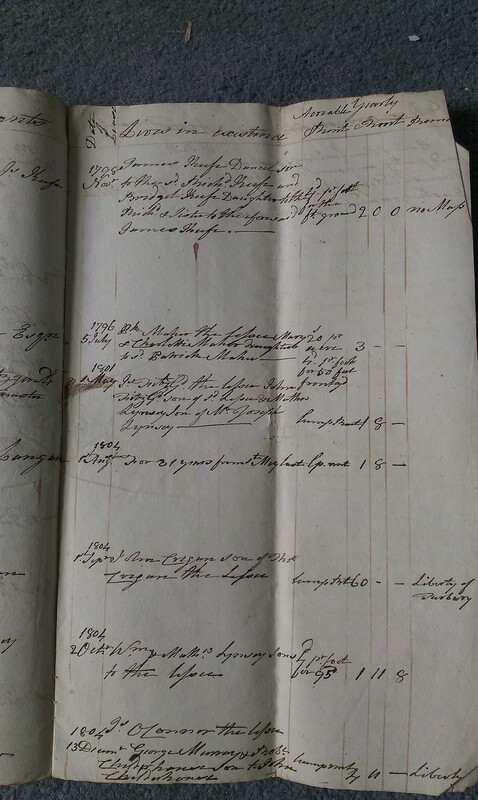 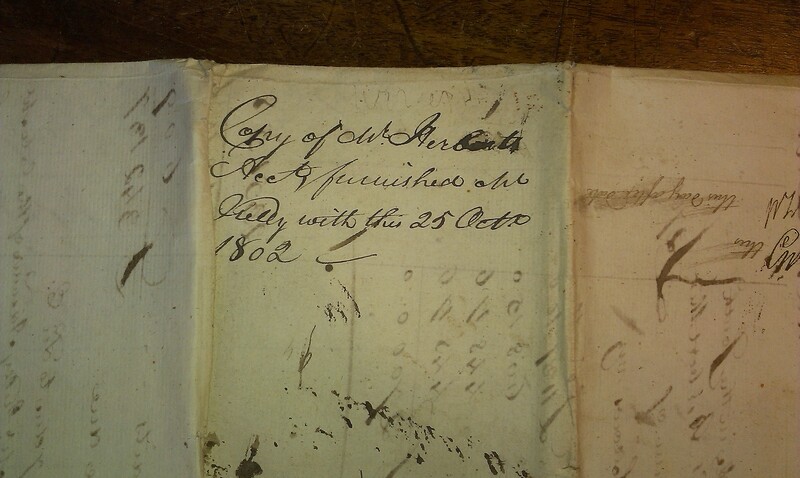 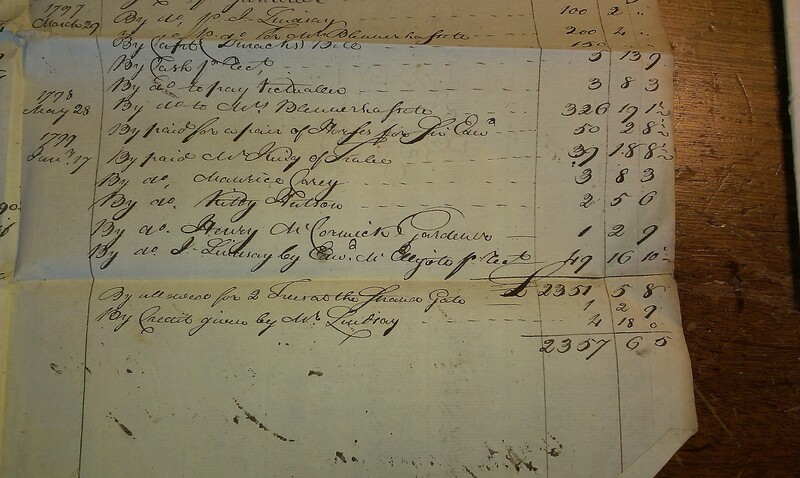 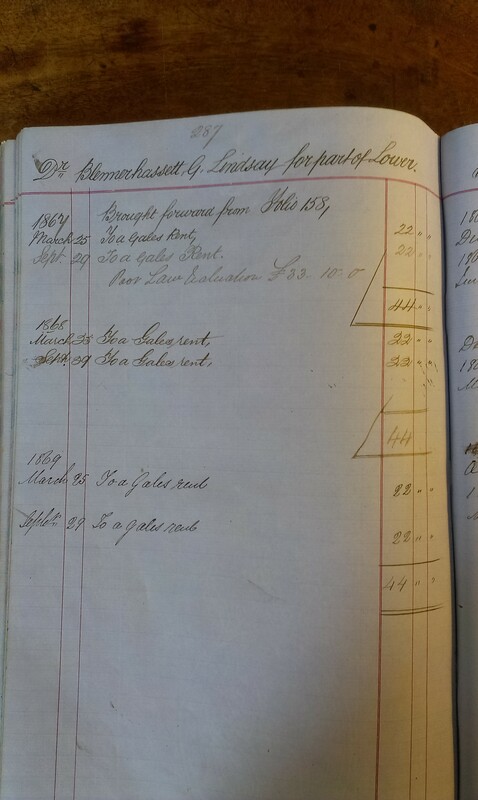 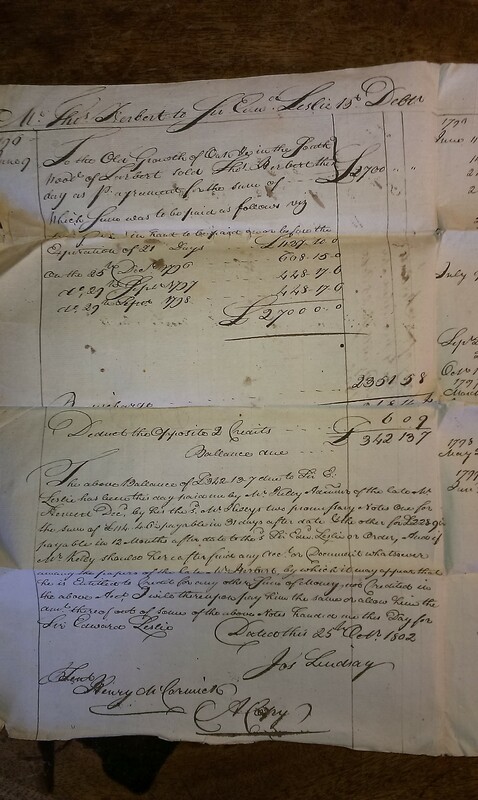 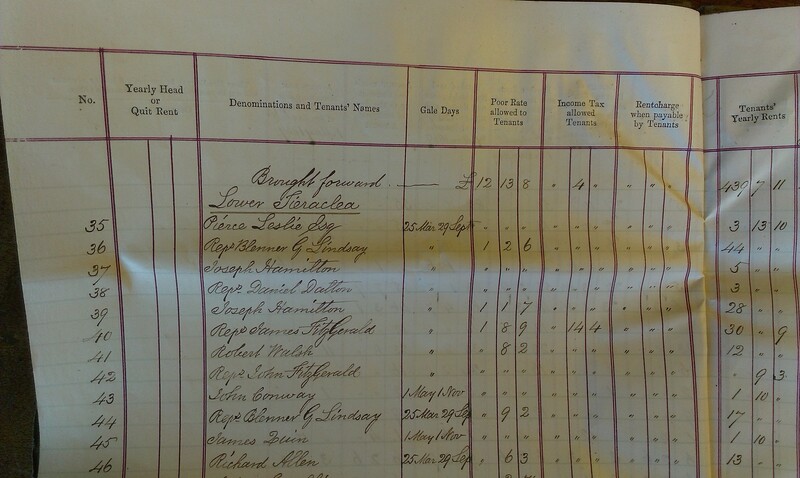 1870-79 accounts for William Lindsay heirs. 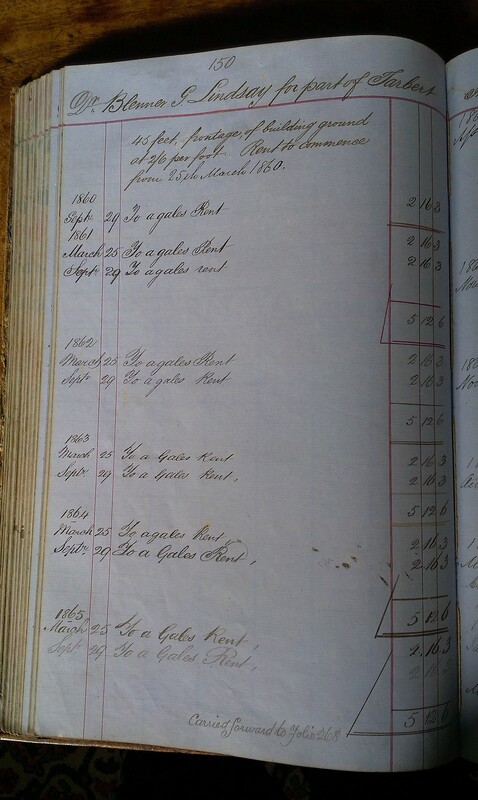 Page 67. 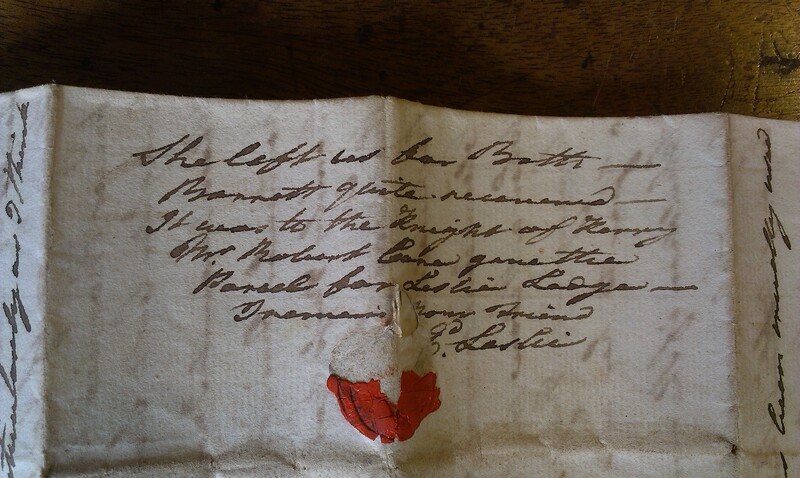 See LHS and RHS. 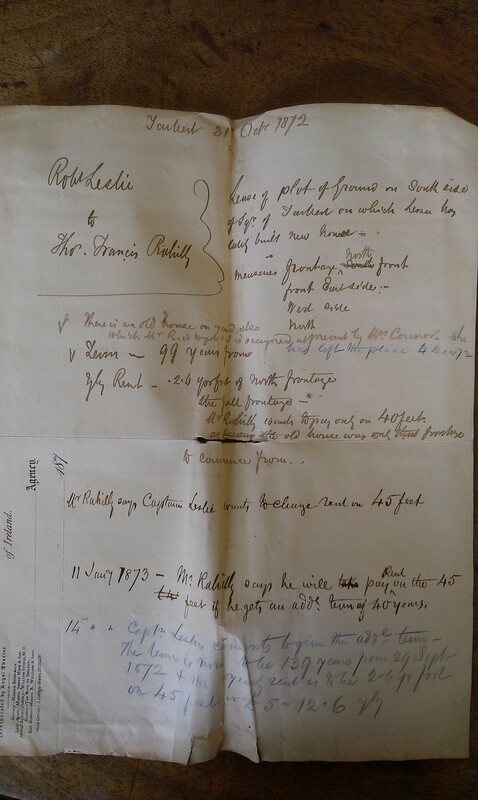 Refers to Thomas Francis Rahilly account 1878. 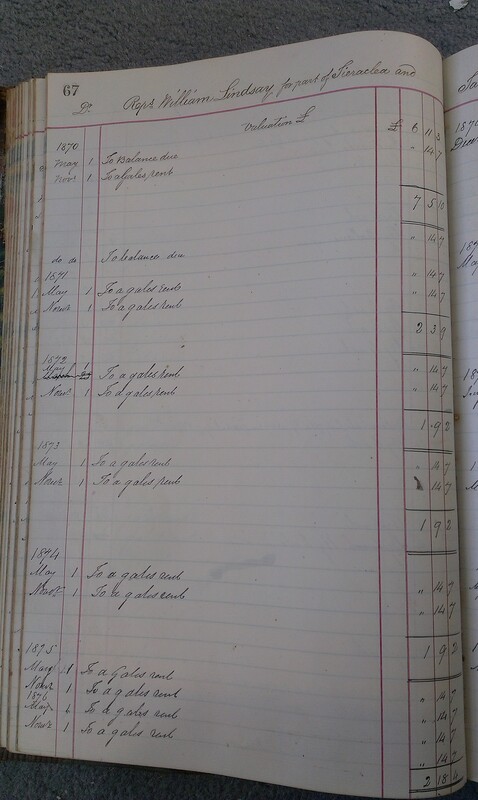 Page 78. 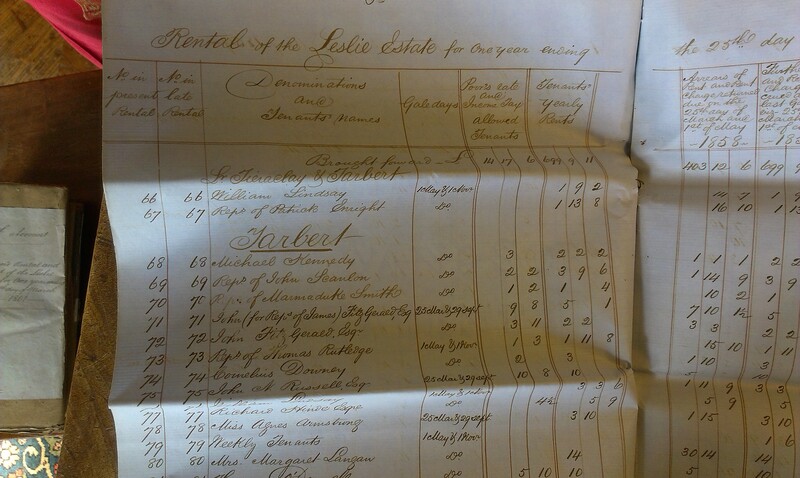 See LHS and RHS. 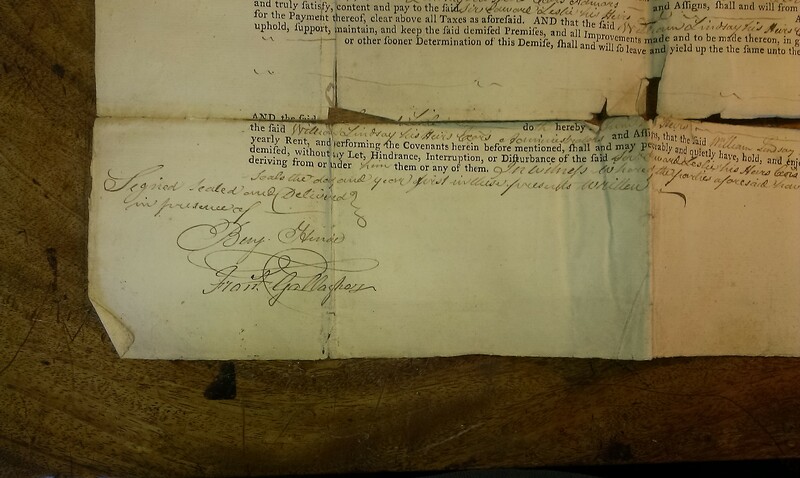 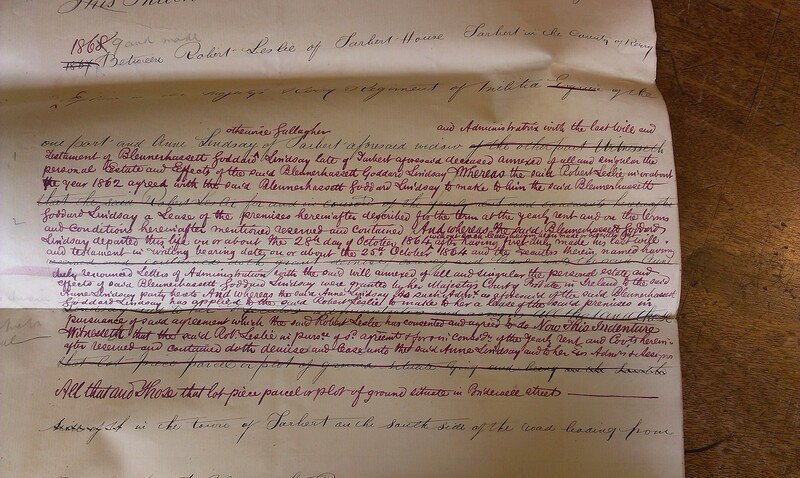 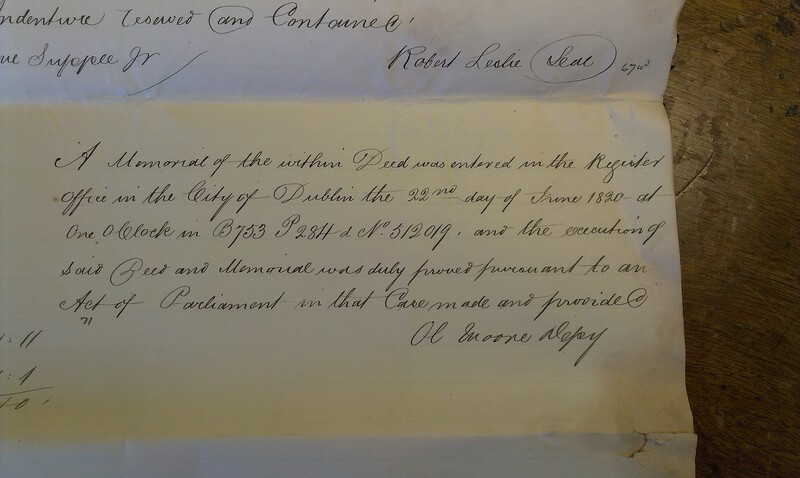 Refers to property being let to Thomas Francis Rahilly on 29 Sept 1872. 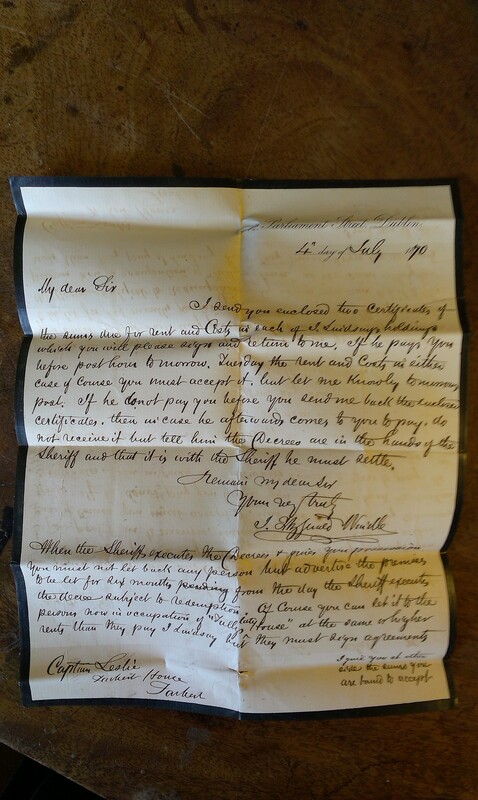 Letter of 14 June 1870. 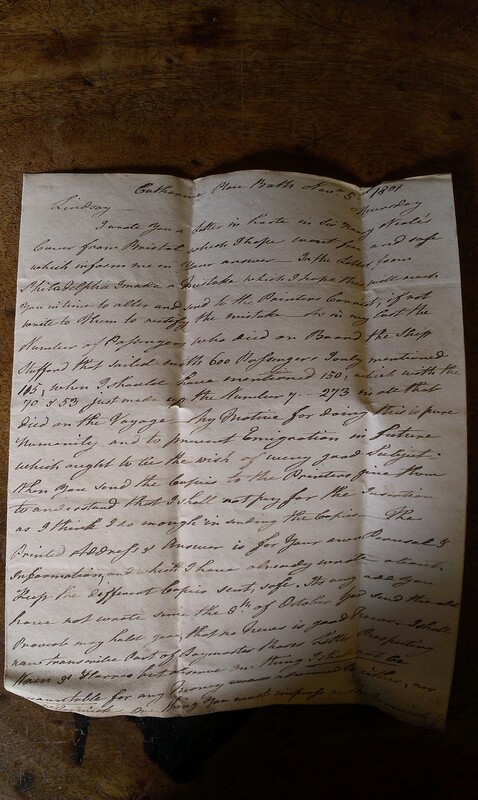 Letter of 4 July 1870. 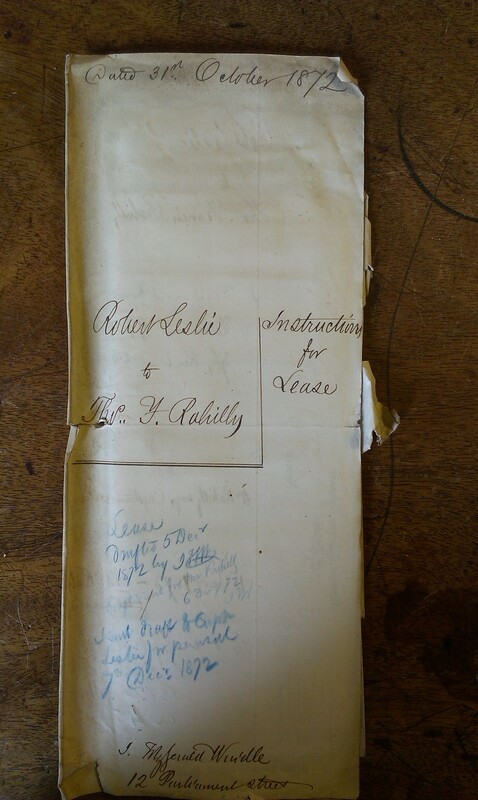 See cover and p.1 and back. 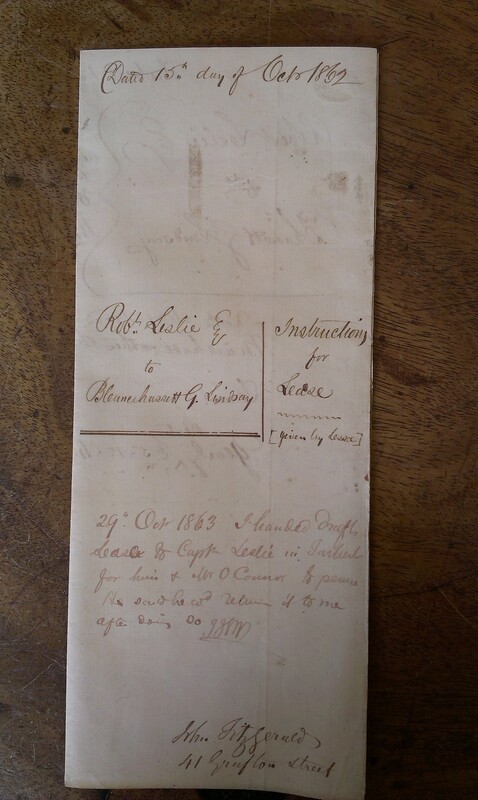 Instructions for lease, Robert Leslie to Thomas Francis Rahilly, 31 Oct 1872. 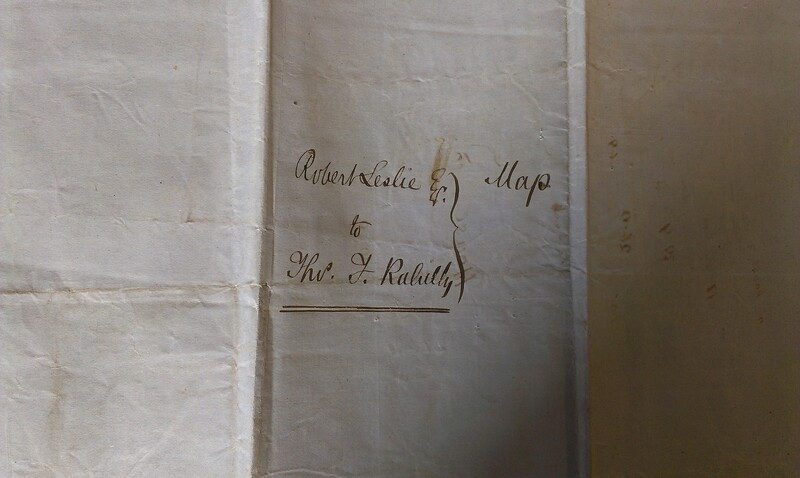 See map dated 4 Dec 1872. 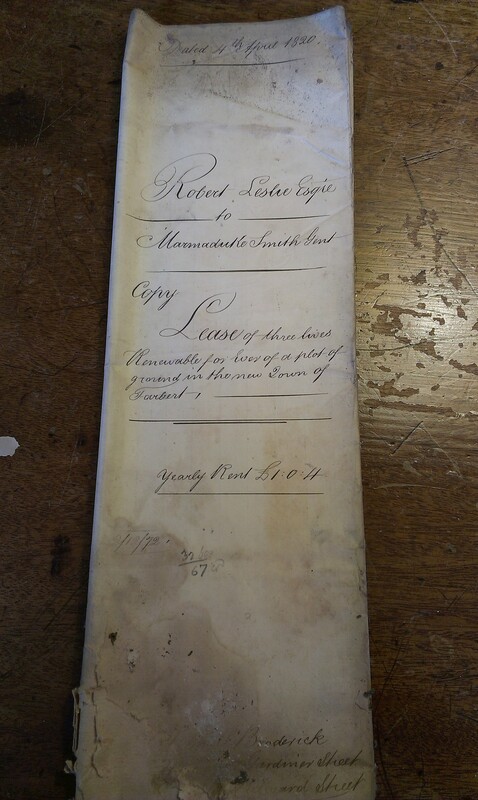 And cover. 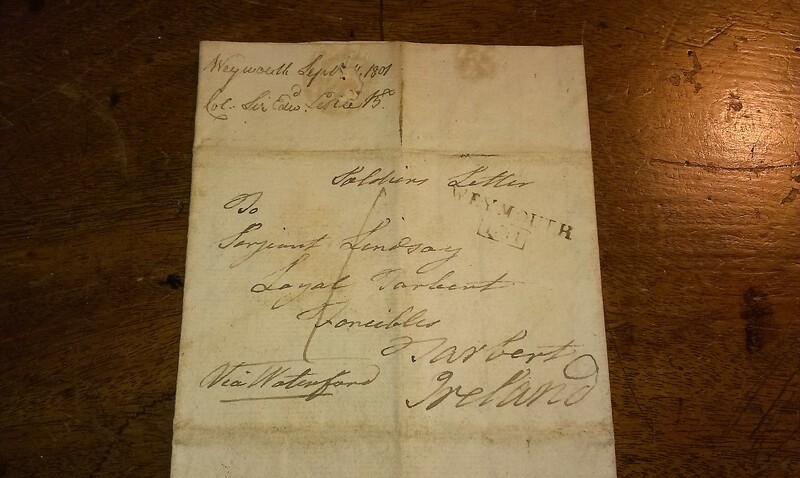 Letter of 15 (think Jan) 1873. 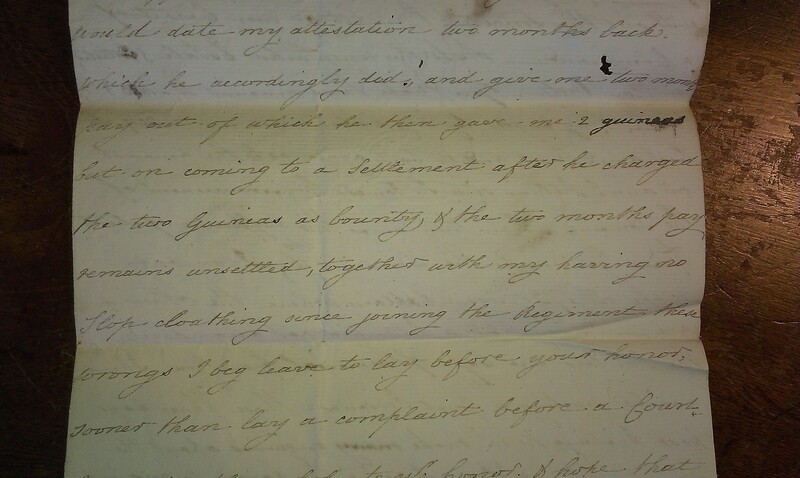 Letter to Windle, solicitor for Leslie, from Mary Smith. 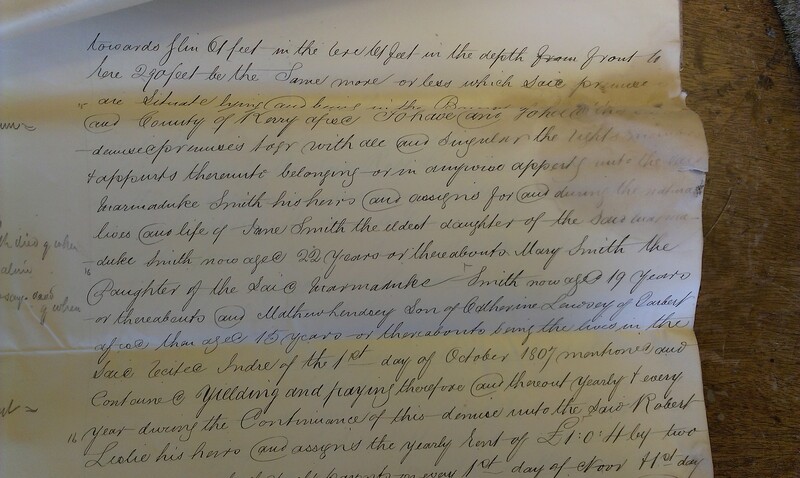 About her title to her father's lease after death of her sister Jane Smith in 1871. 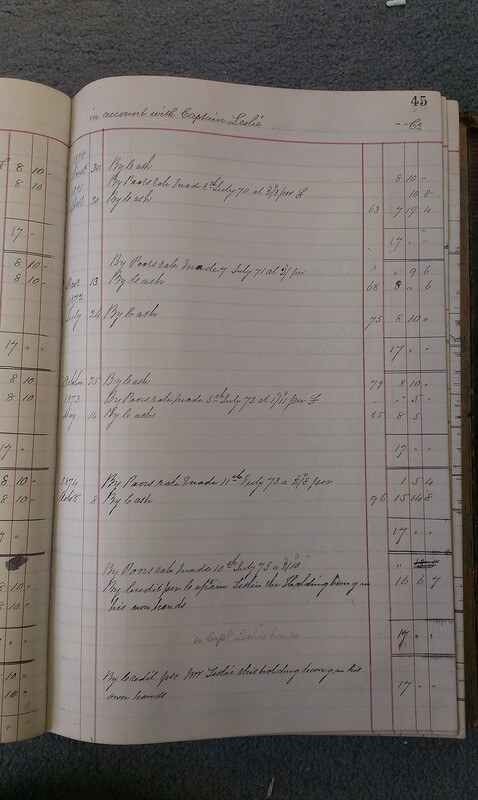 See p.1 and p.2 and p.3 and p.4. 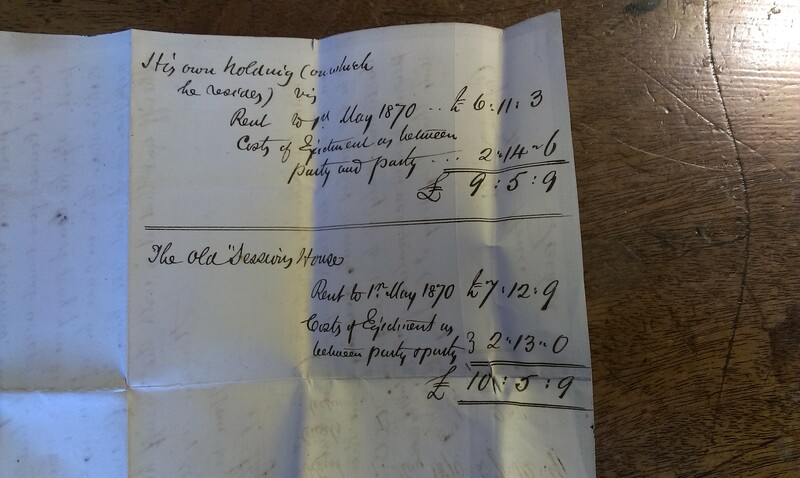 Amount due, dated 20 Apr 1873. 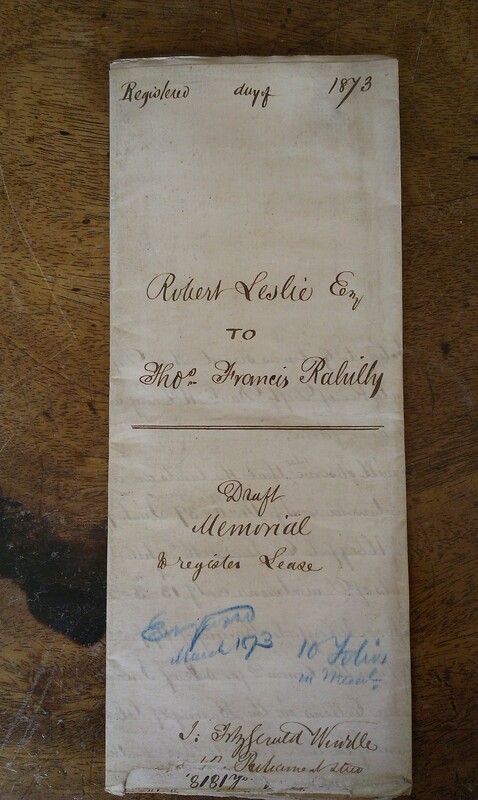 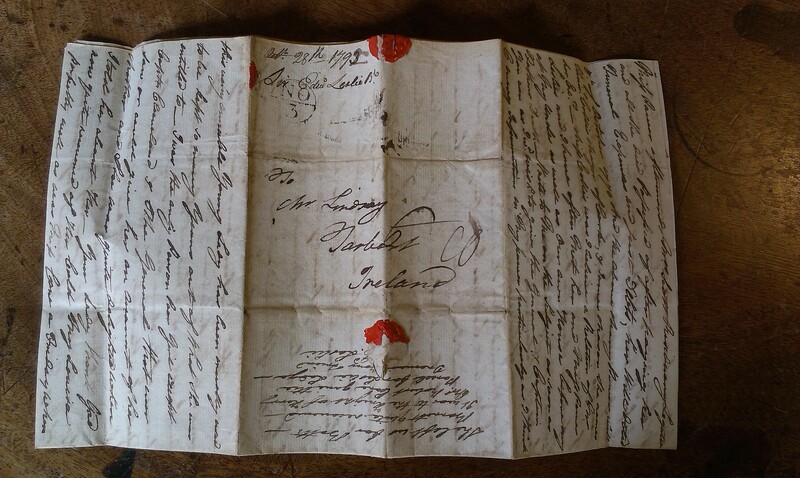 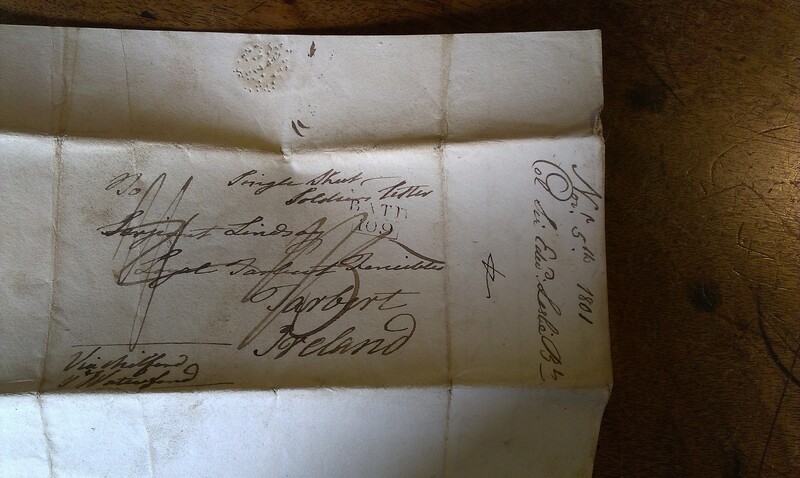 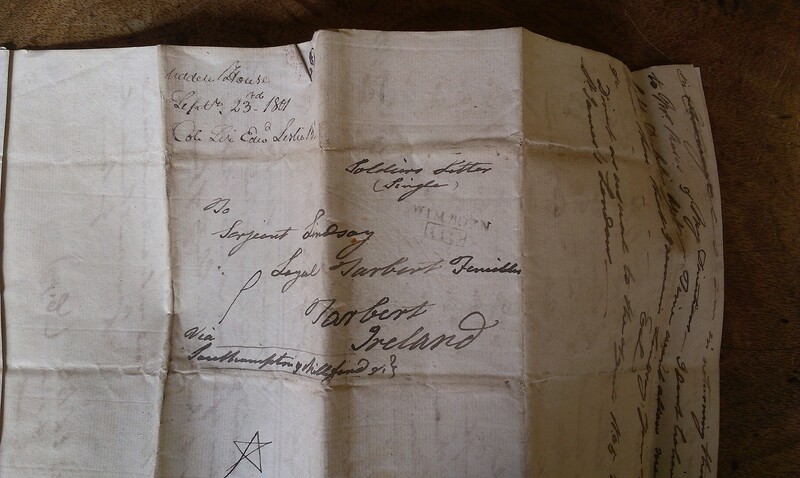 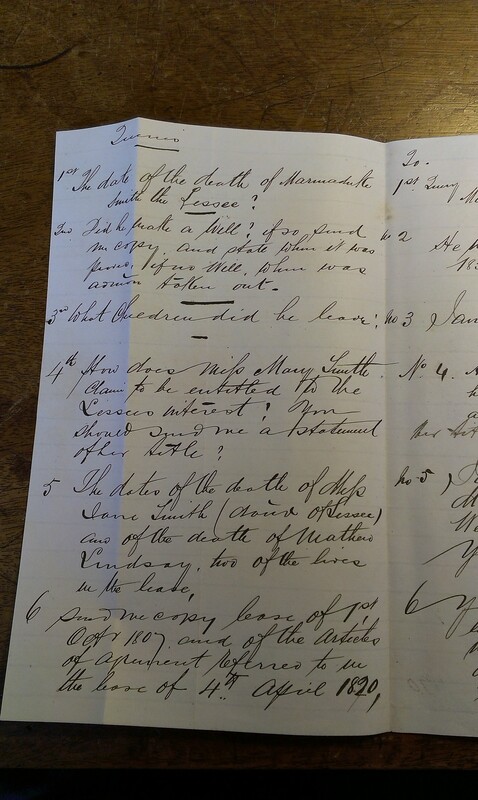 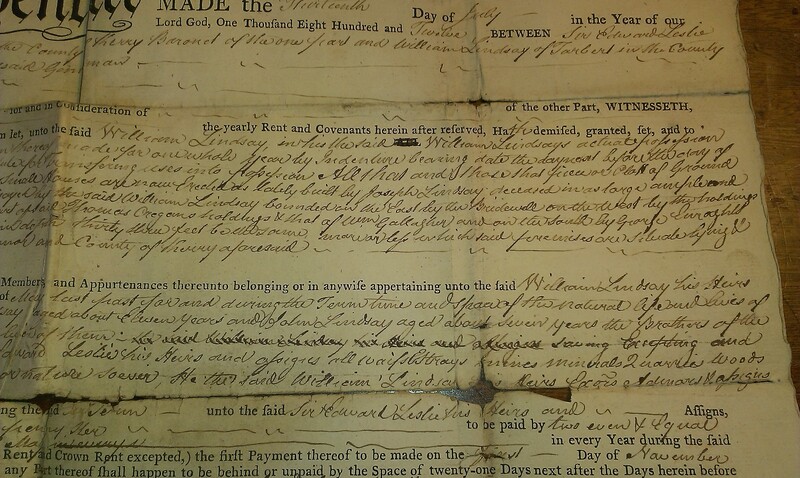 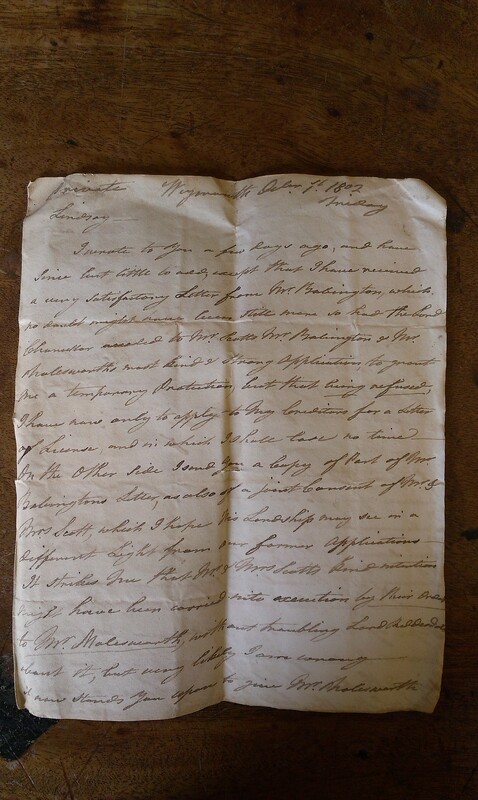 Draft deed, Robert Leslie to Thomas Francis Rahilly, 22 Mar 1873. 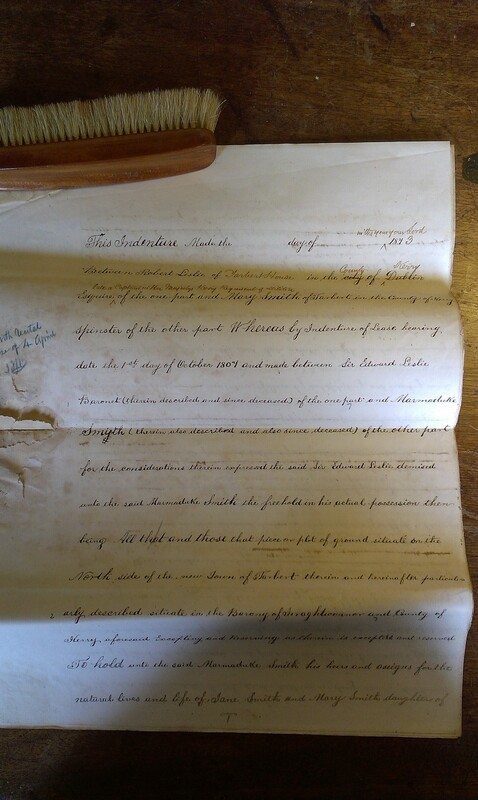 Draft deed of 21 Apr 1873. 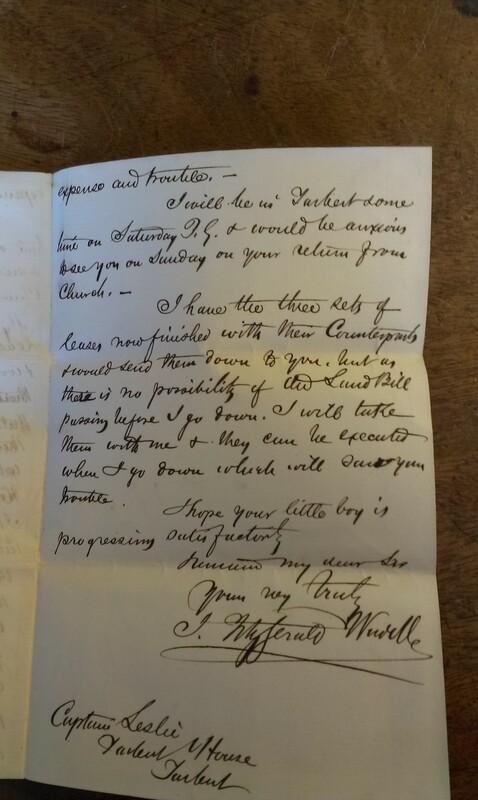 Robert Leslie to Mary Smith. 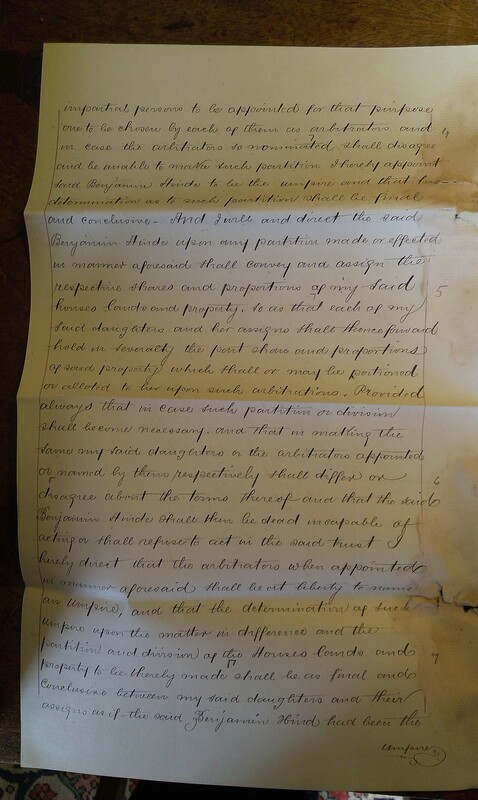 See p.1 and p.2 and p.3 and side note and p.4 and p.5 and end. 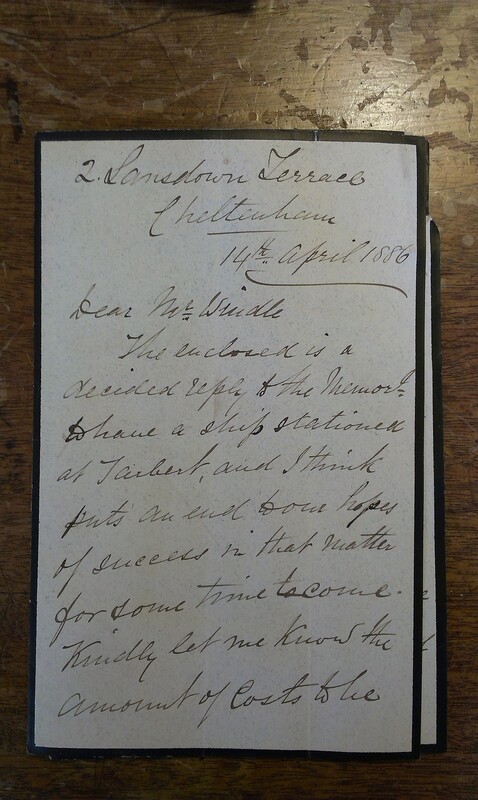 Letter of 14 Apr 1886 from Leslie to Windle, solicitor. Part of 1868 map of Leslie estate.